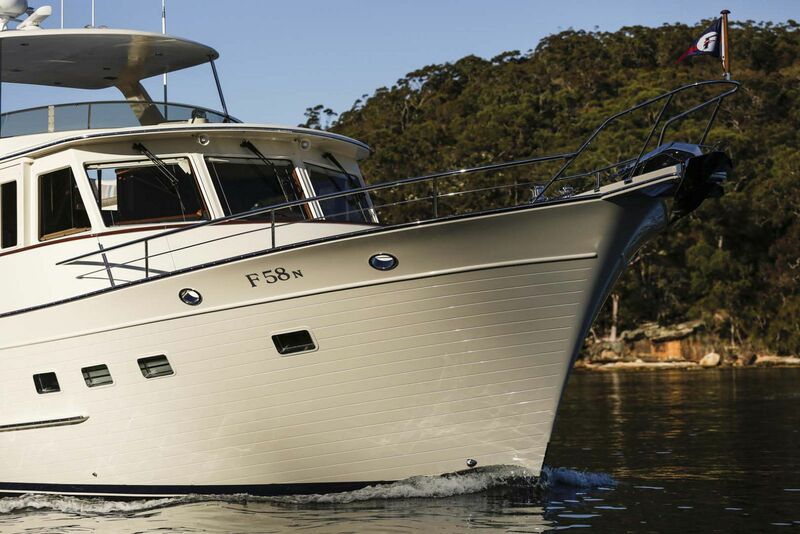 On the 25th anniversary of the founding of the company, Fleming Yachts were proud to announce the introduction of the all-new Fleming 58. 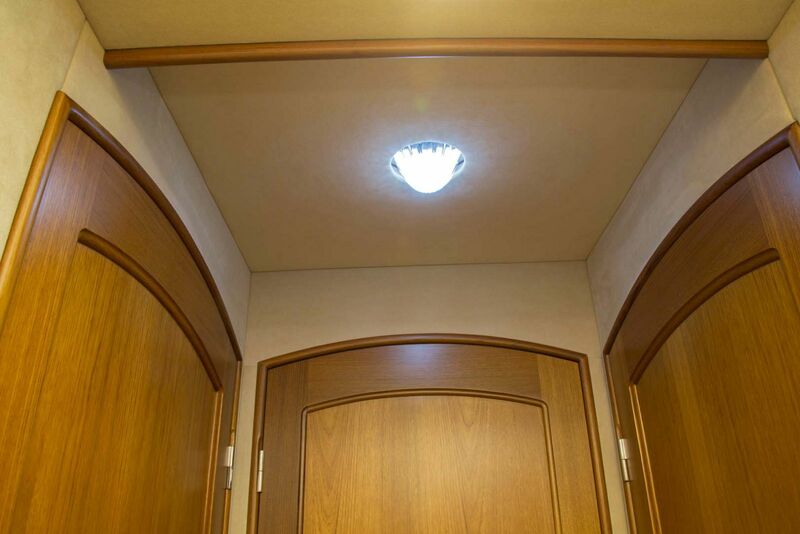 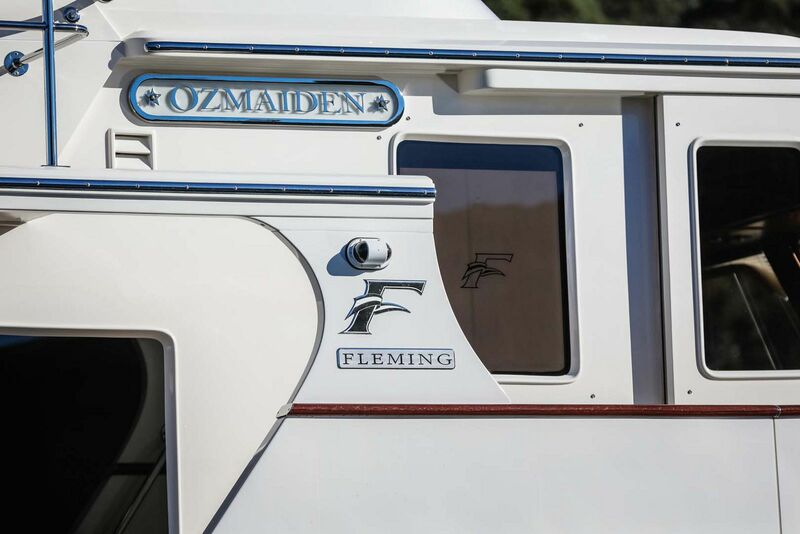 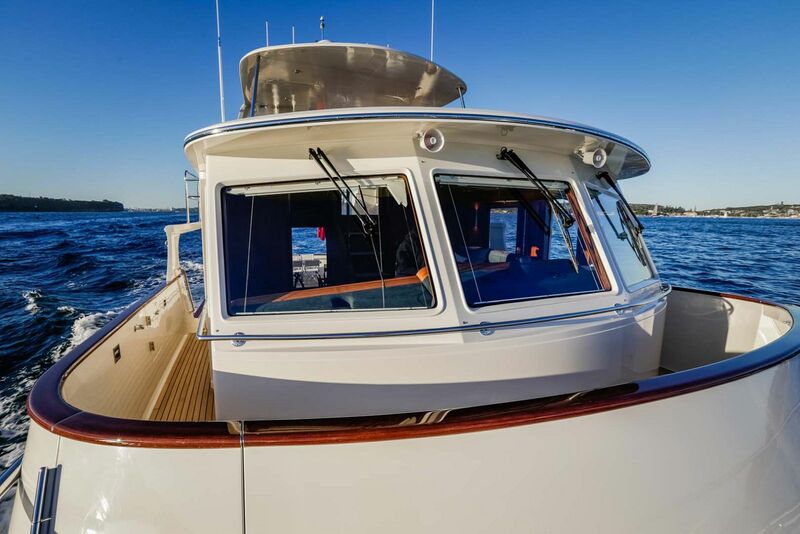 After extensive research and input from existing Fleming owners, we identified the need for a boat to bridge the gap between the Fleming 55 and the 65. 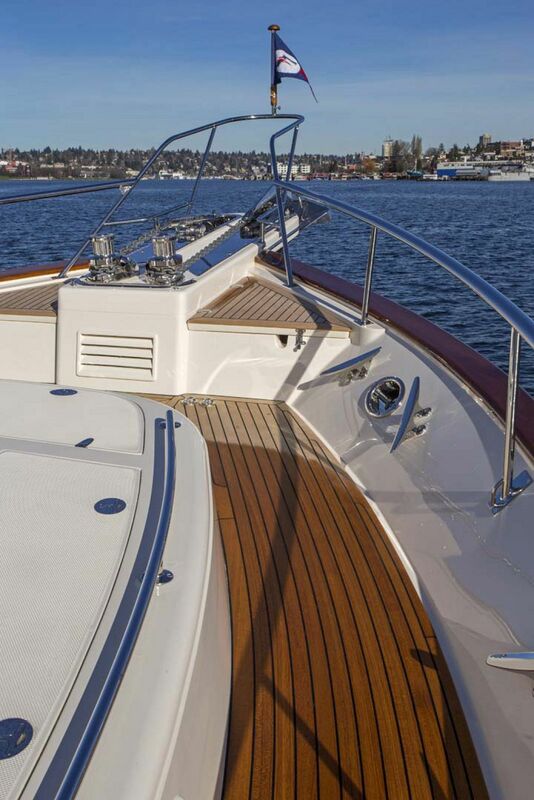 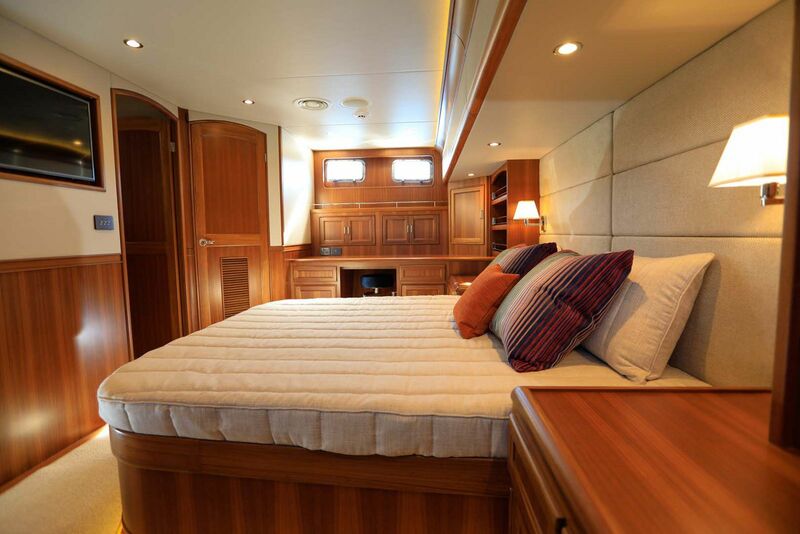 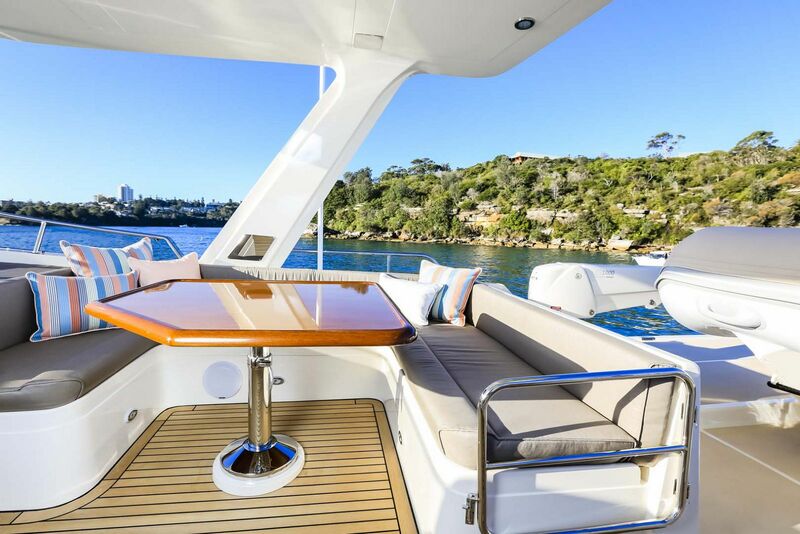 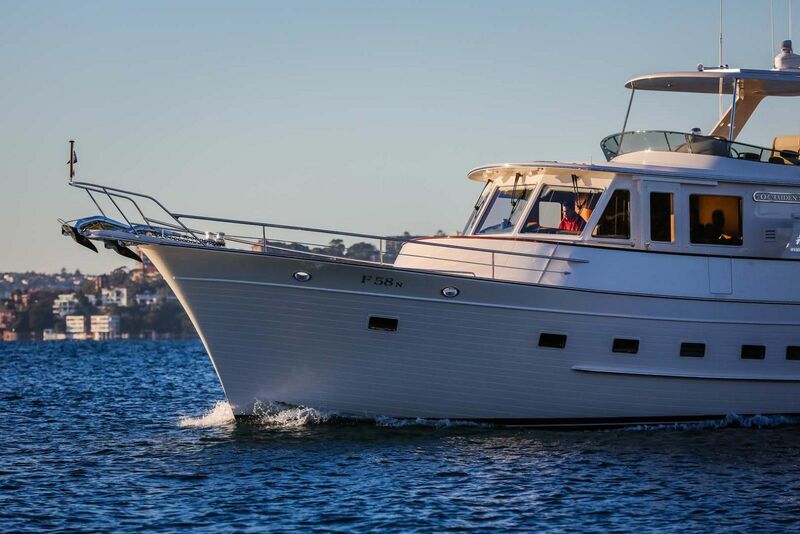 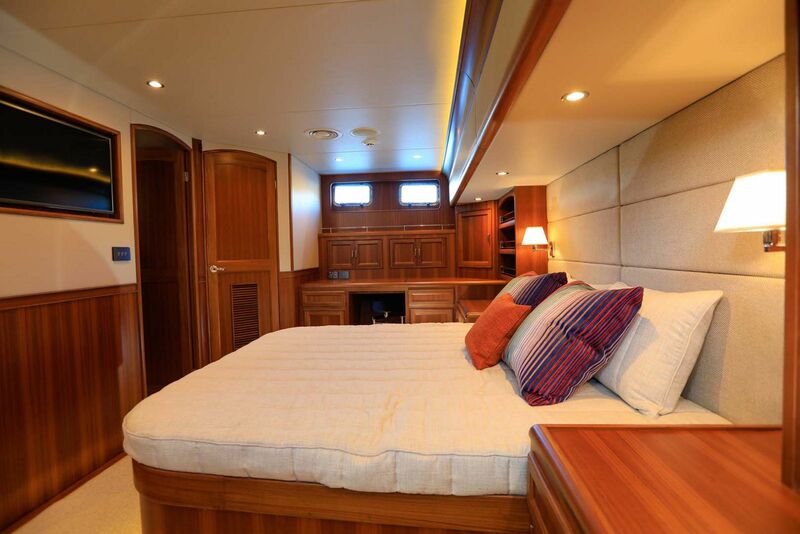 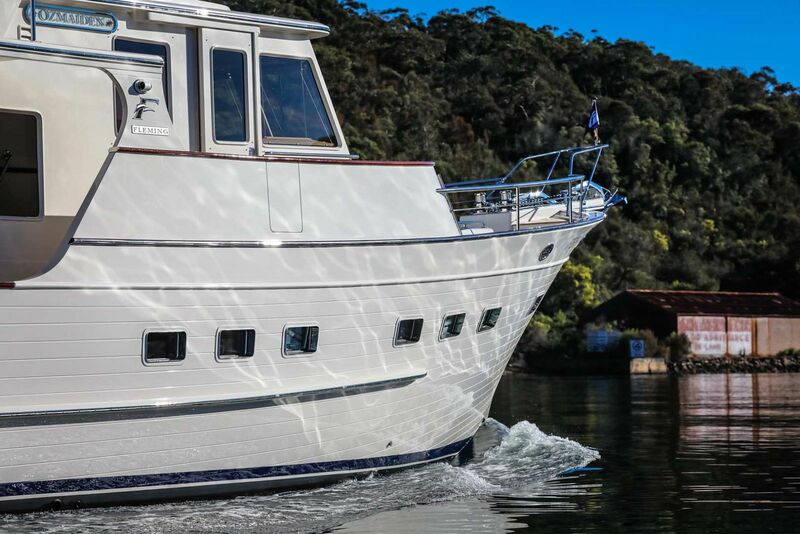 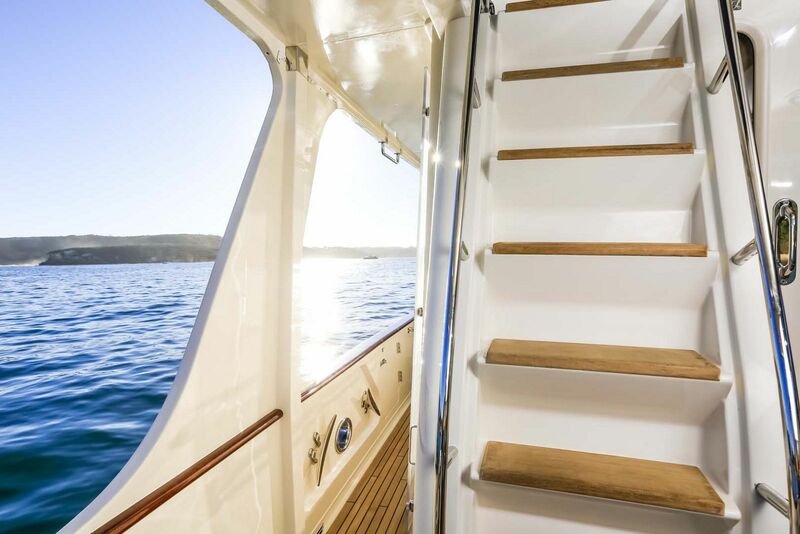 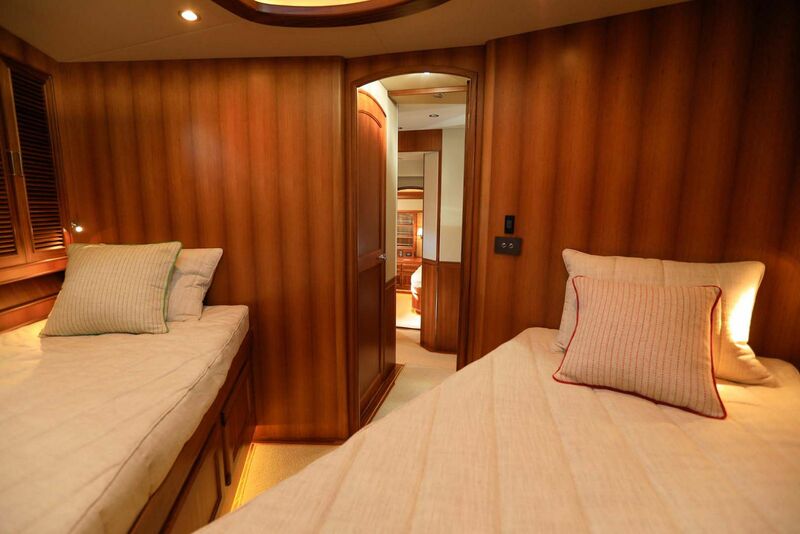 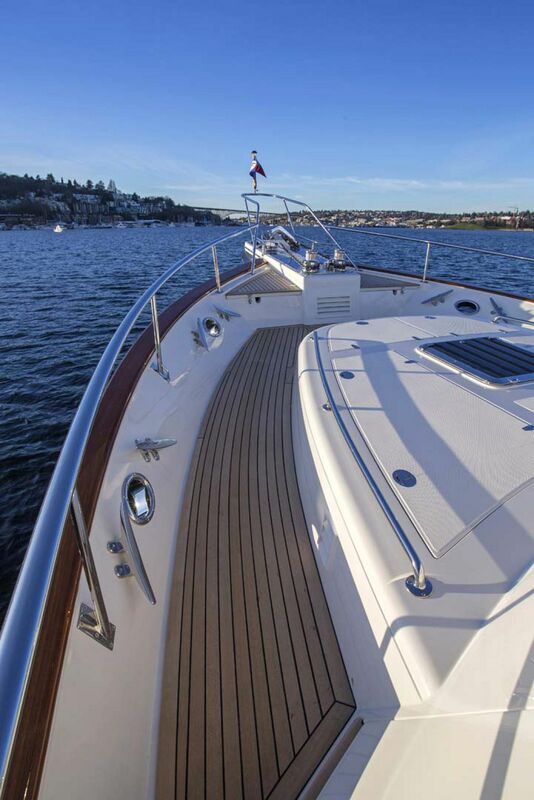 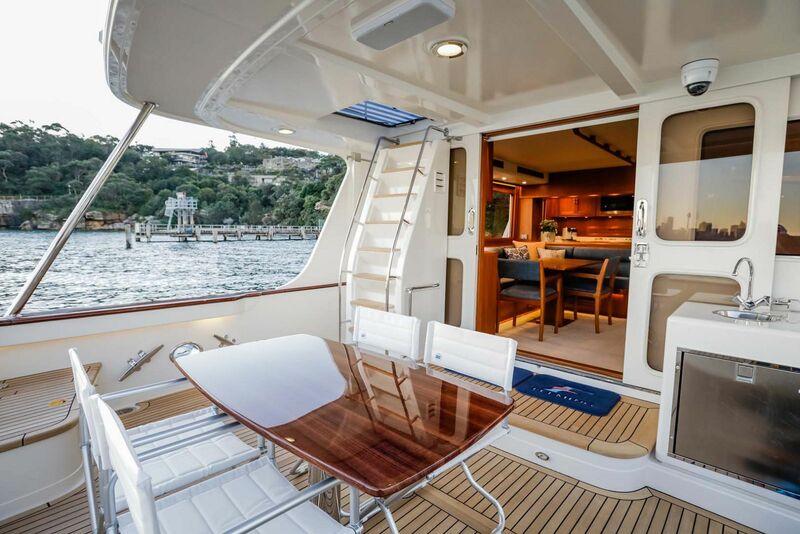 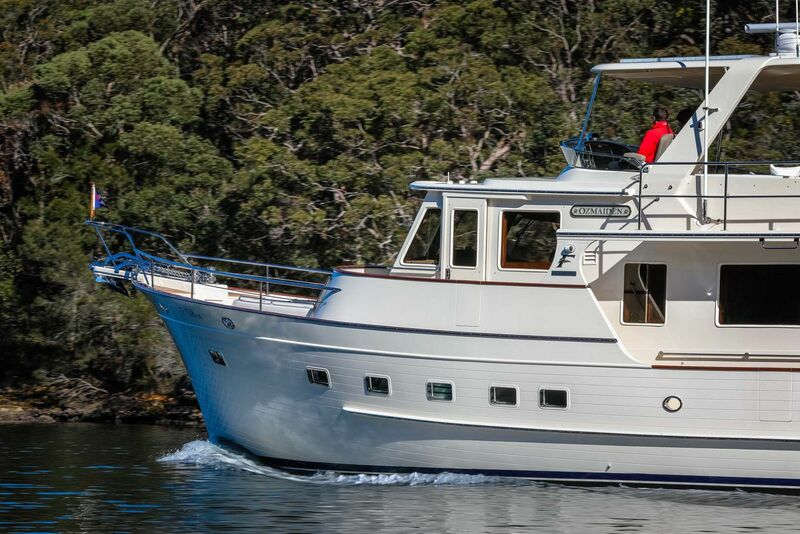 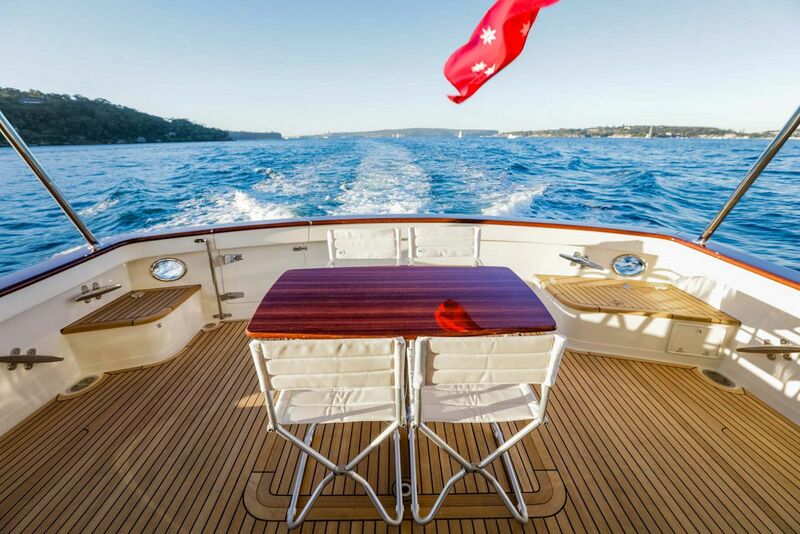 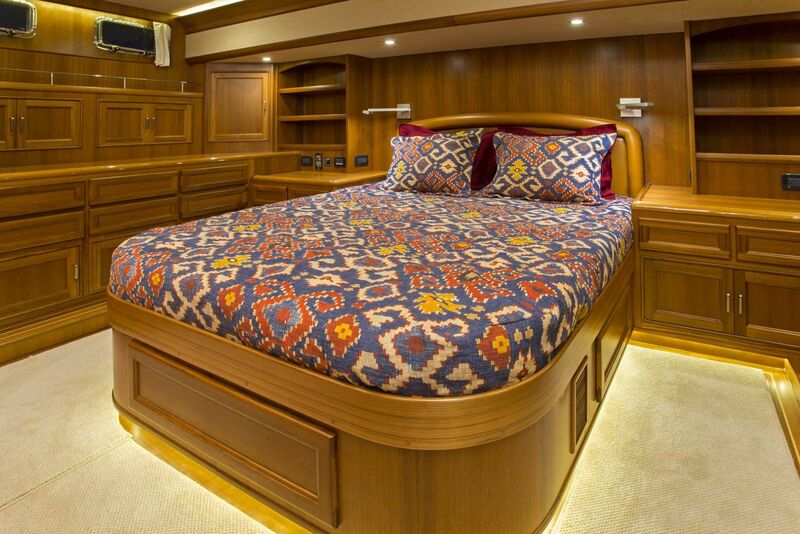 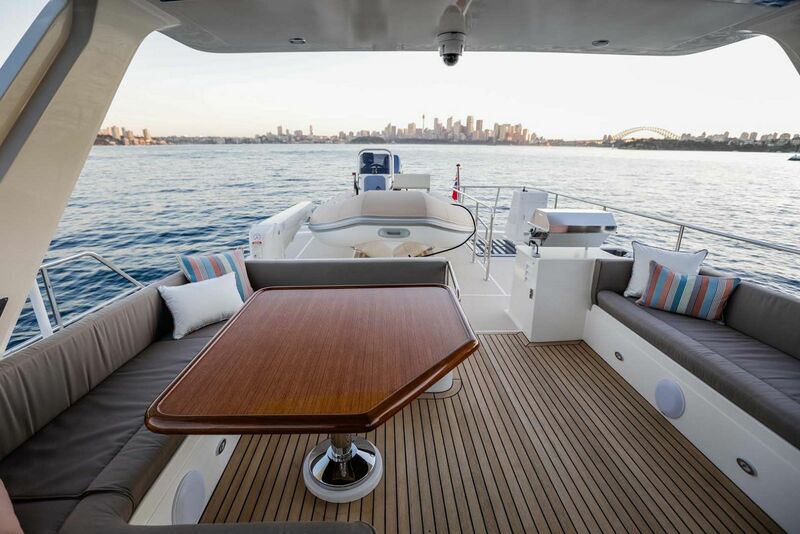 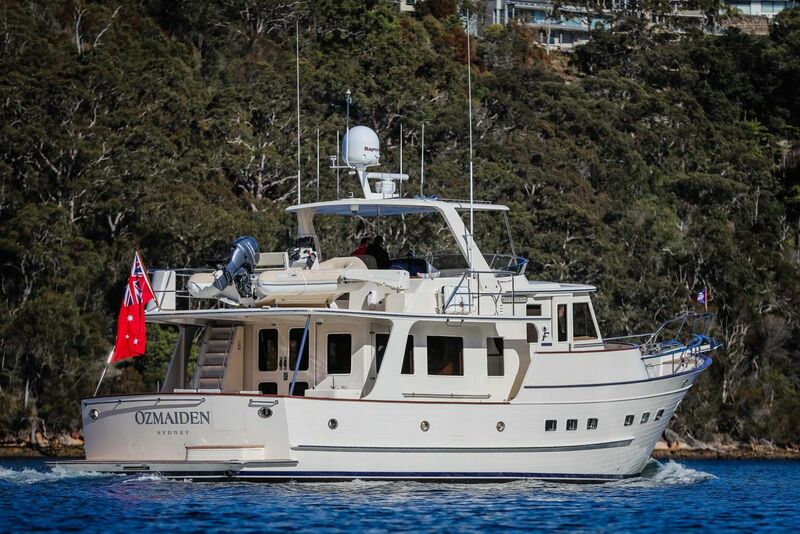 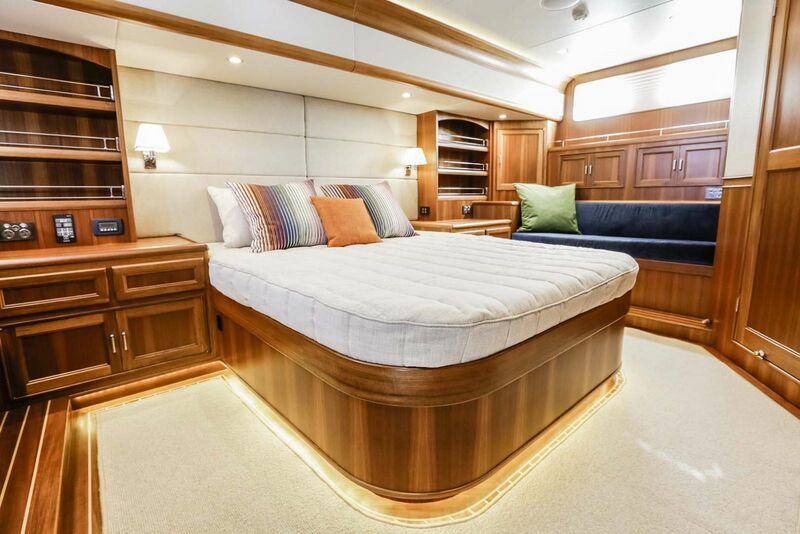 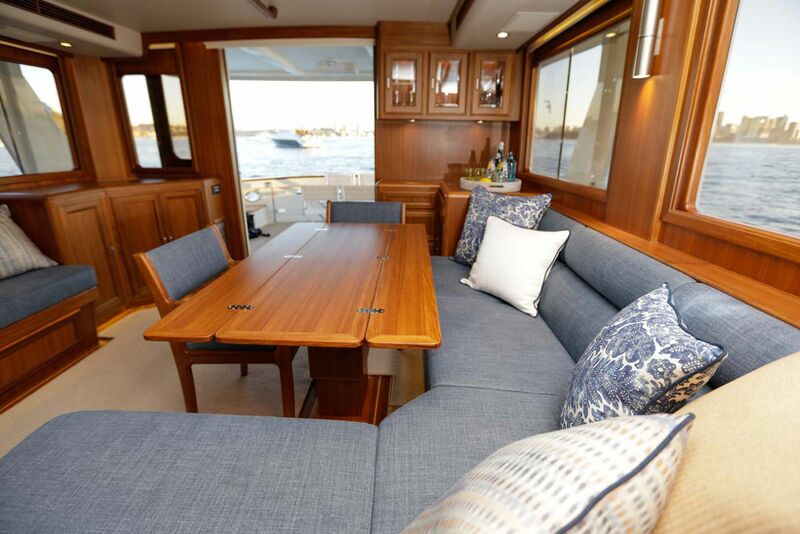 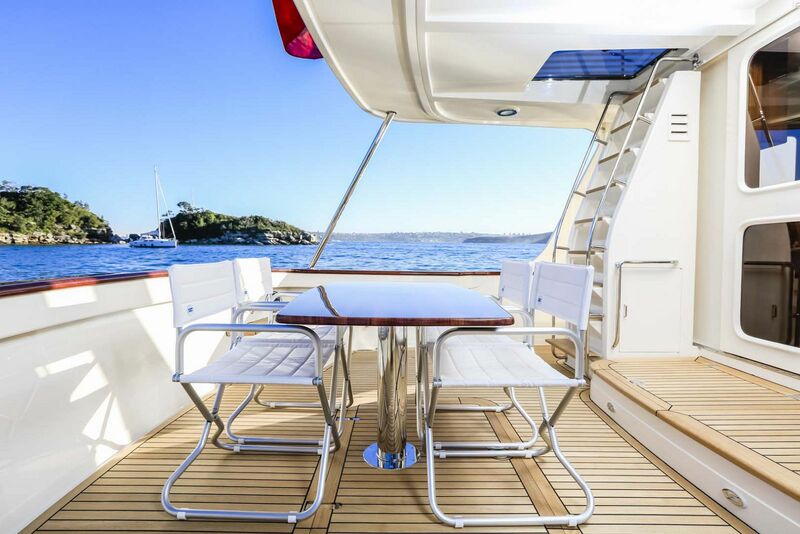 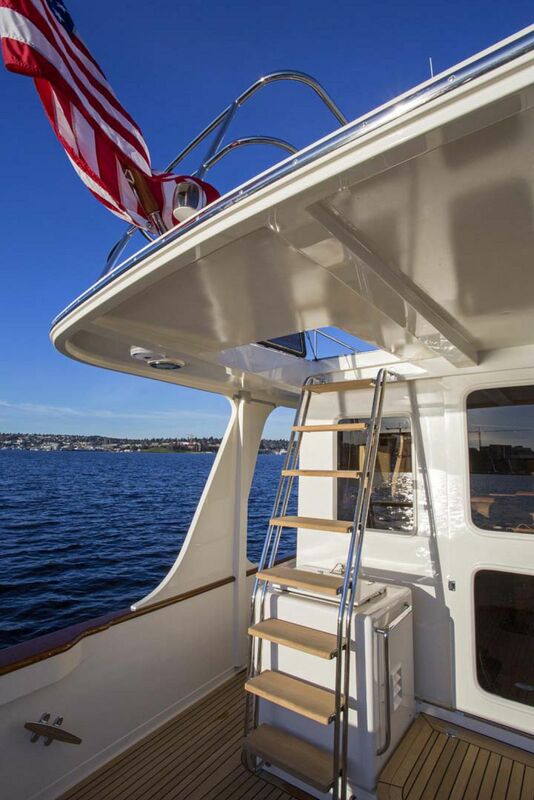 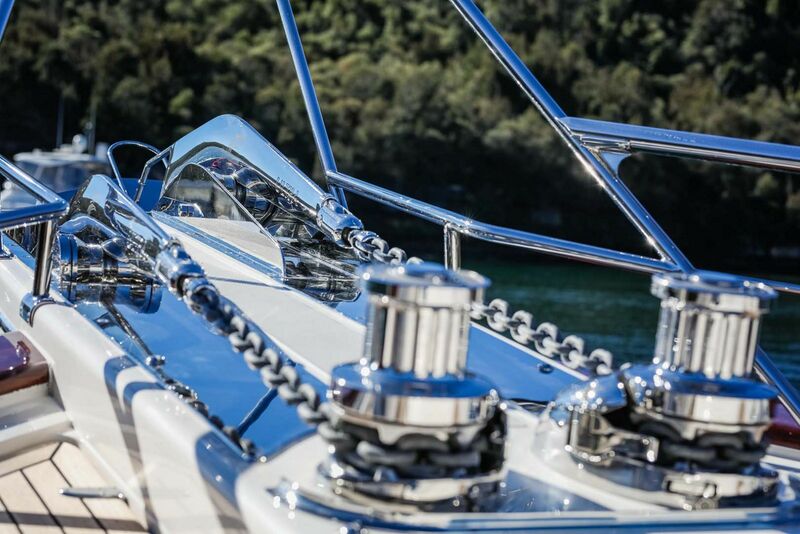 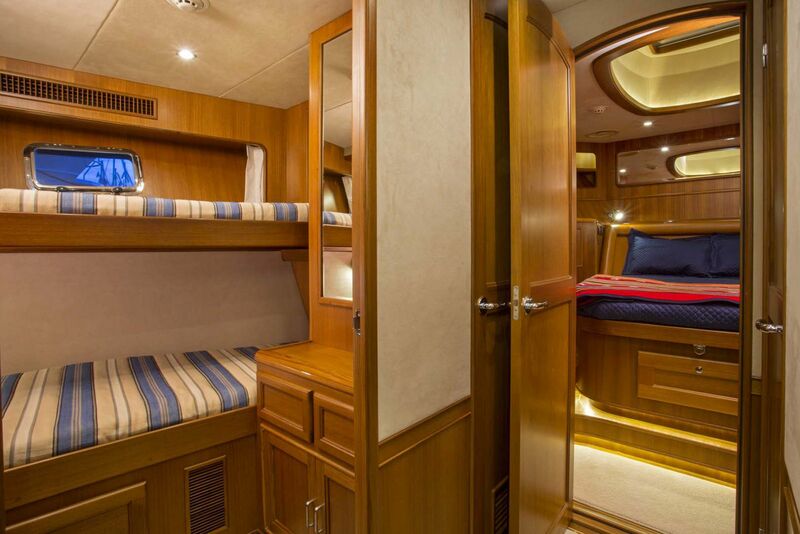 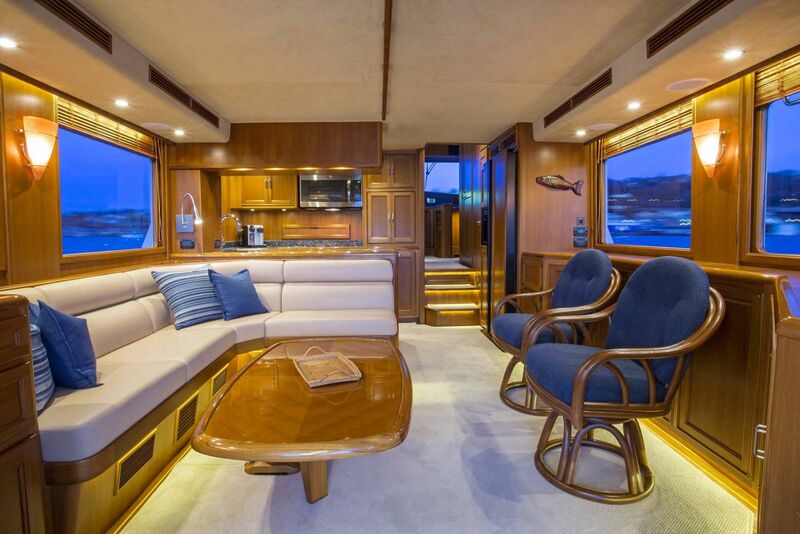 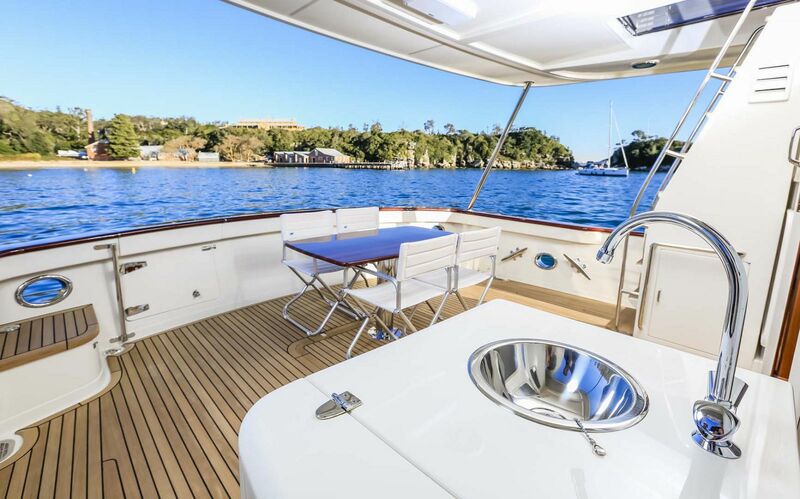 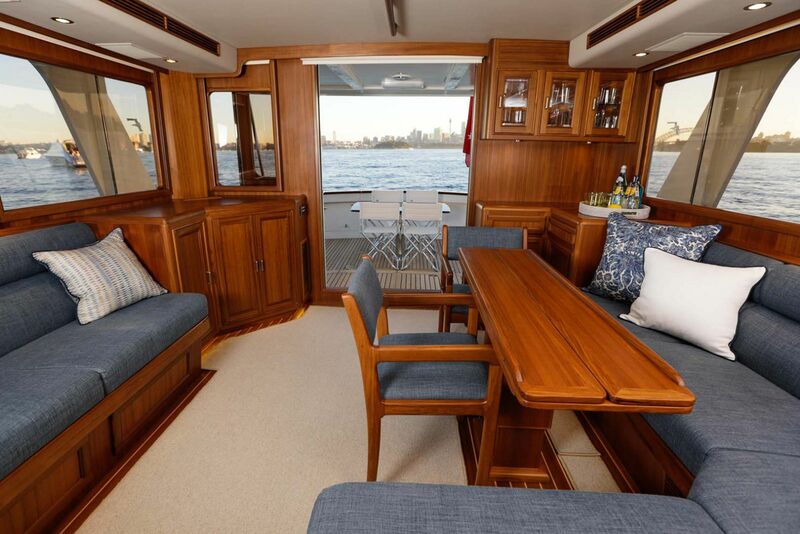 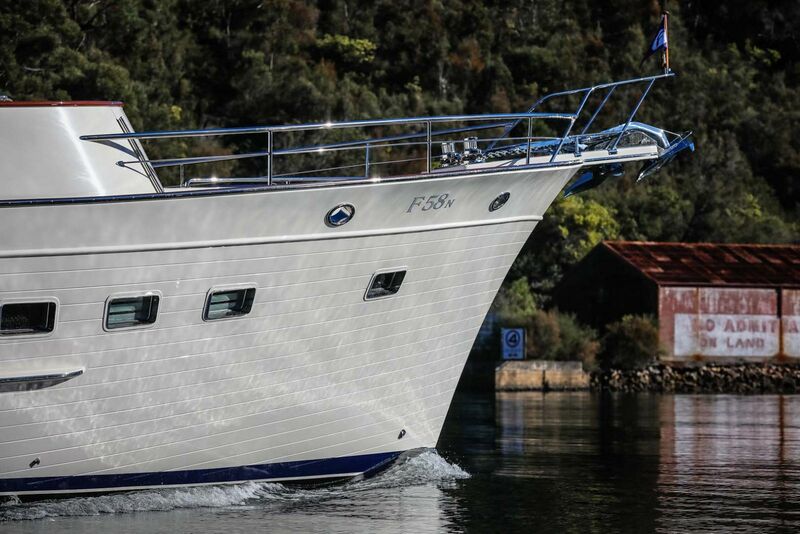 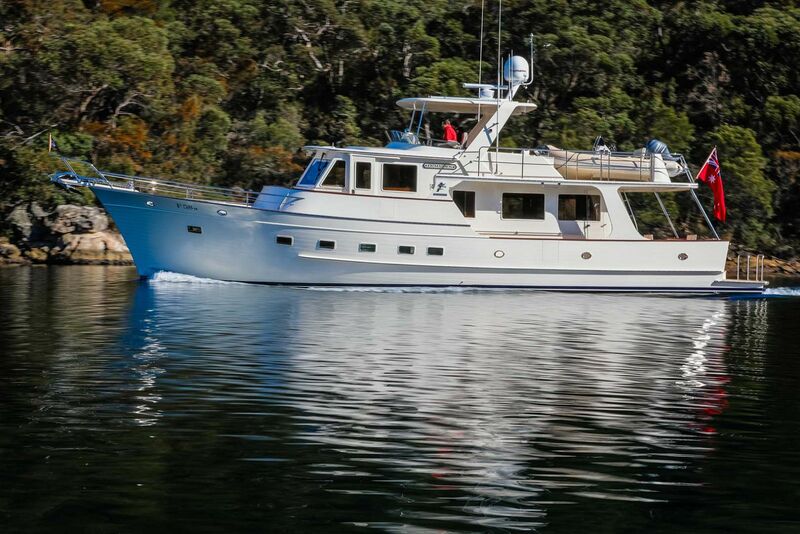 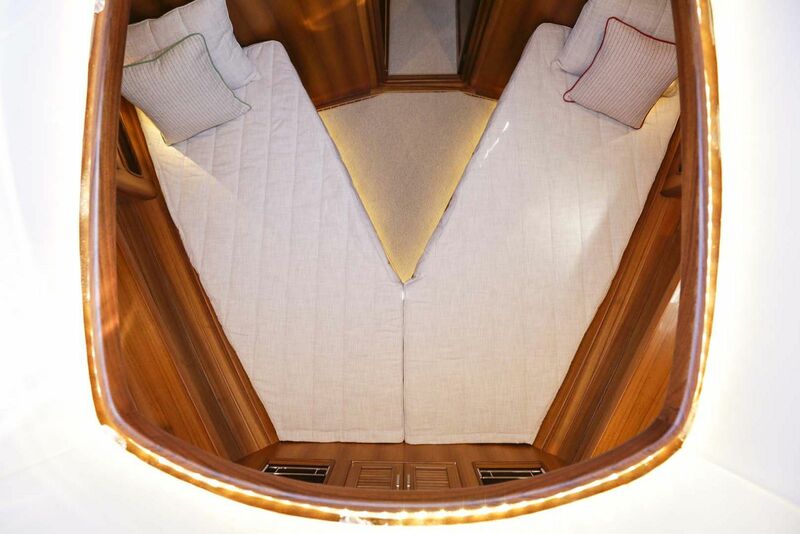 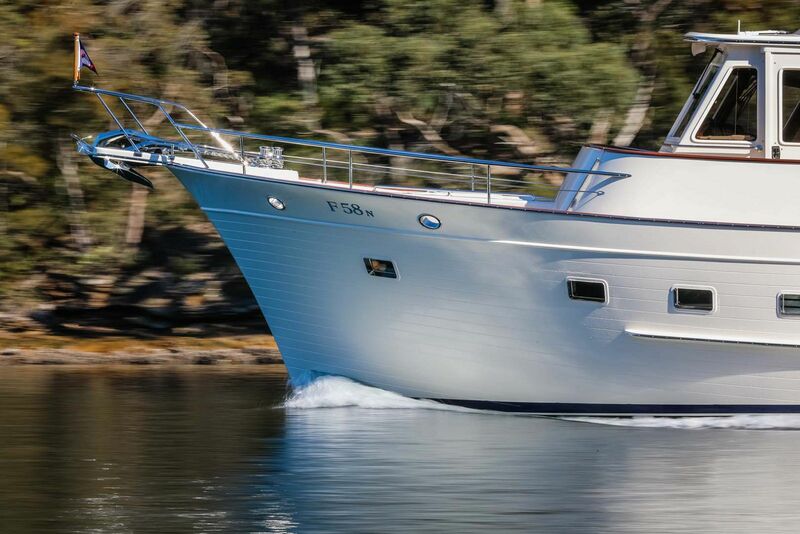 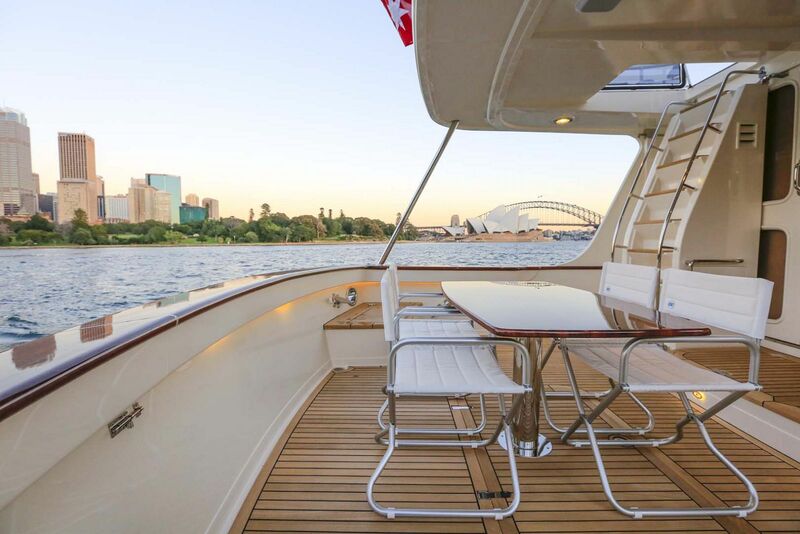 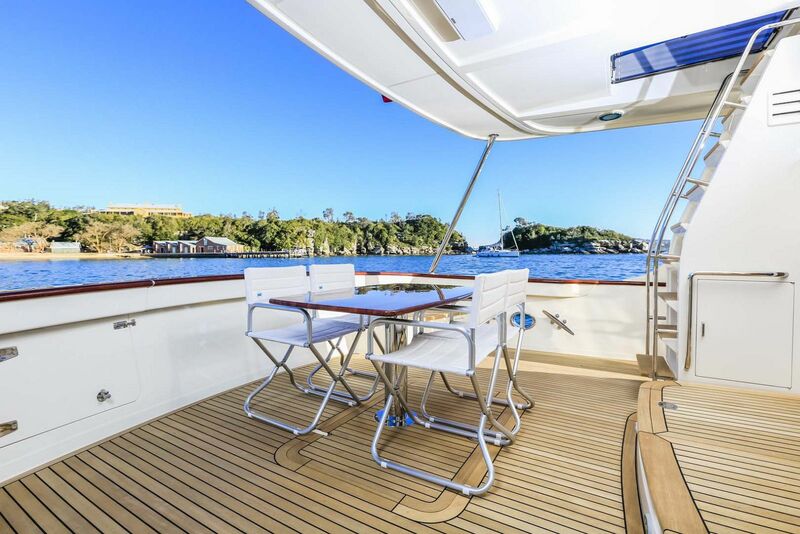 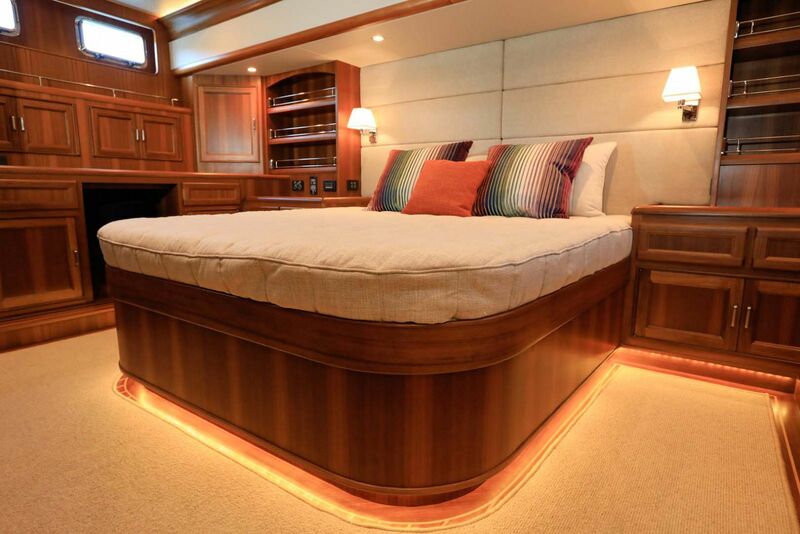 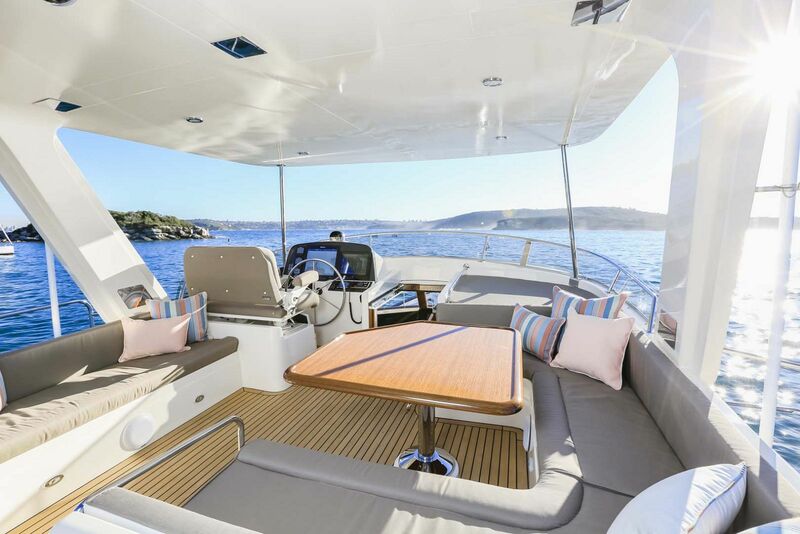 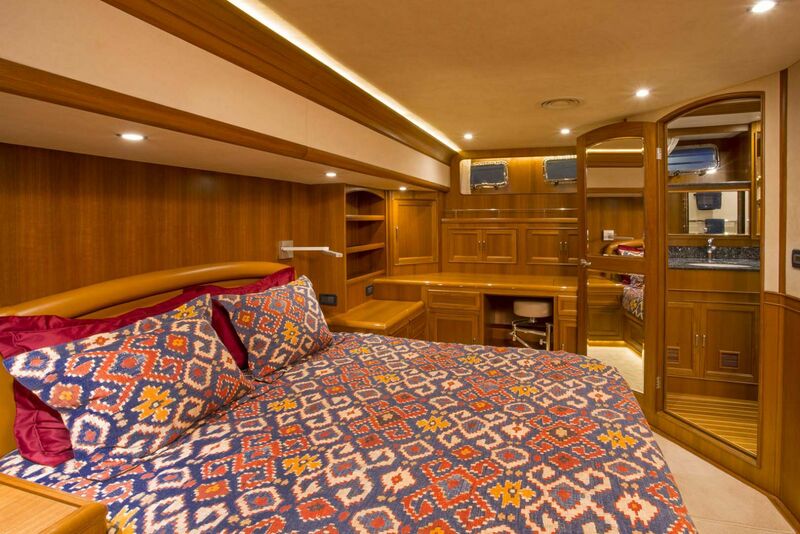 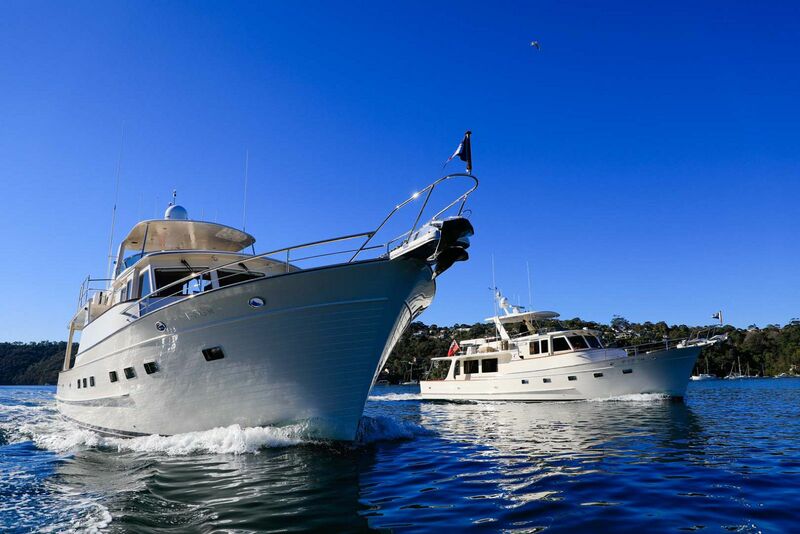 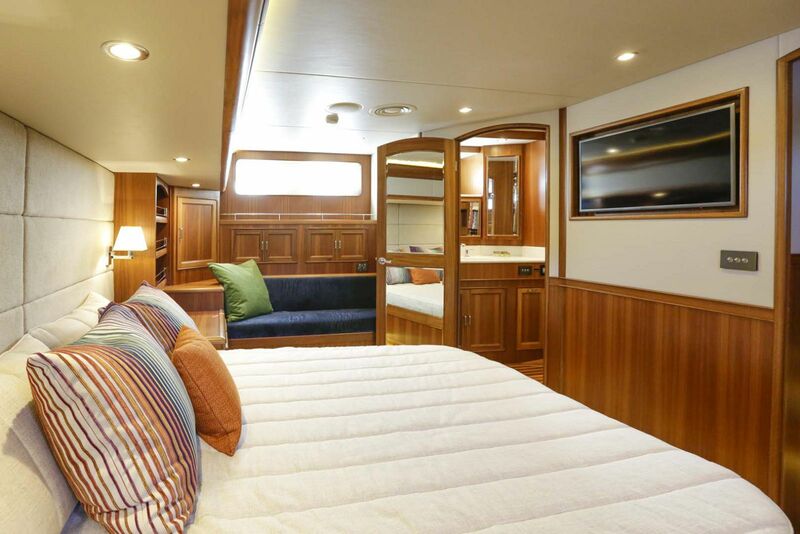 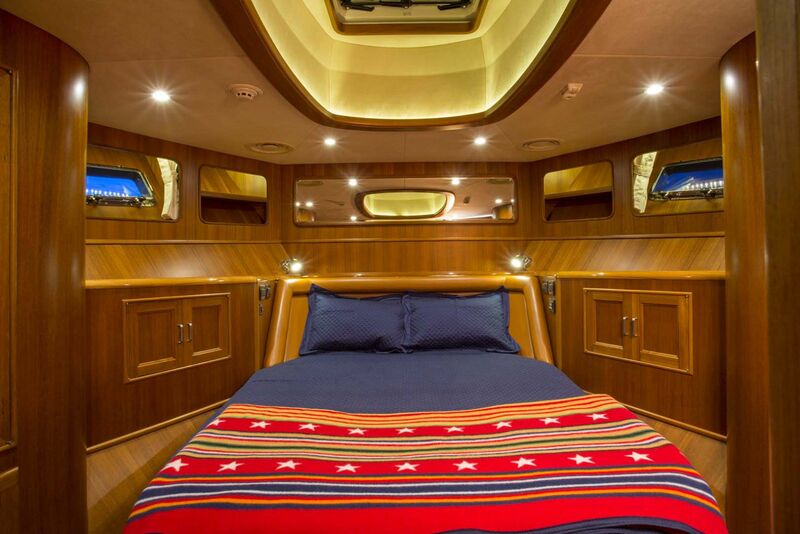 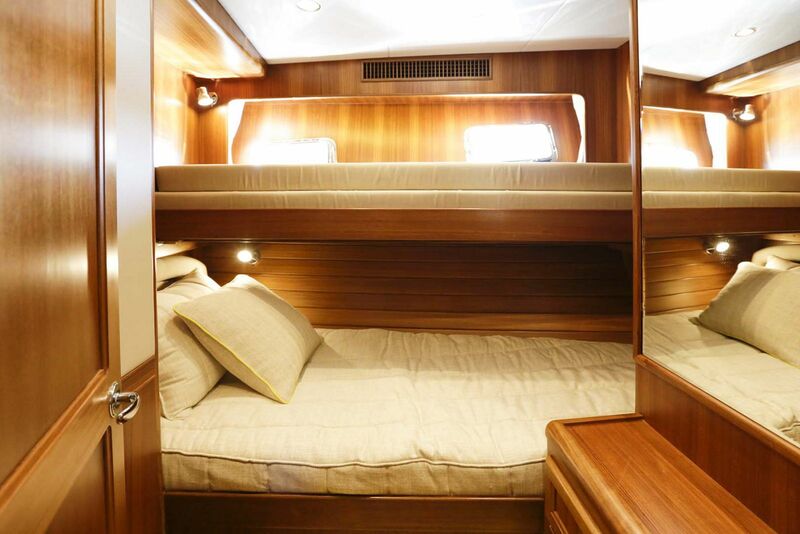 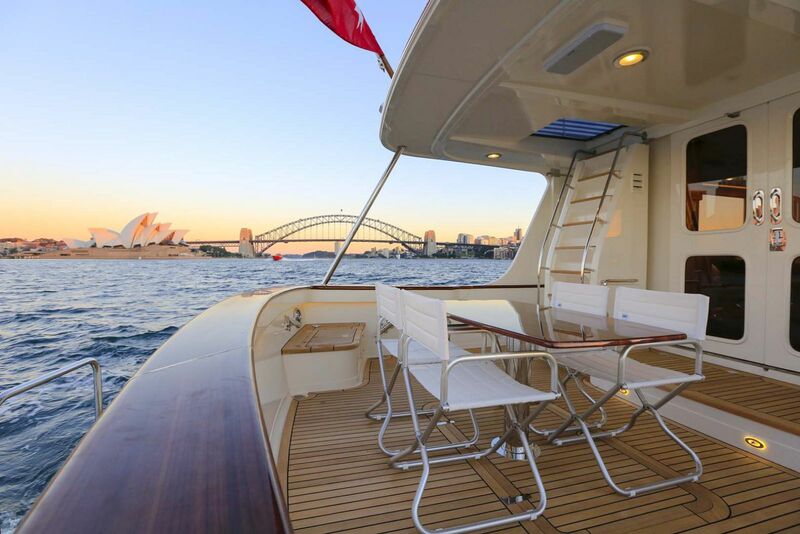 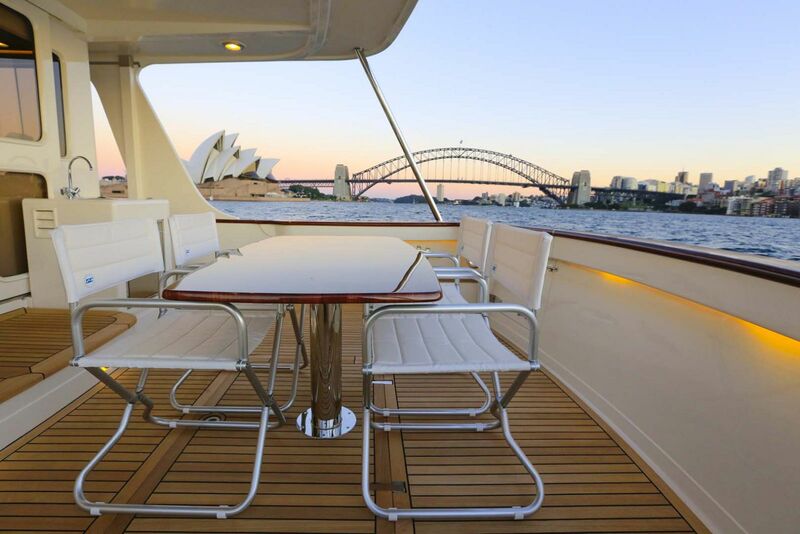 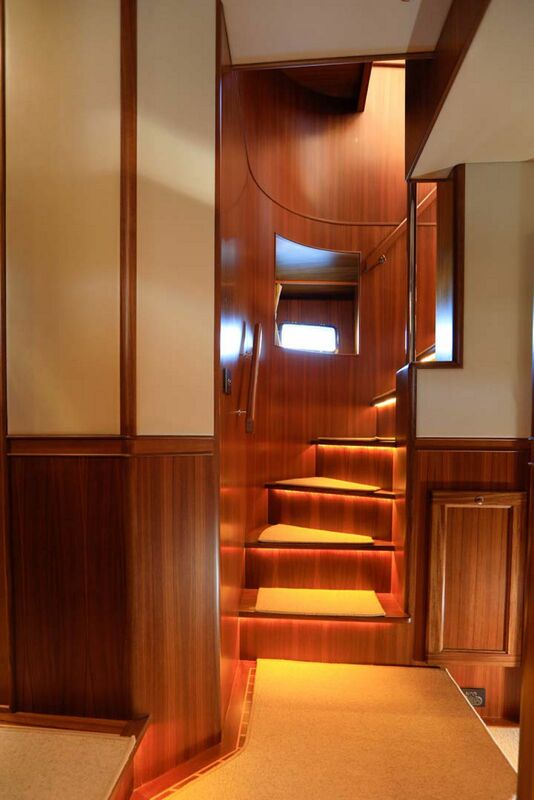 While retaining the Fleming classic lines, the 58 is an entirely new boat designed from the keel up. 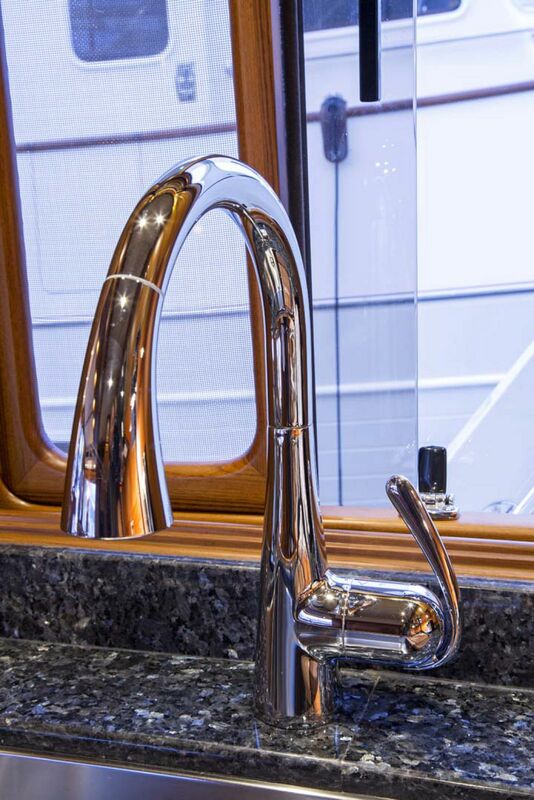 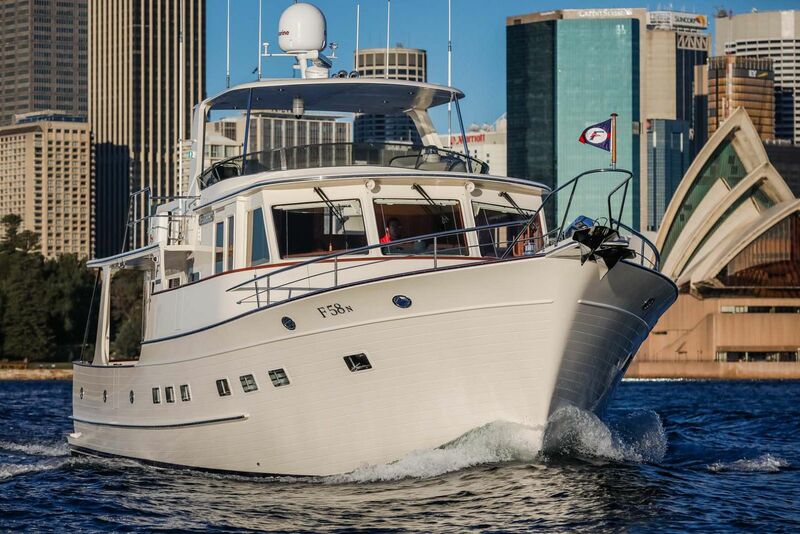 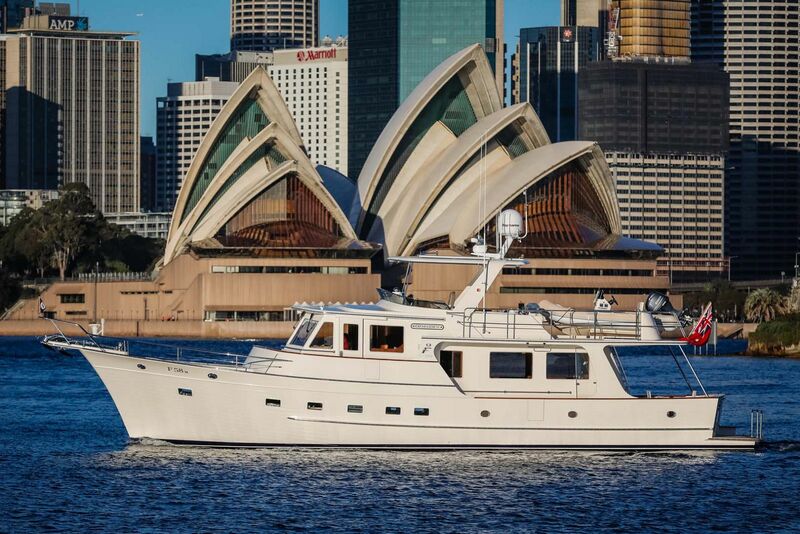 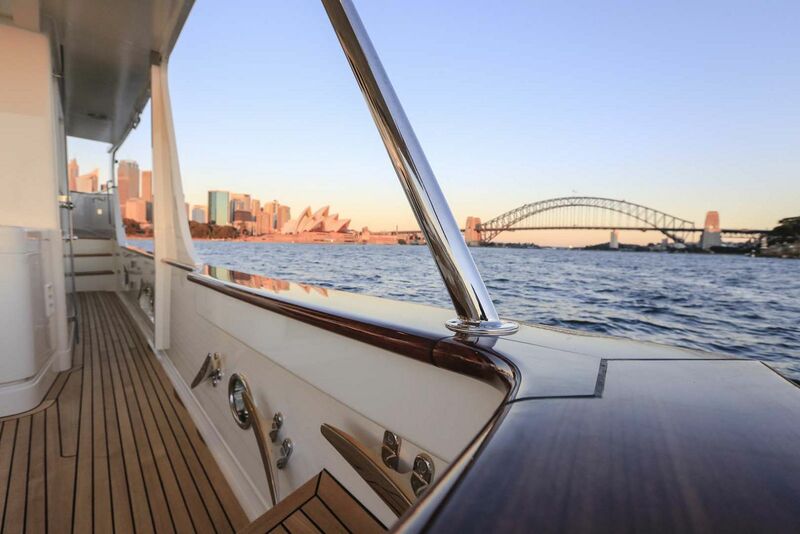 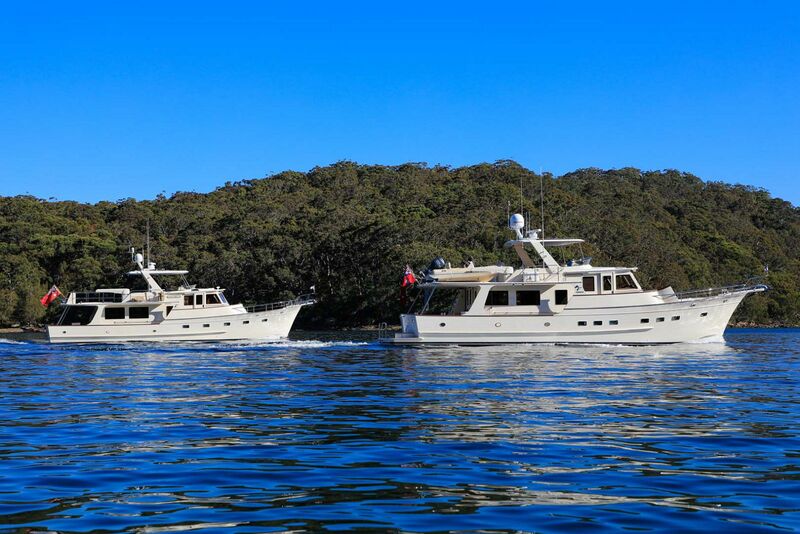 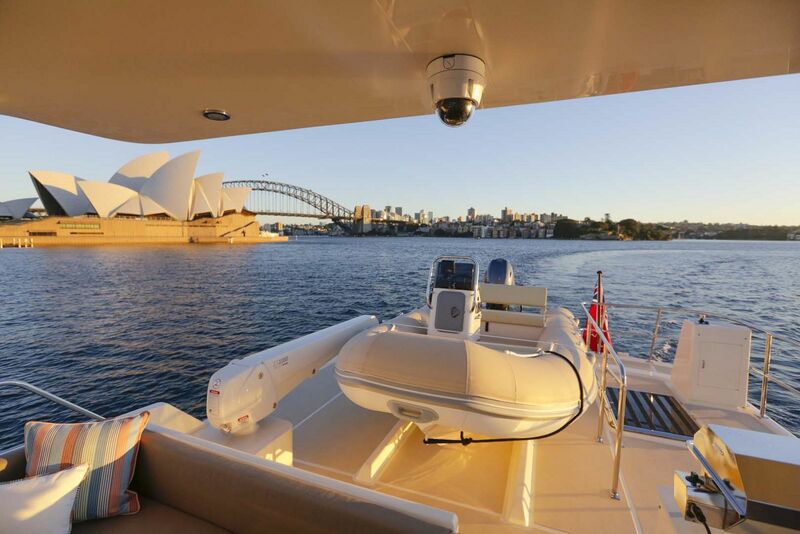 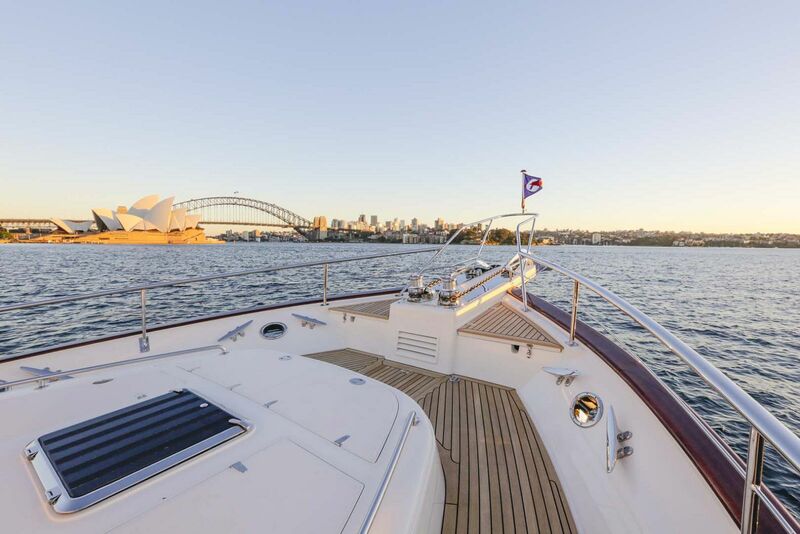 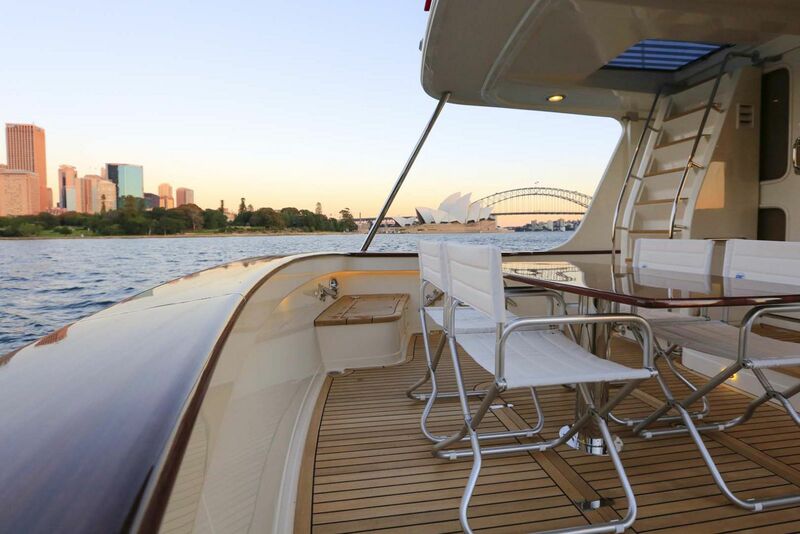 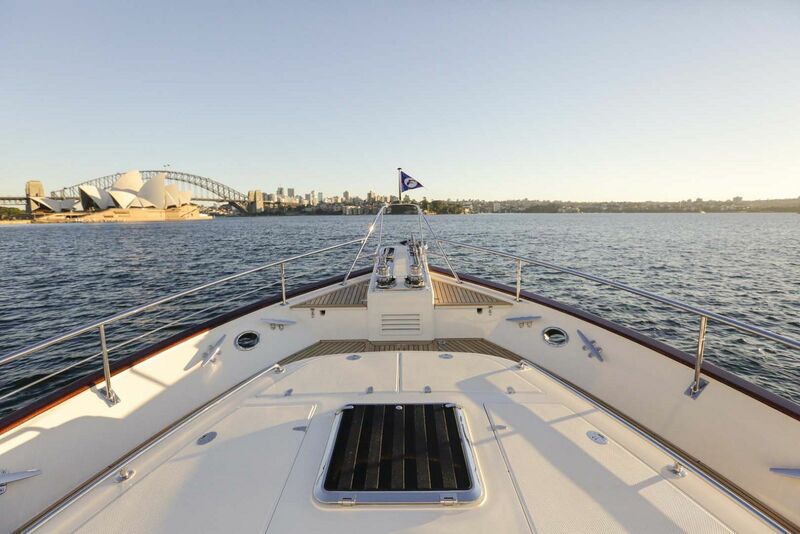 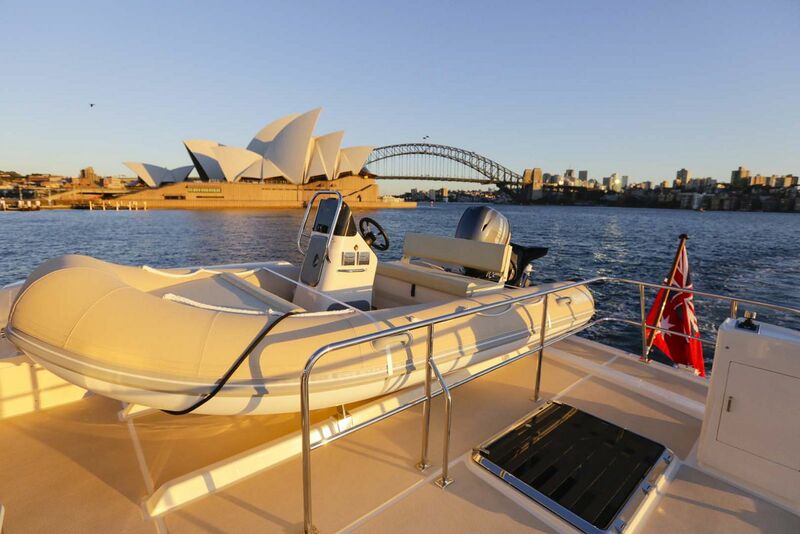 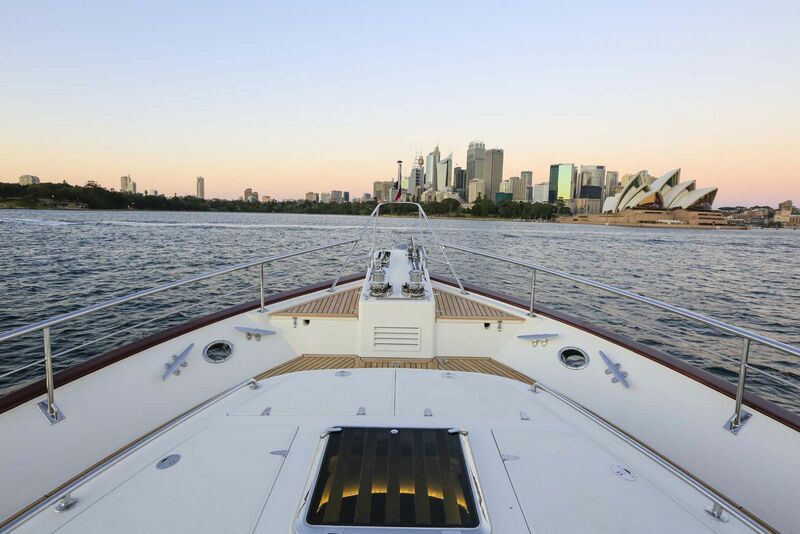 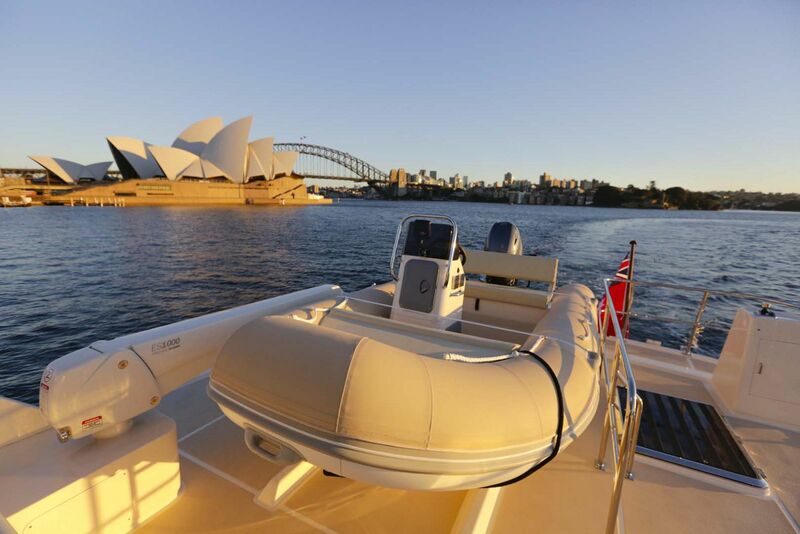 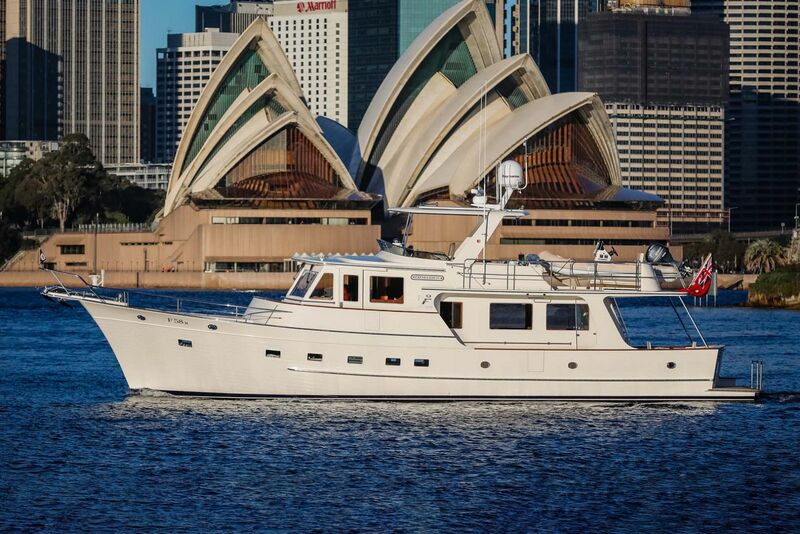 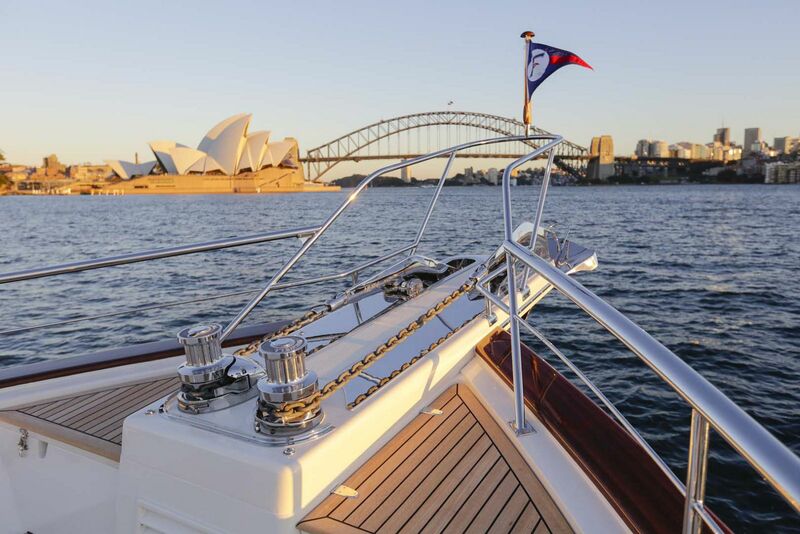 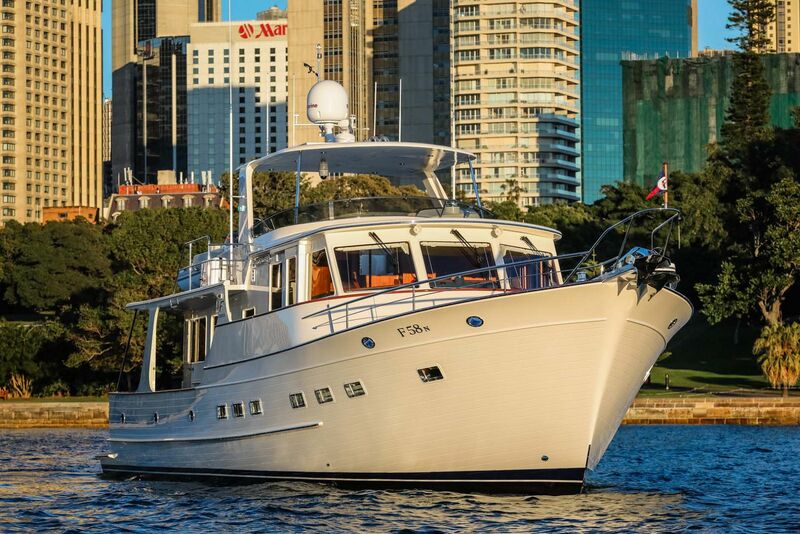 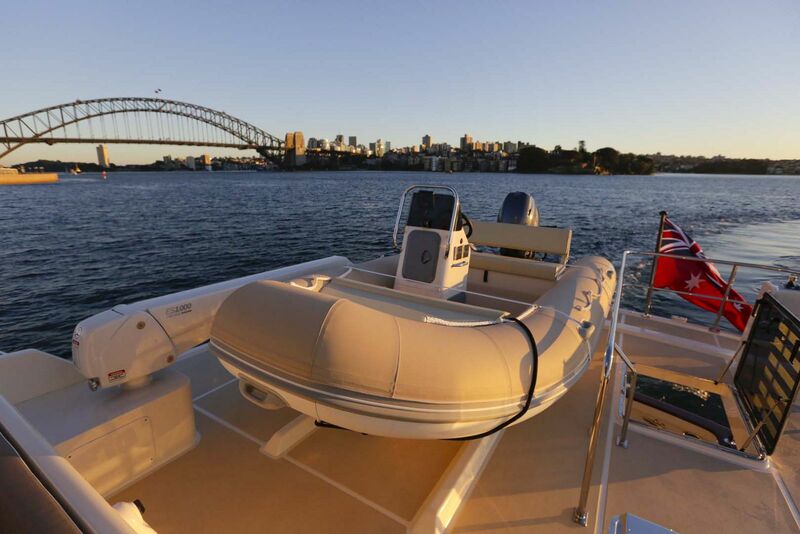 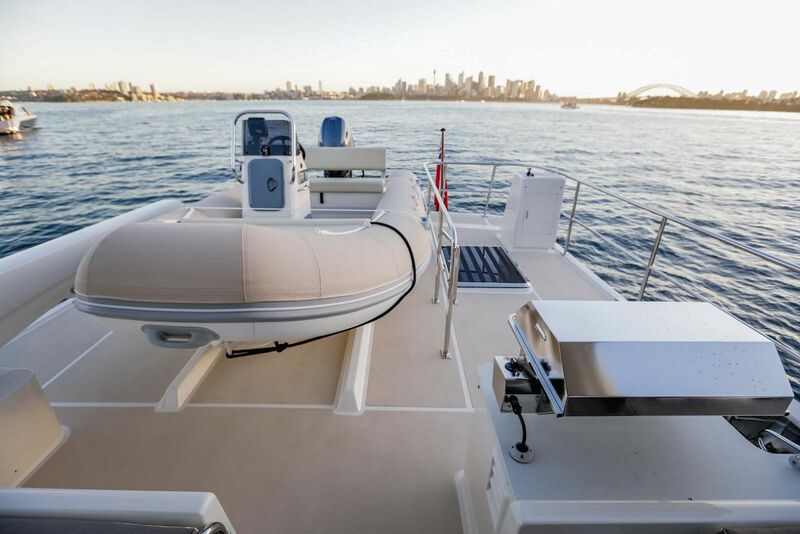 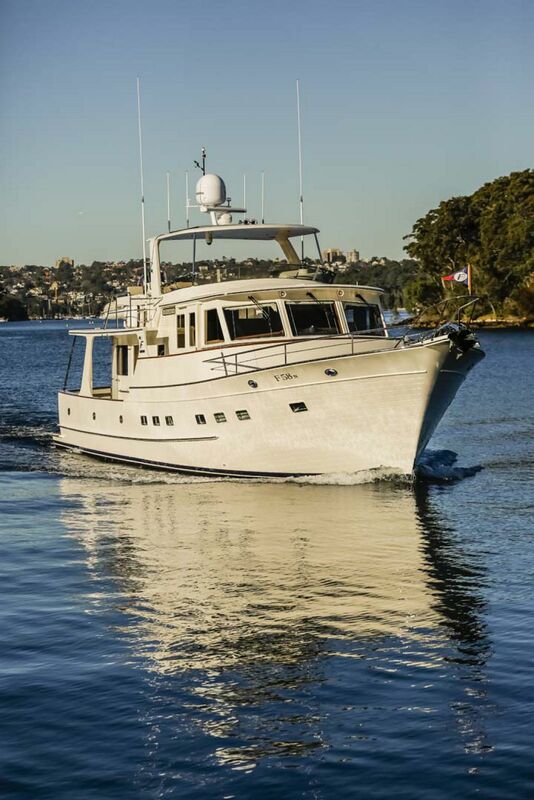 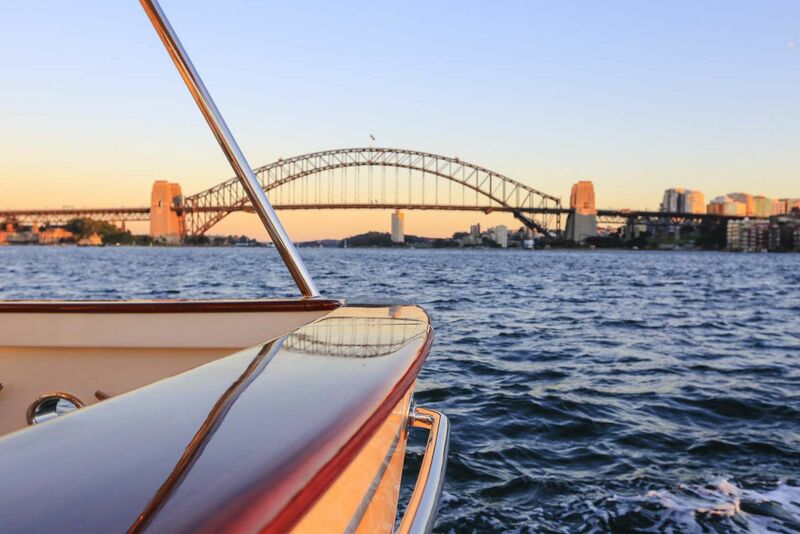 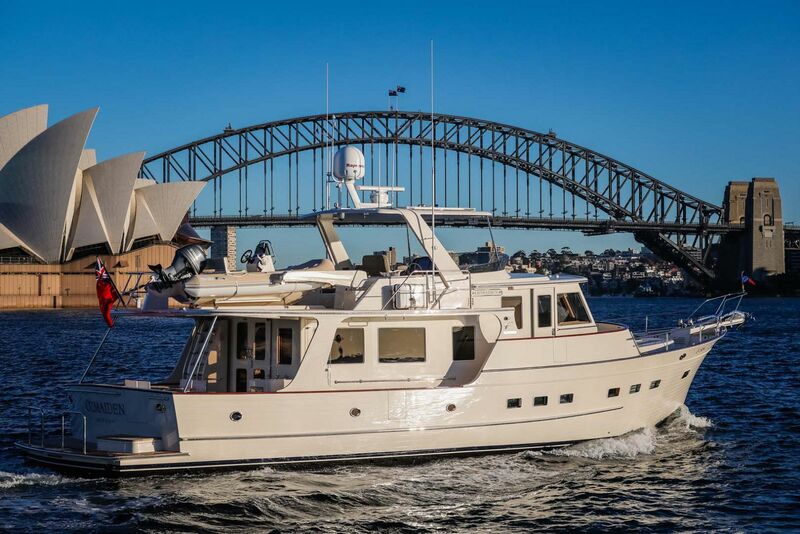 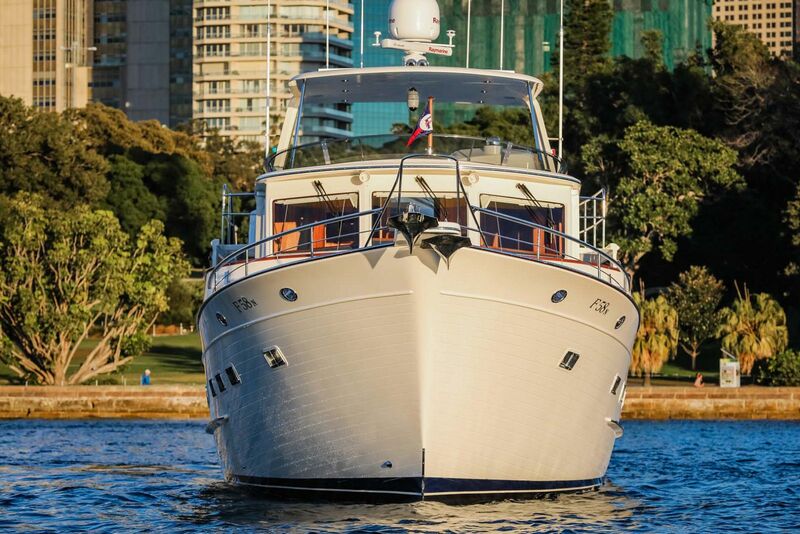 The naval architects selected to assist the in-house Fleming design team were Norman Wright and Sons in Brisbane, Australia who, with their special expertise in hull design and tank testing, have been designing semi-displacement passagemakers for more than 100 years. 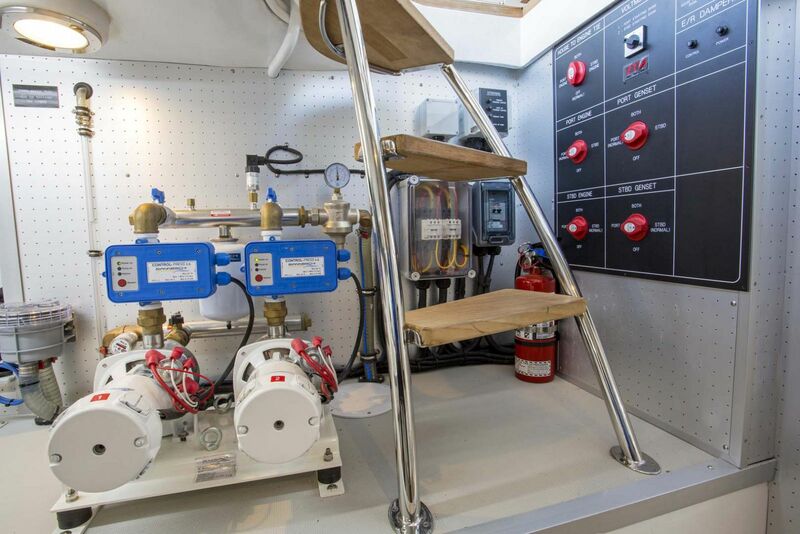 The latest 3D modeling and CAD software were employed during the design process and a 1/12 scale model was built and tank tested at the Australian Maritime College in Tasmania. 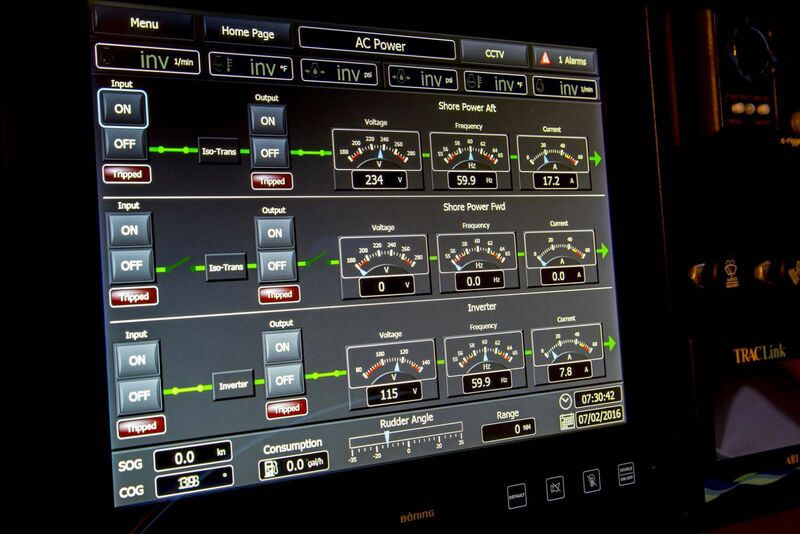 Several load conditions were simulated at varying speeds to determine resistance, trim and other performance parameters. 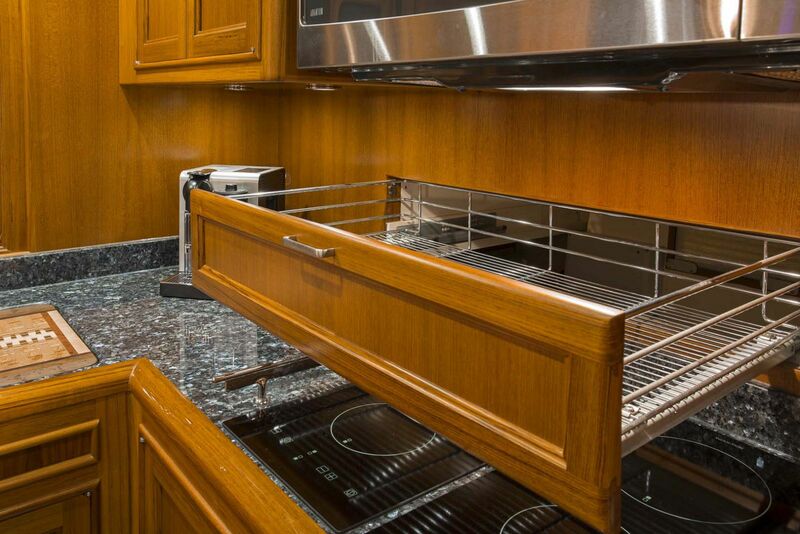 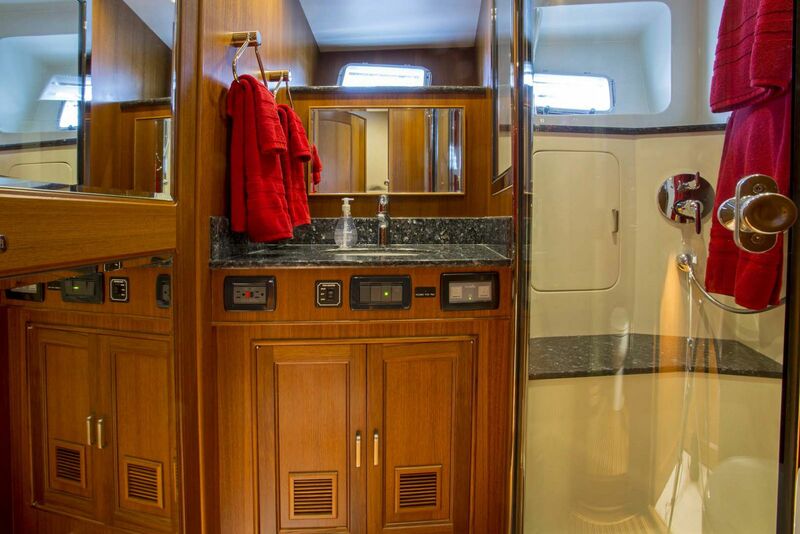 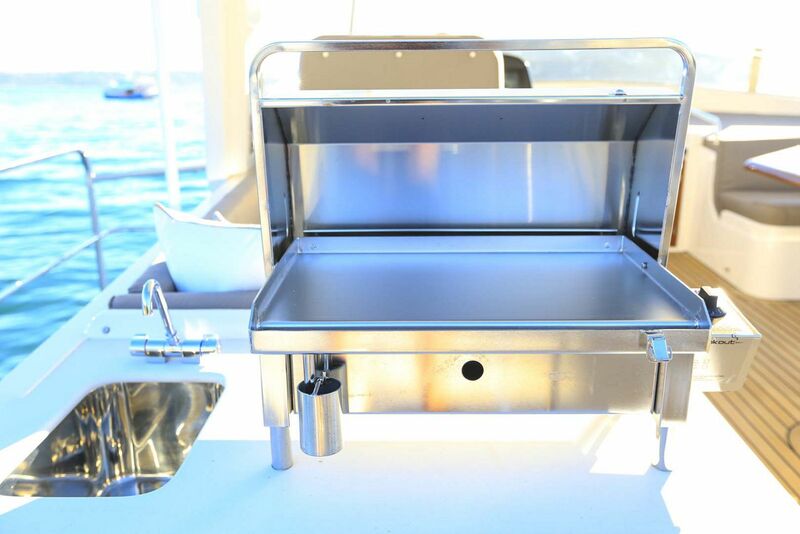 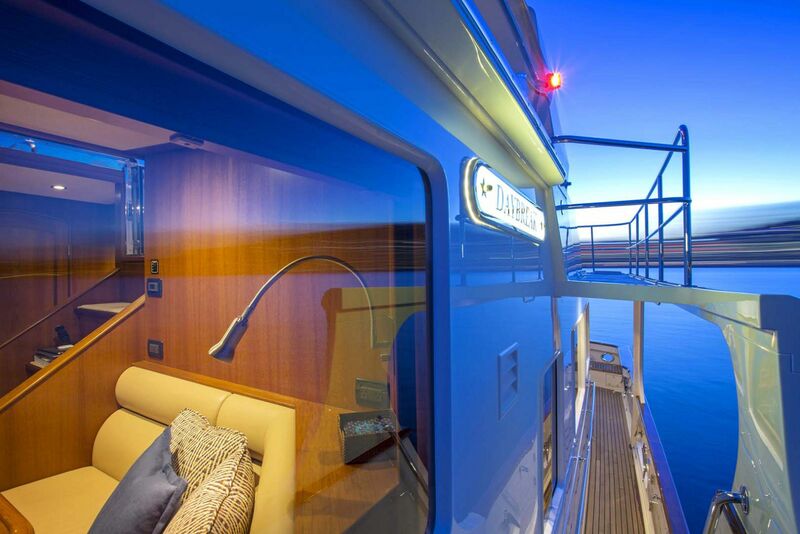 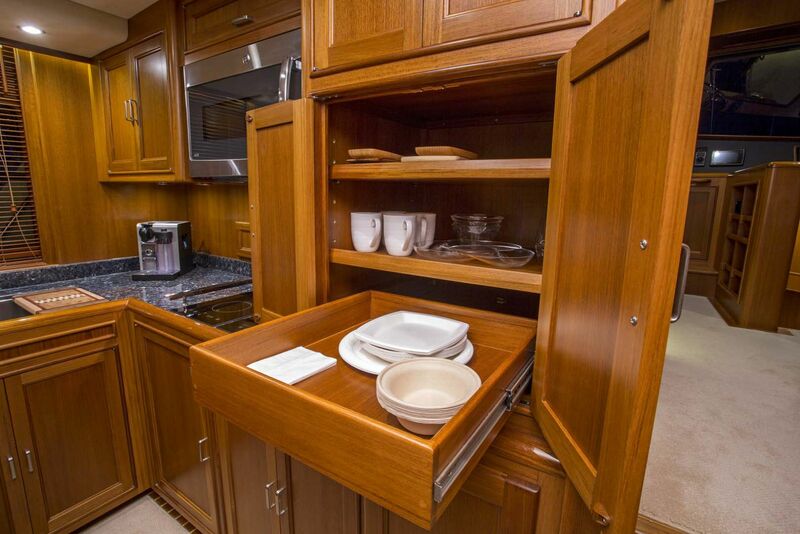 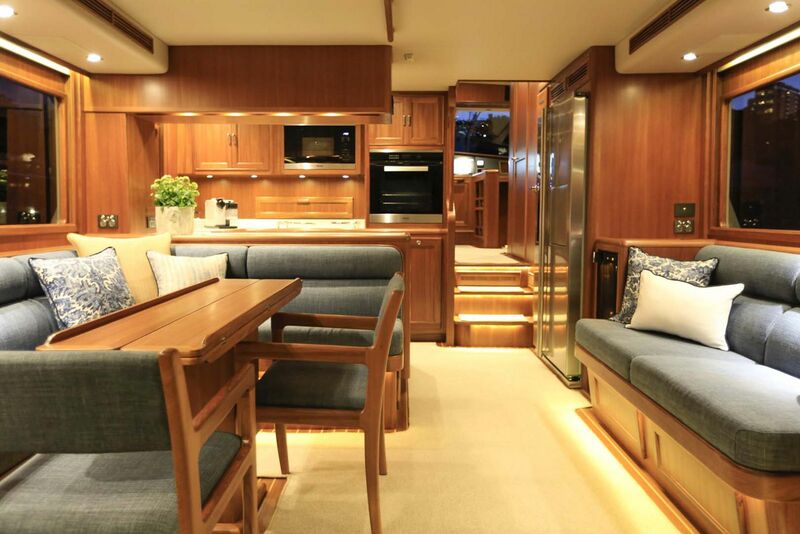 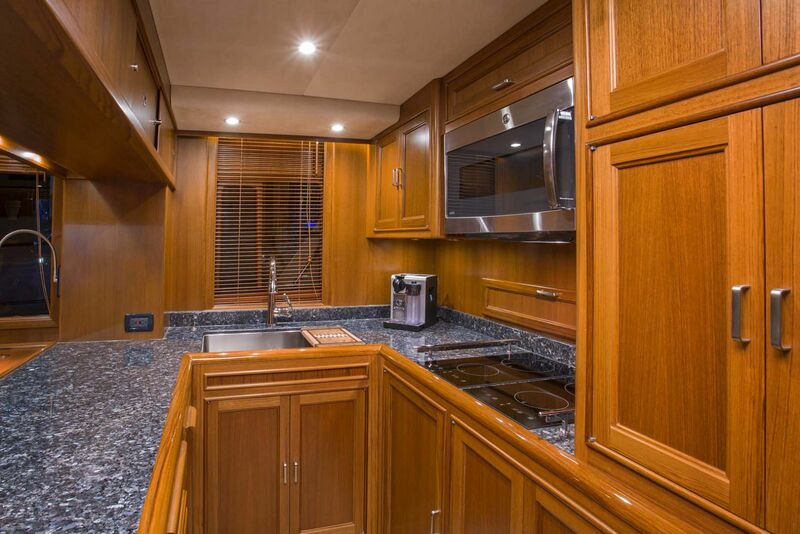 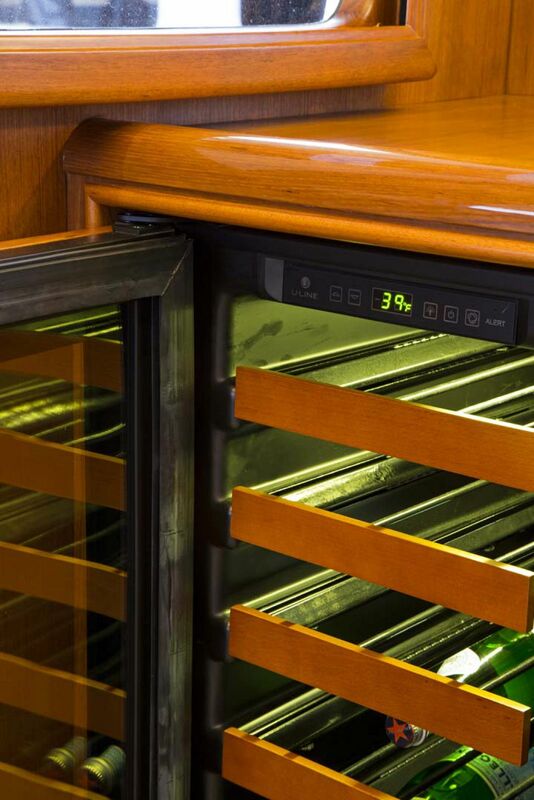 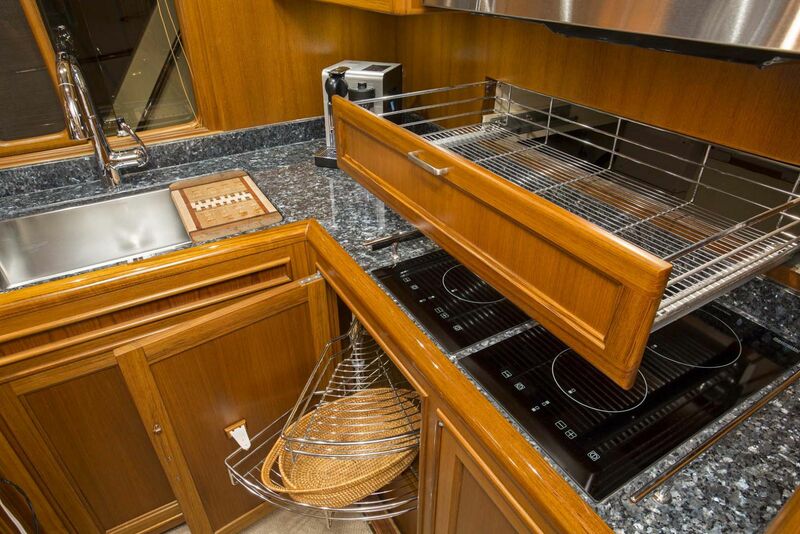 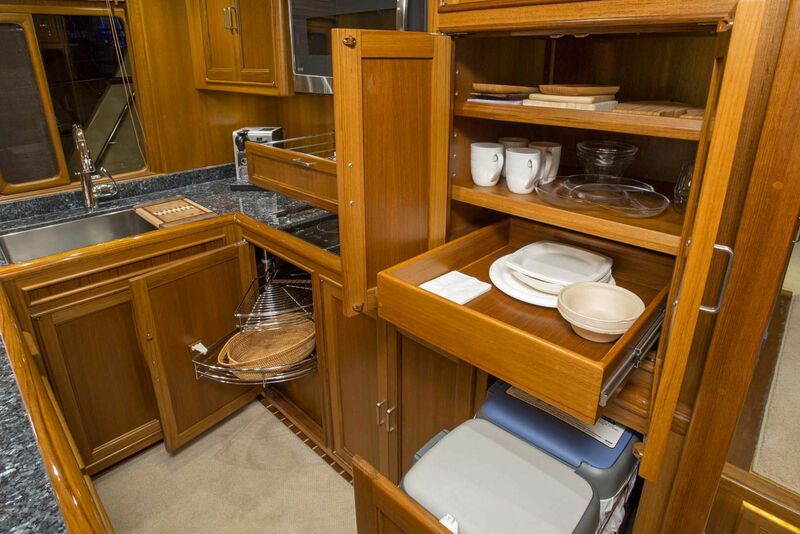 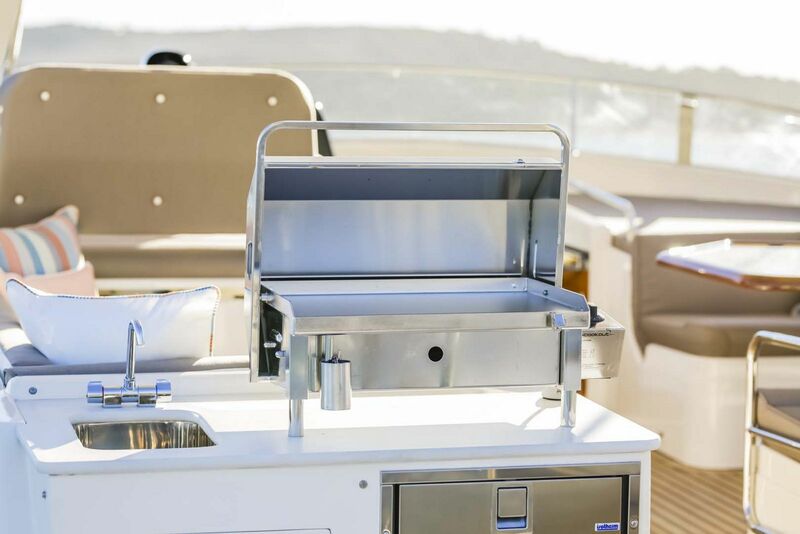 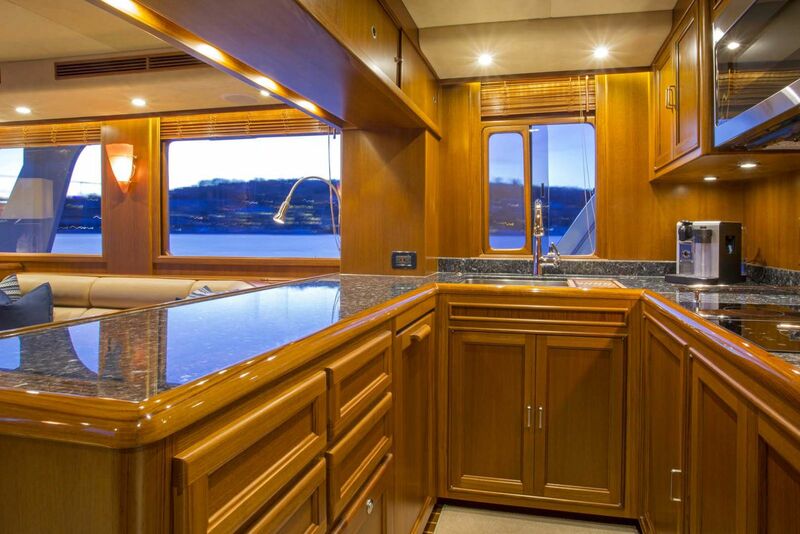 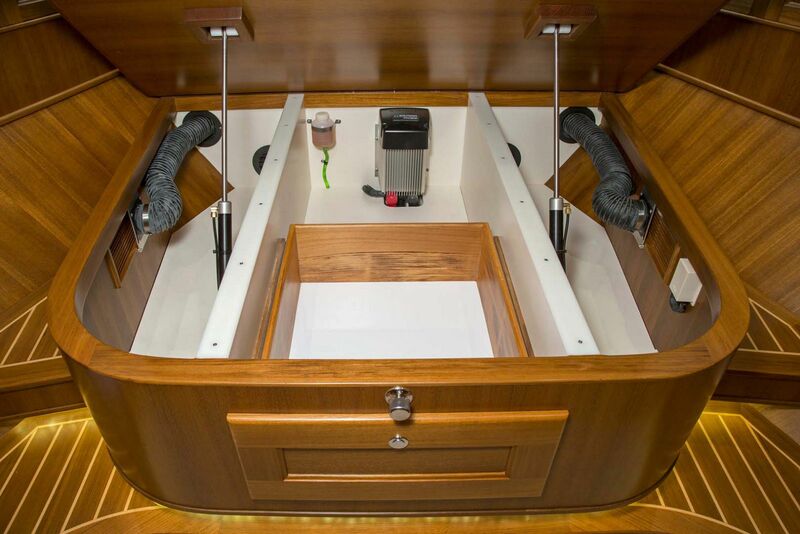 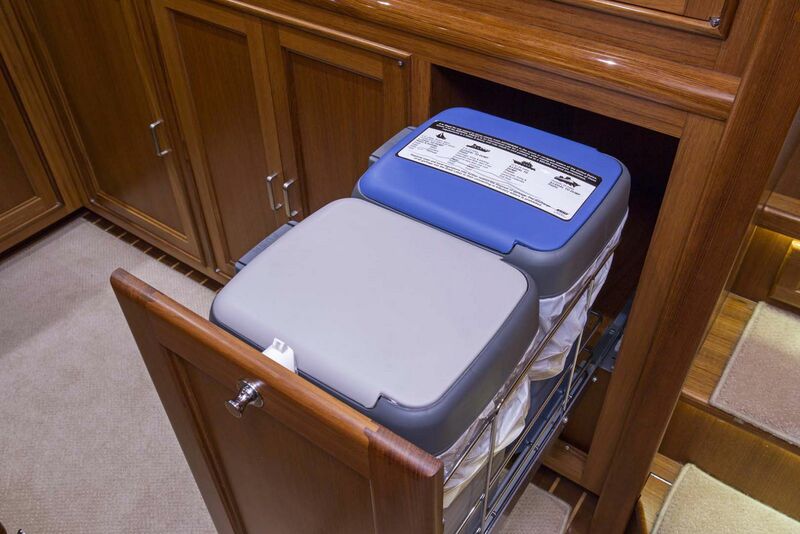 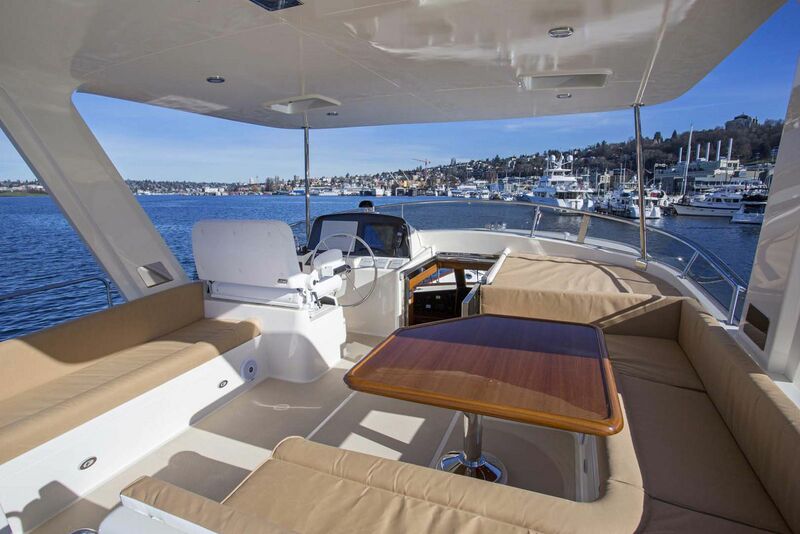 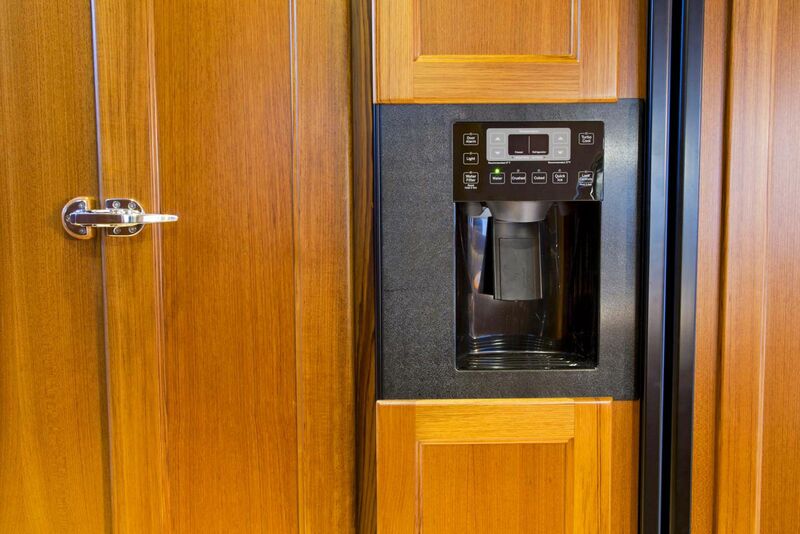 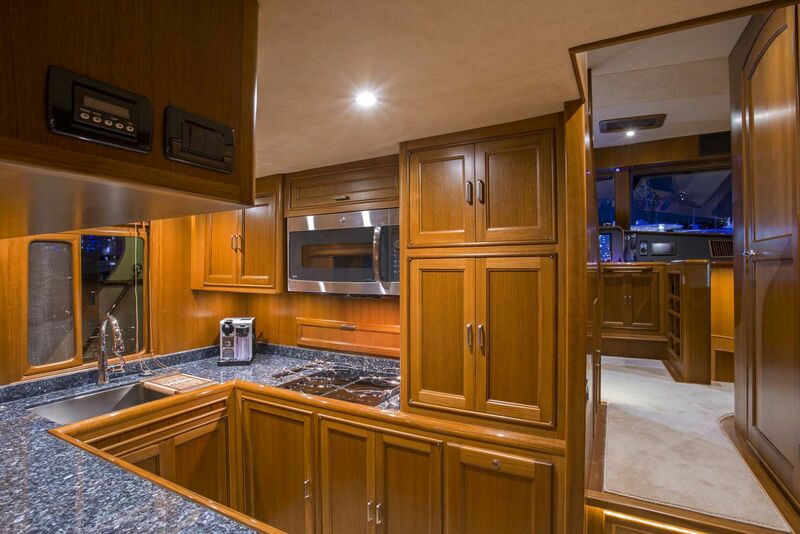 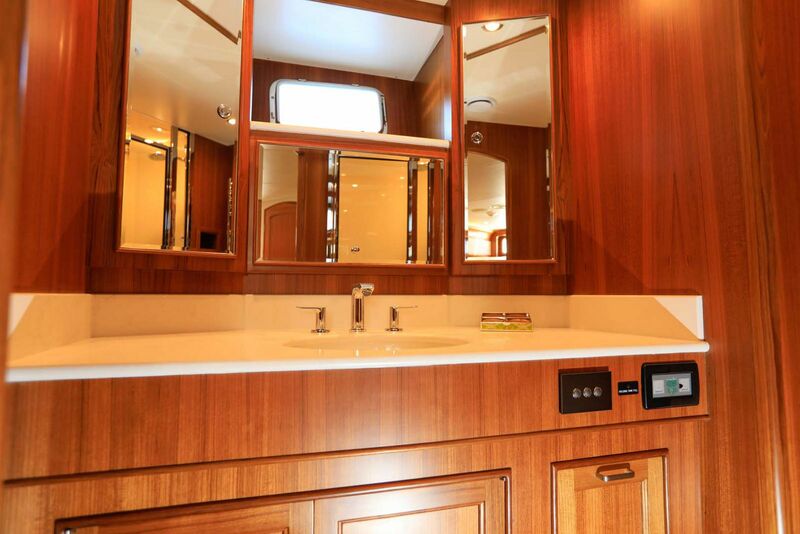 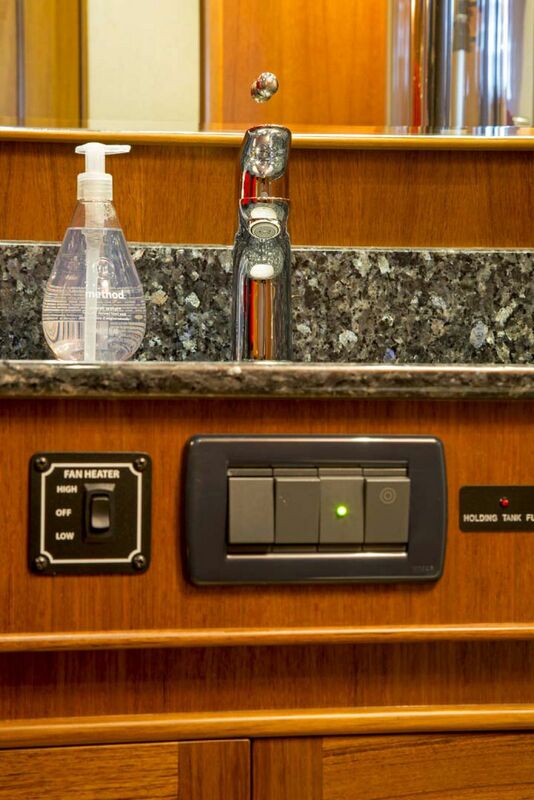 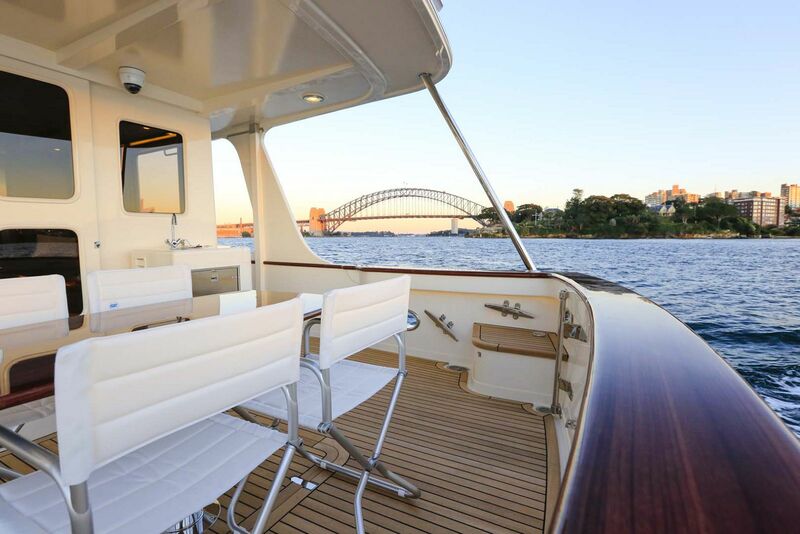 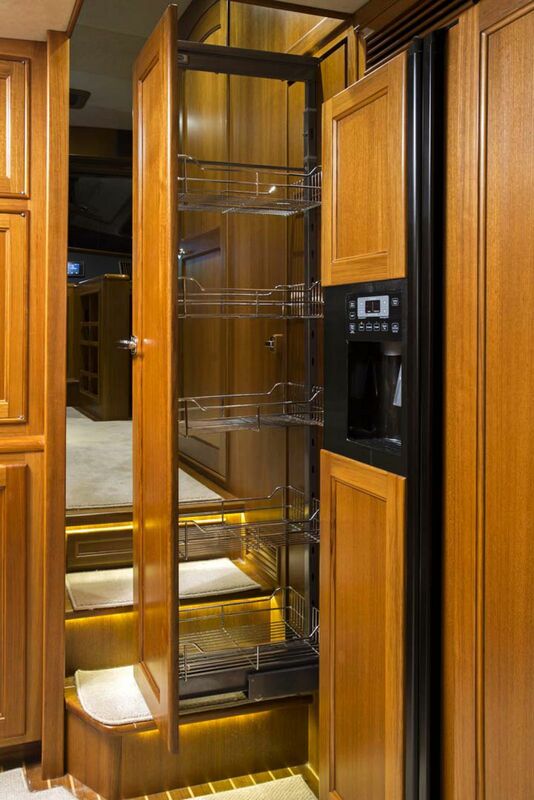 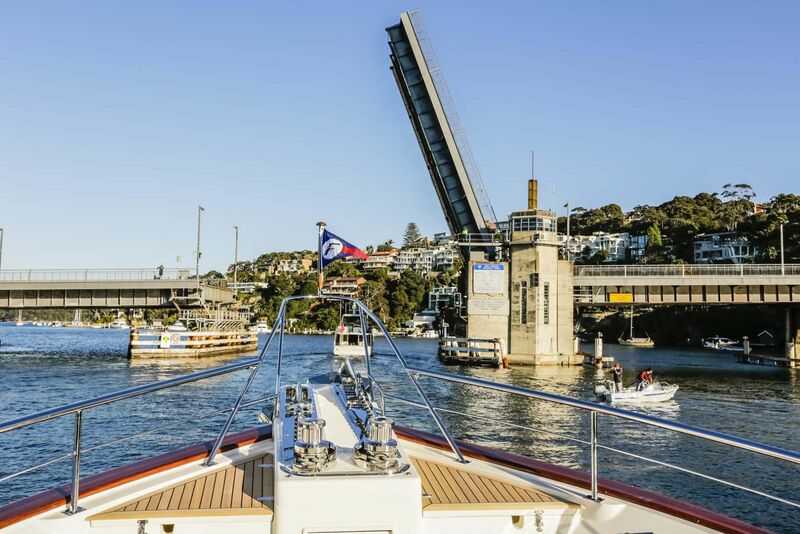 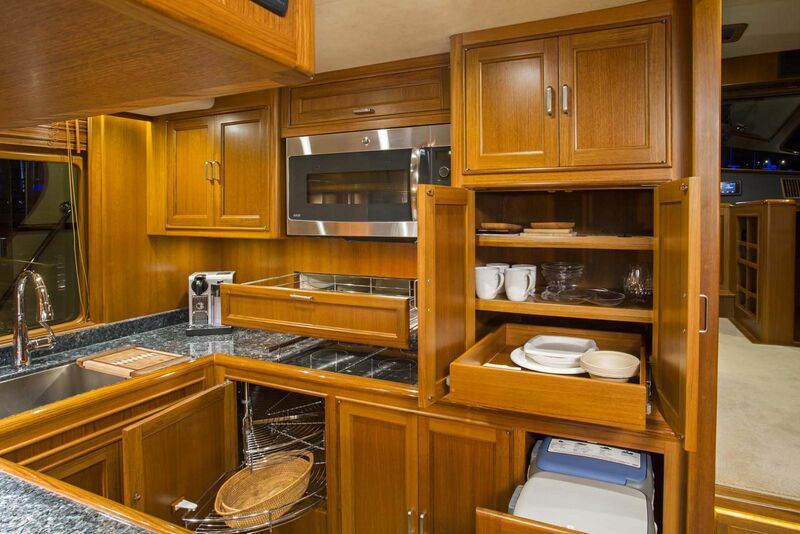 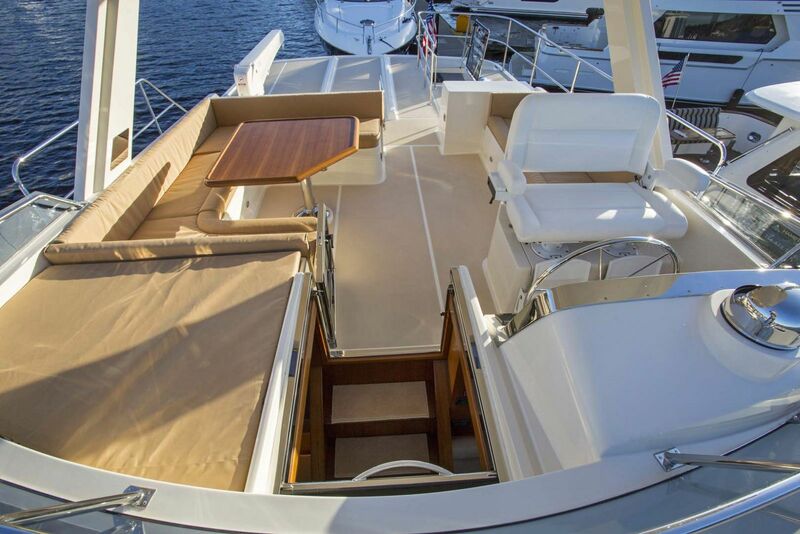 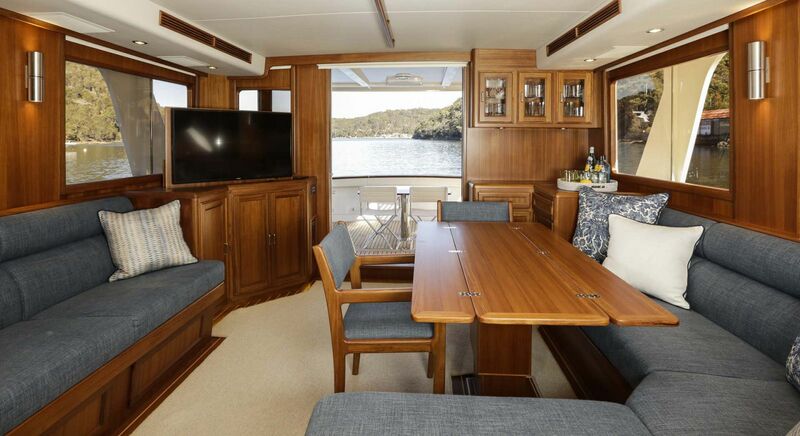 The larger flybridge can accommodate a top-loading freezer, a refrigerator, BBQ and a 13ft (3.9m) Tender. 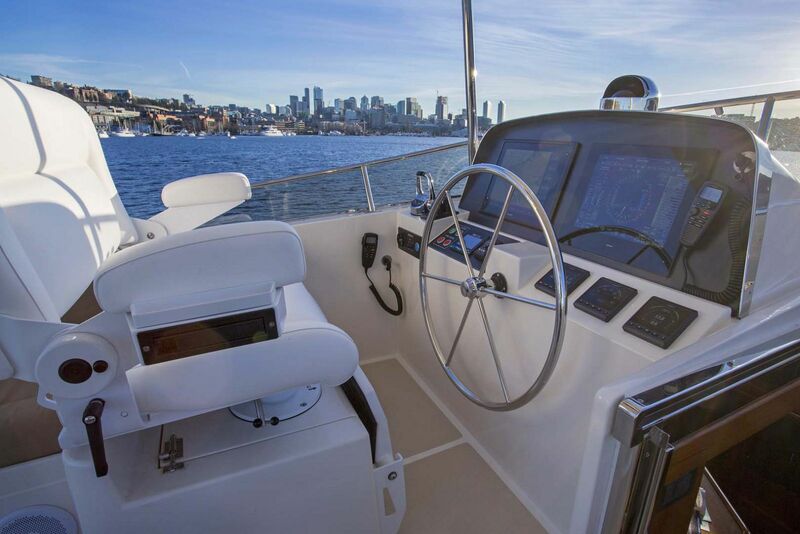 The double Stidd helm seat provides comfortable, adjustable seating. 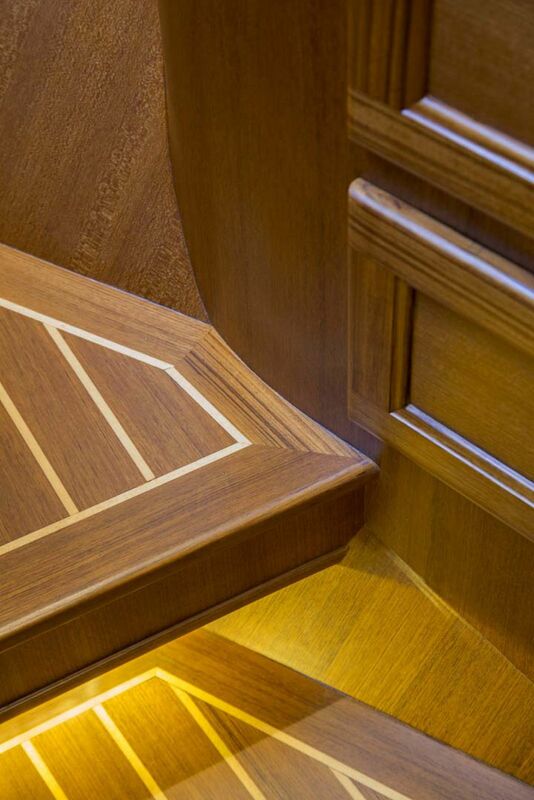 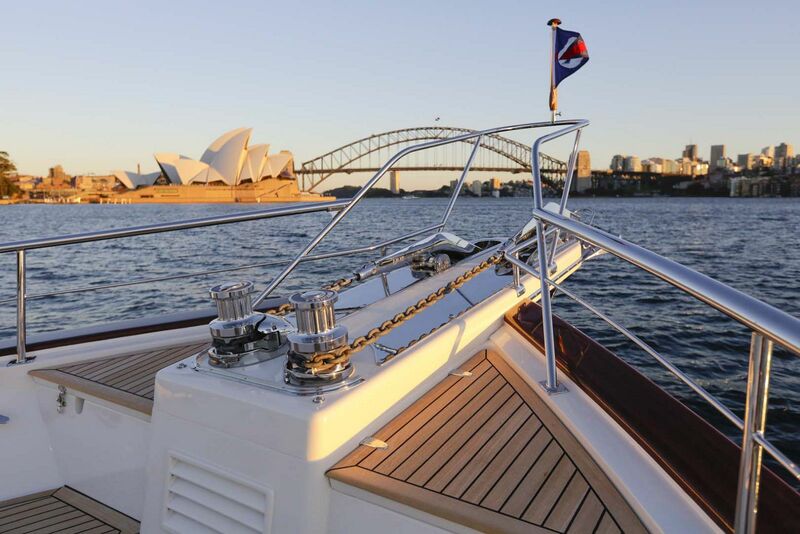 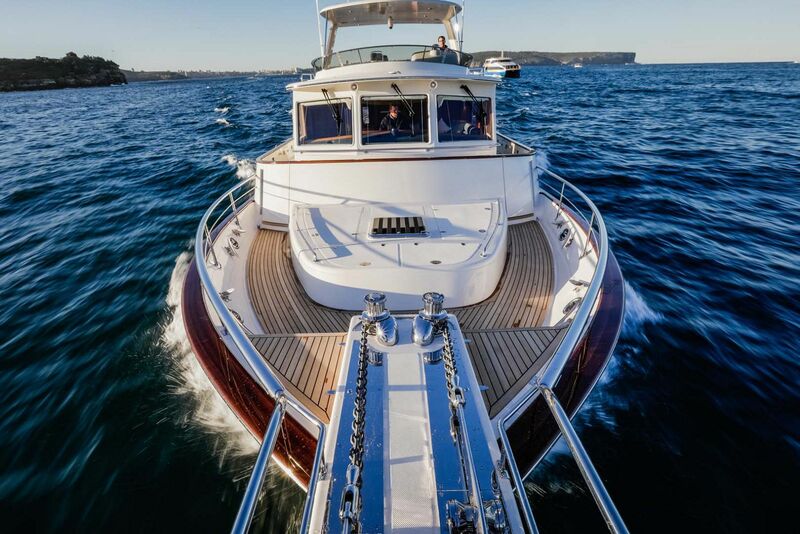 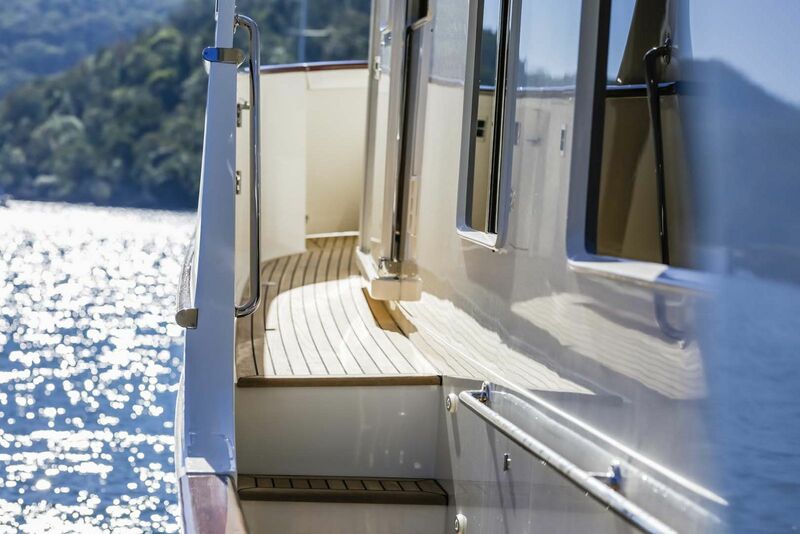 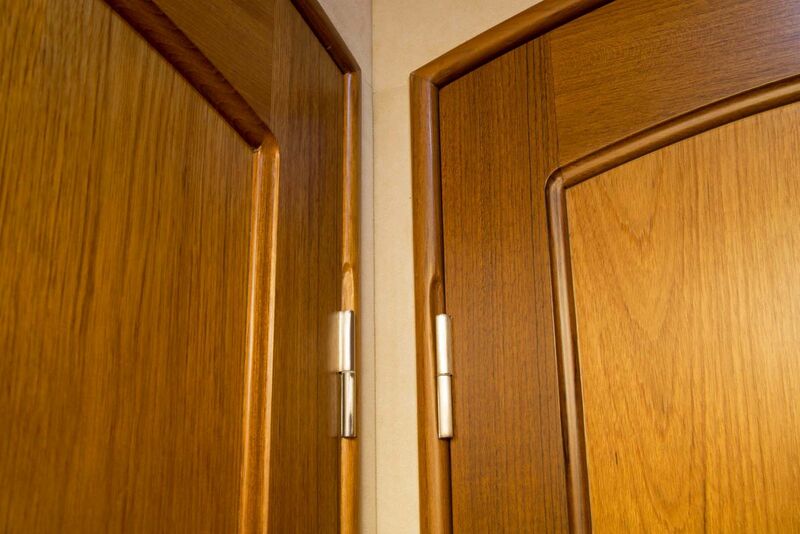 Among the Innovations being offered on this and all Fleming Yachts is "Burrwood" a composite substitute for teak rail capping. 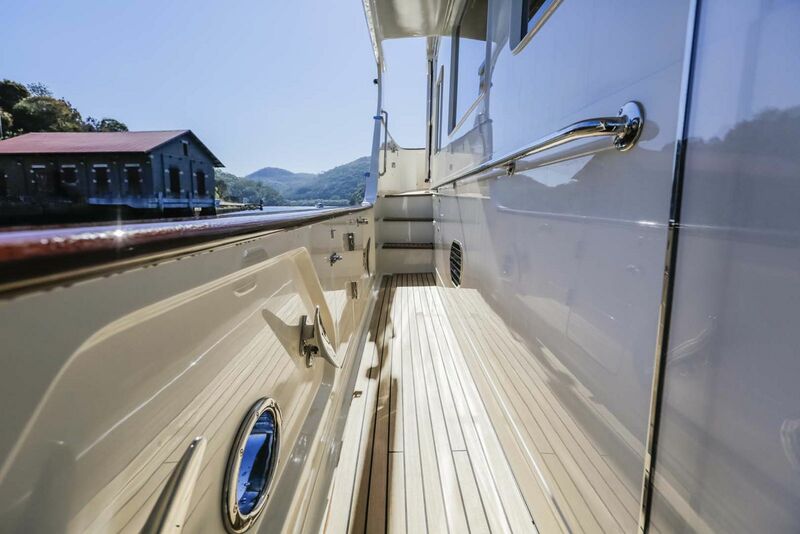 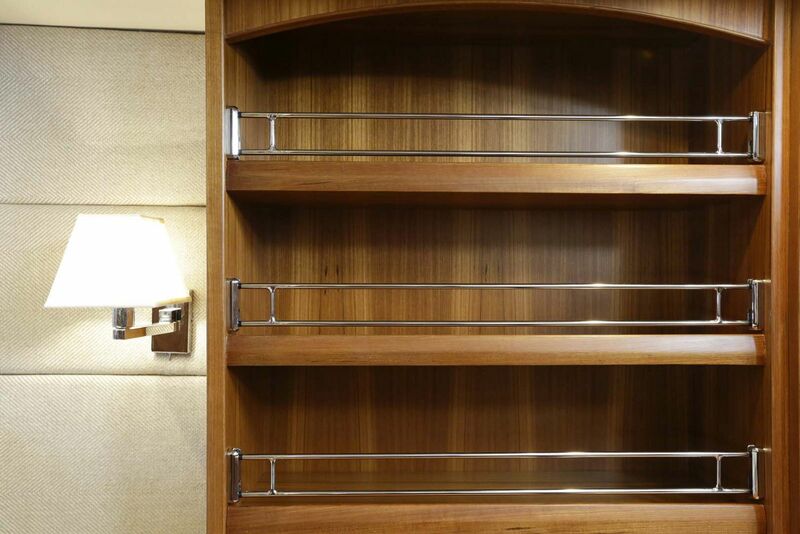 This fiberglass material, manufactured and installed at the yard, replicates the exact appearance of varnished teak without the need for continual varnishing. 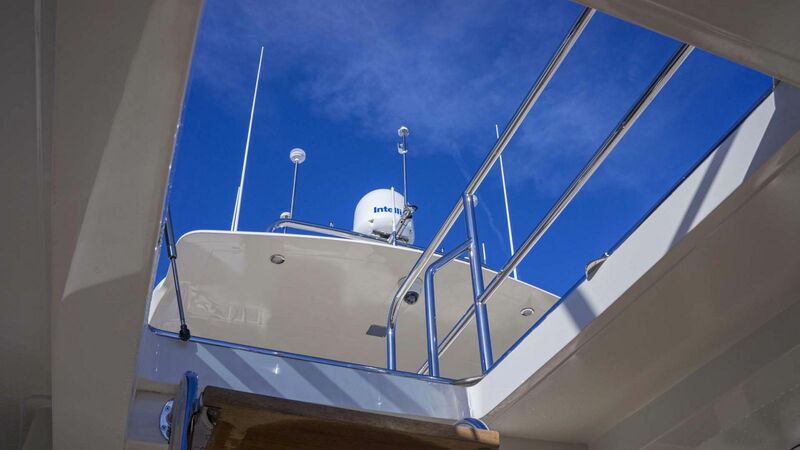 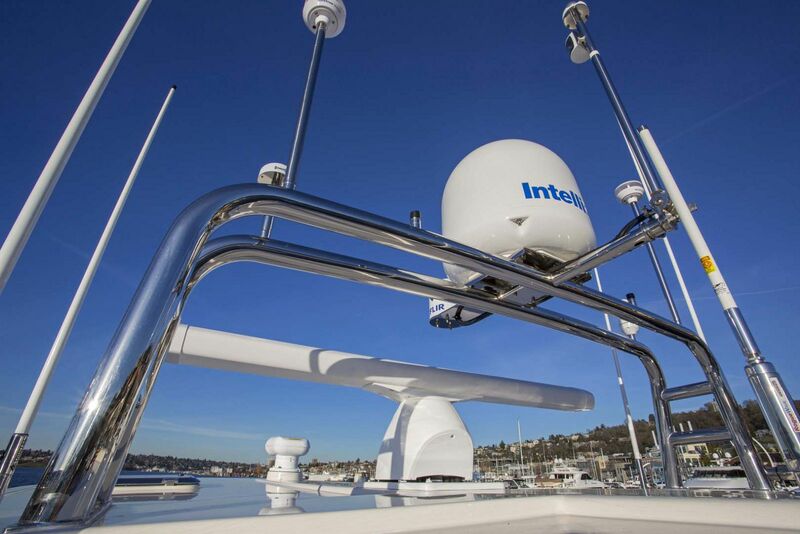 Anchor Platform accommodates dual Maxwell RC12 vertical windlasses to handle the 100 lb (45 Kg) stainless steel Ultra anchor and 7/16" Grade-60 stainless steel chain. 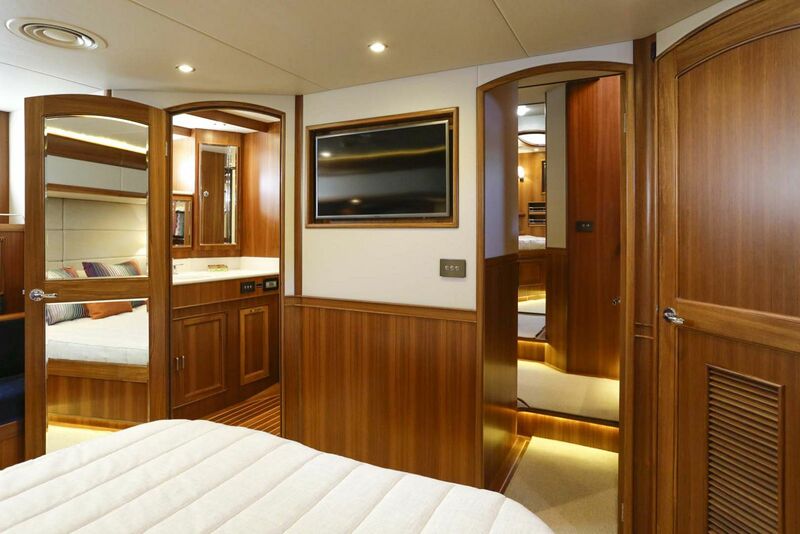 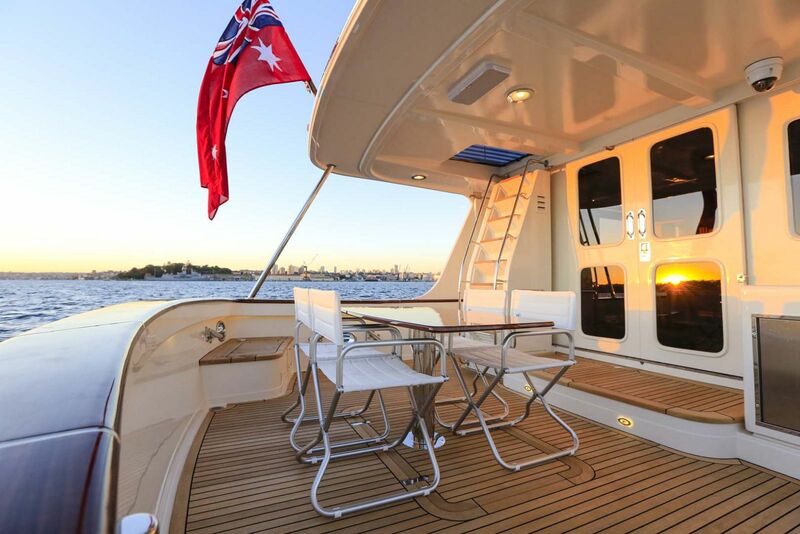 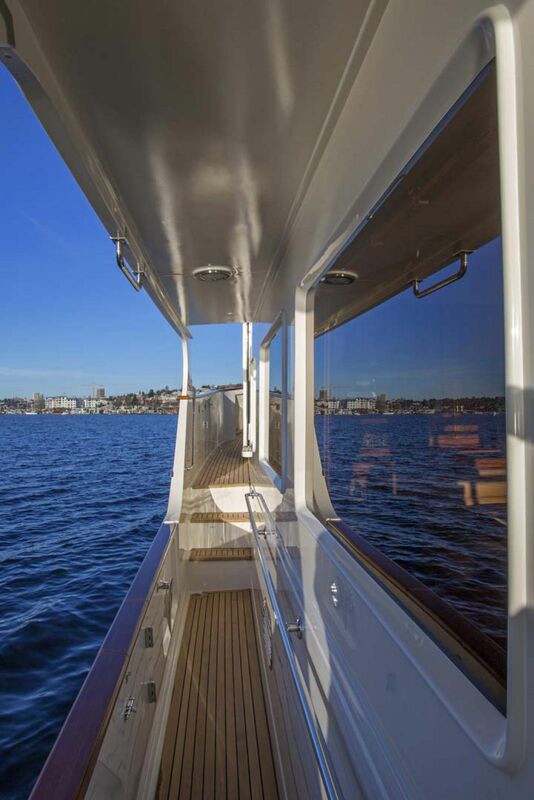 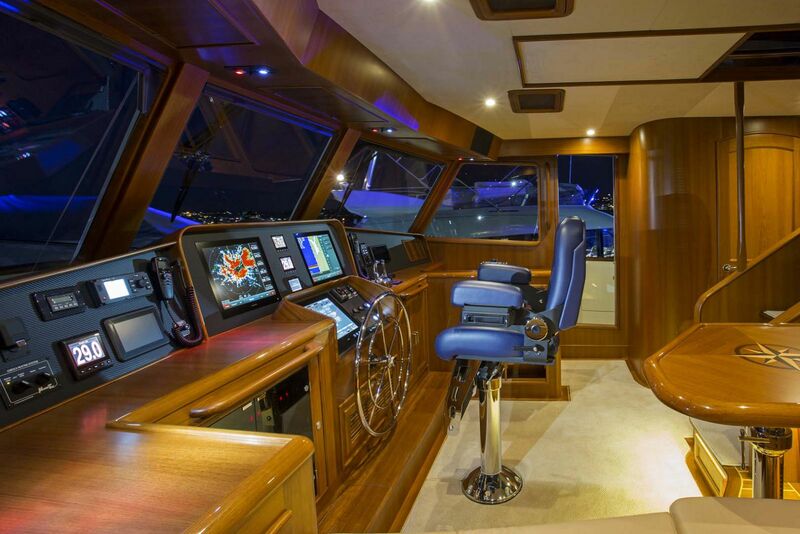 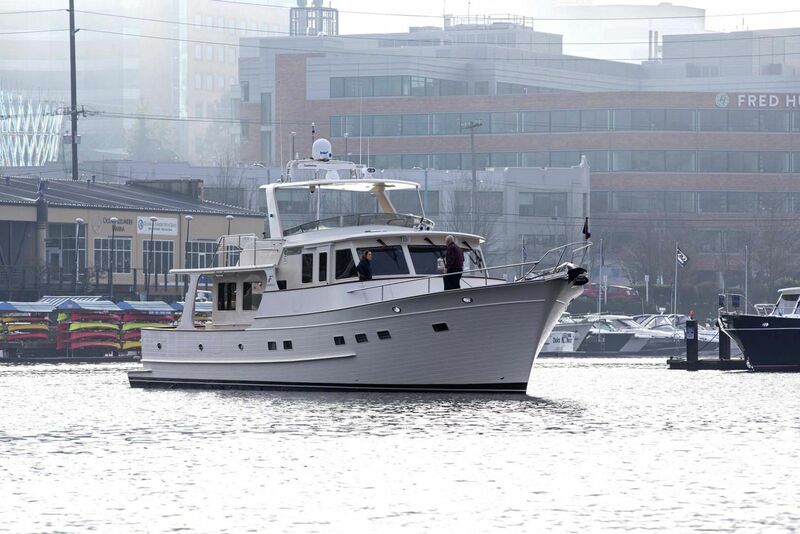 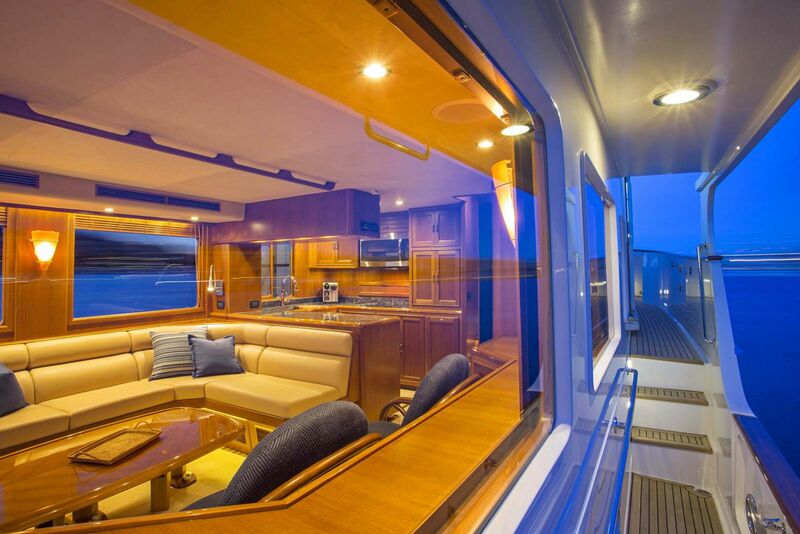 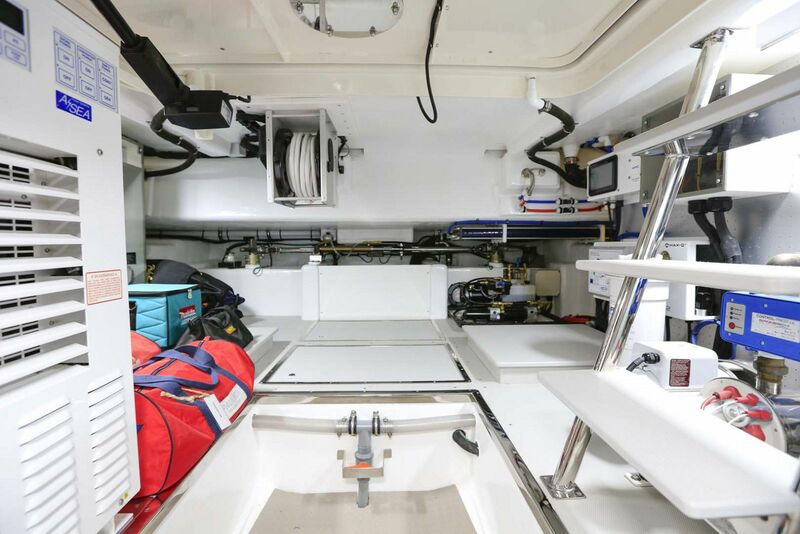 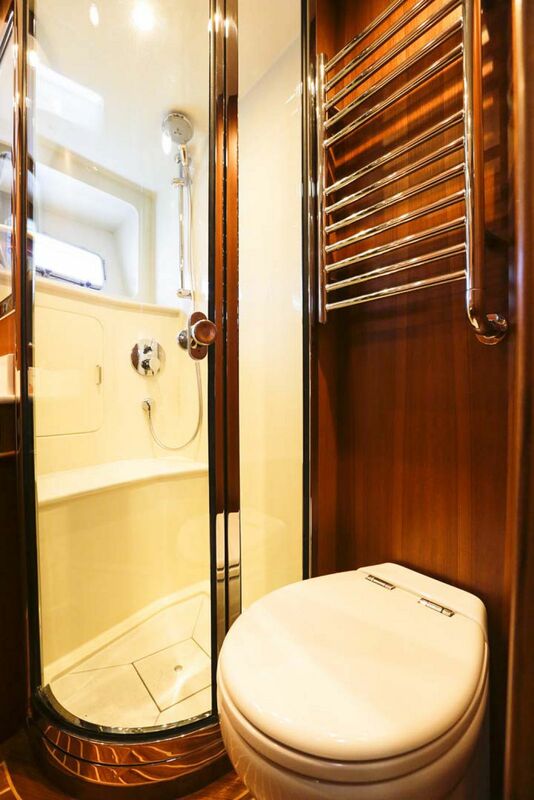 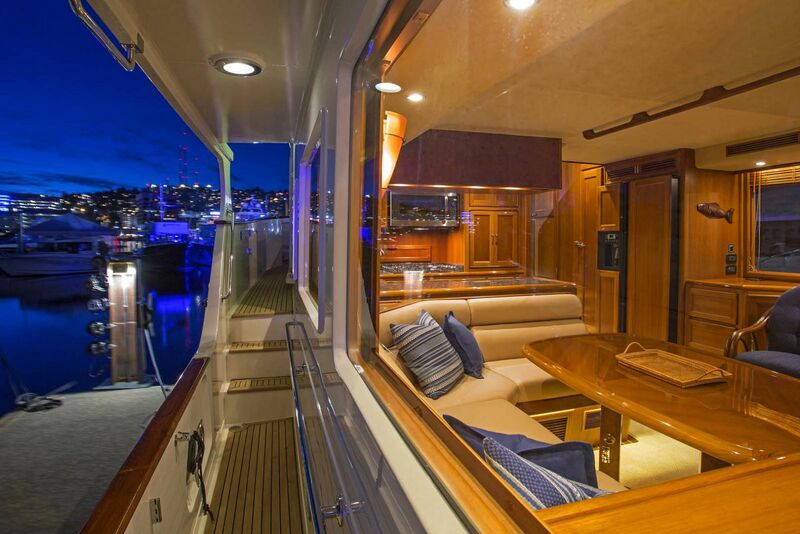 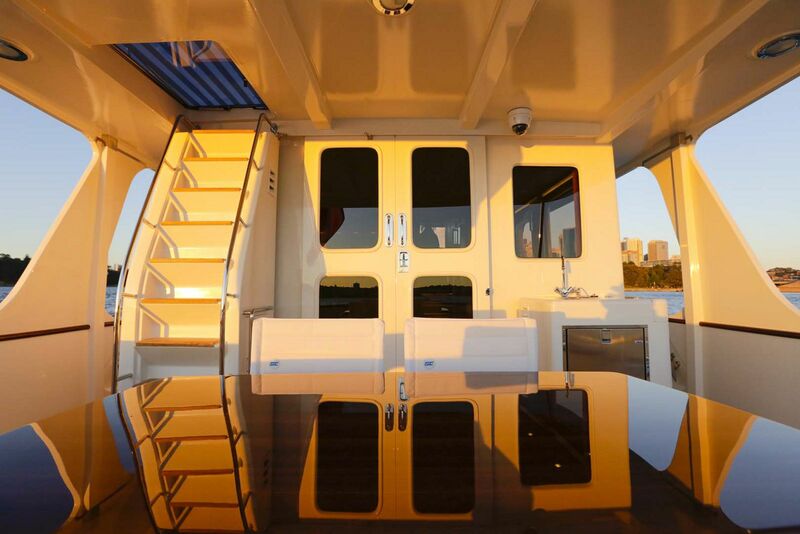 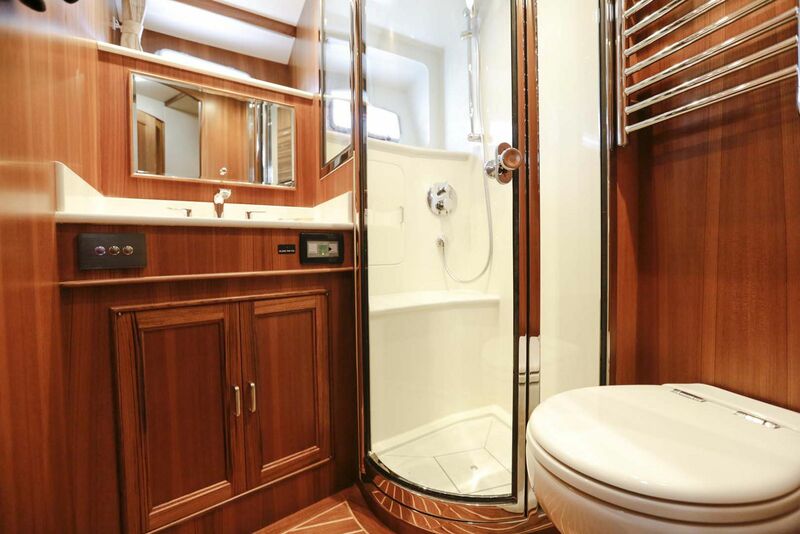 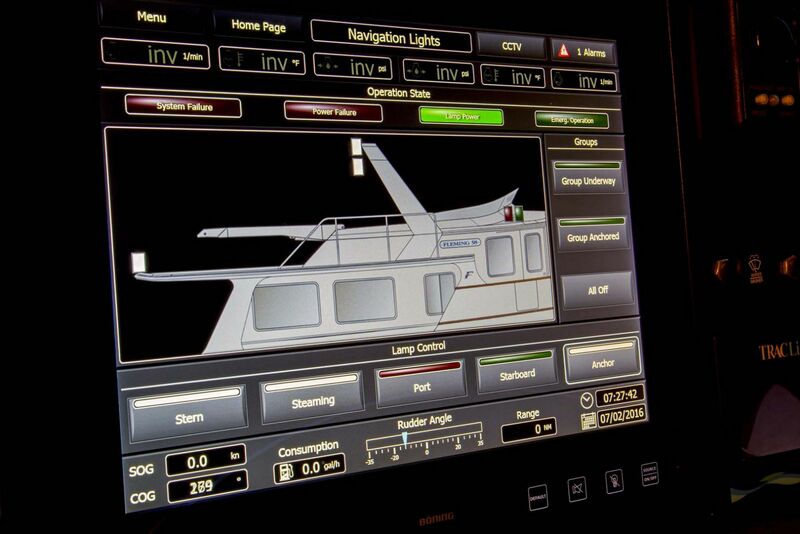 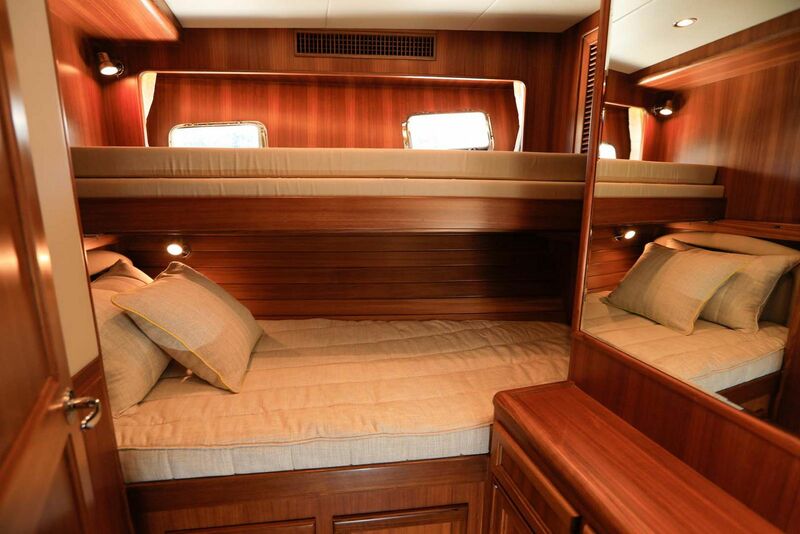 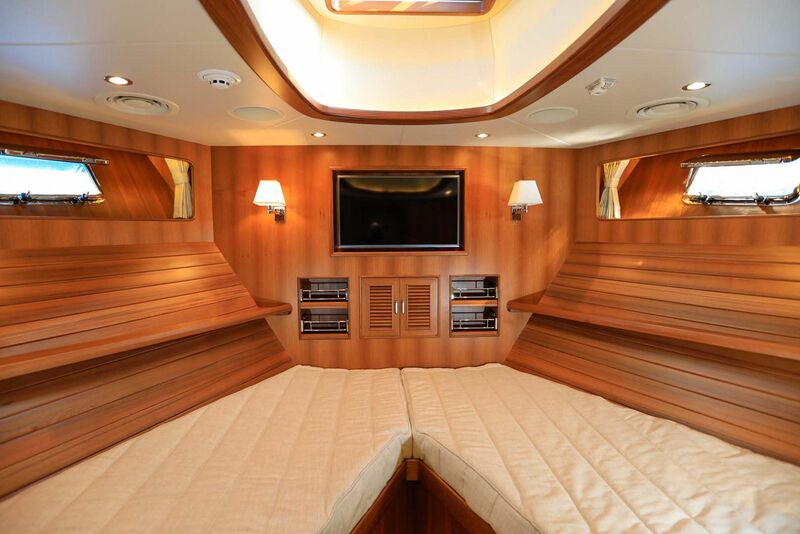 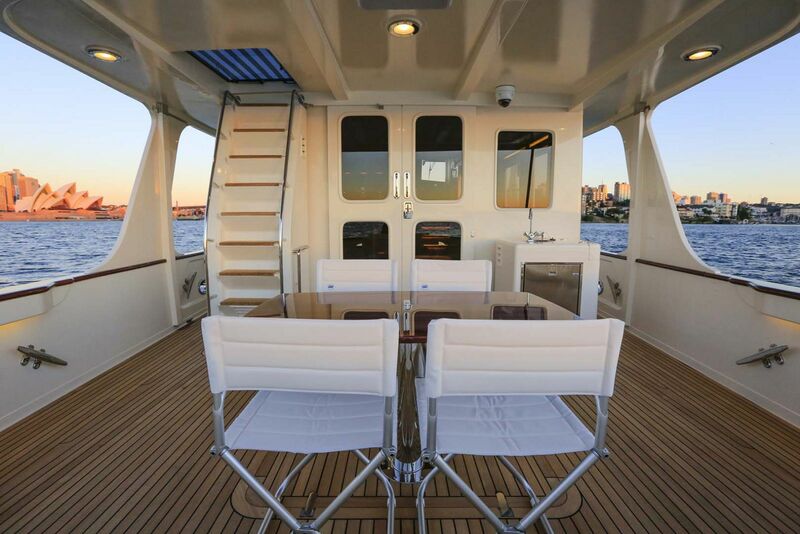 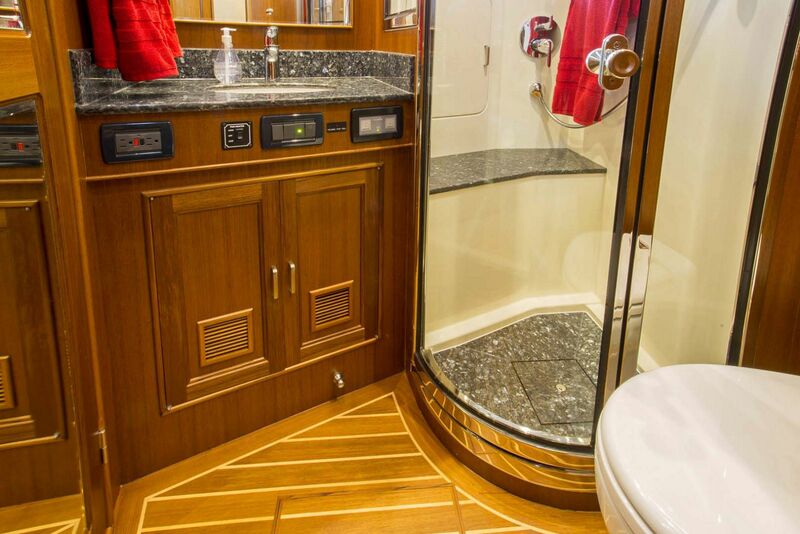 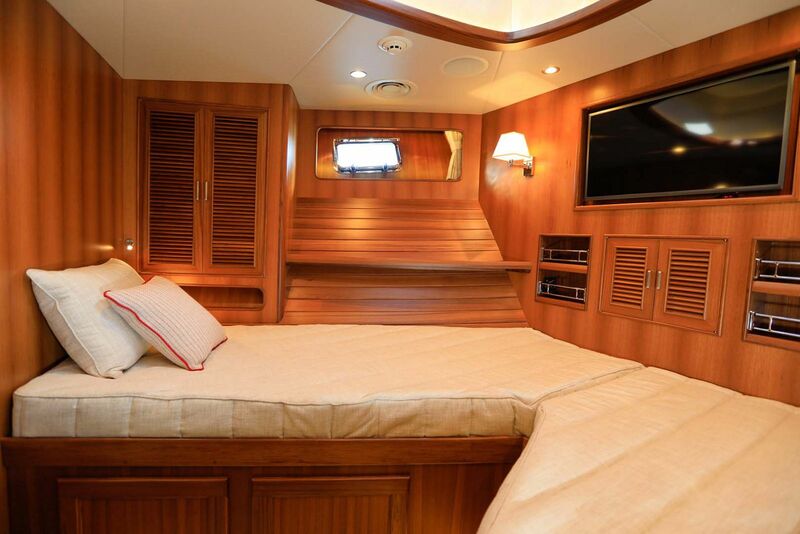 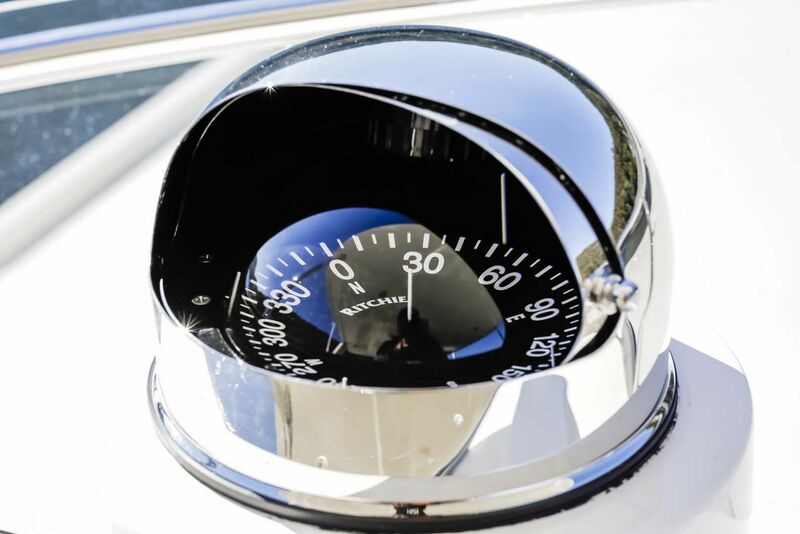 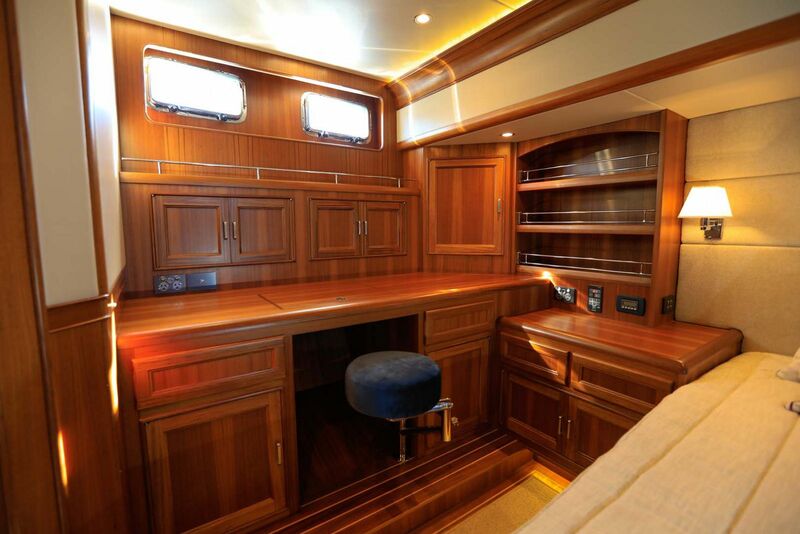 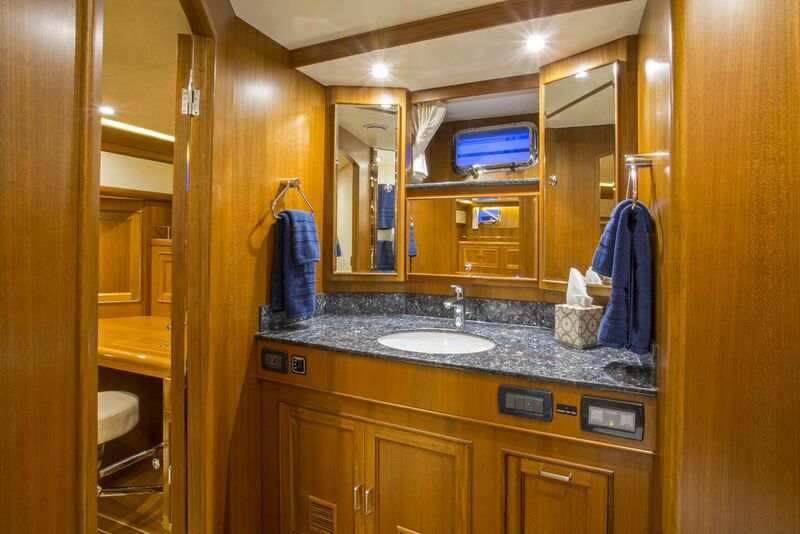 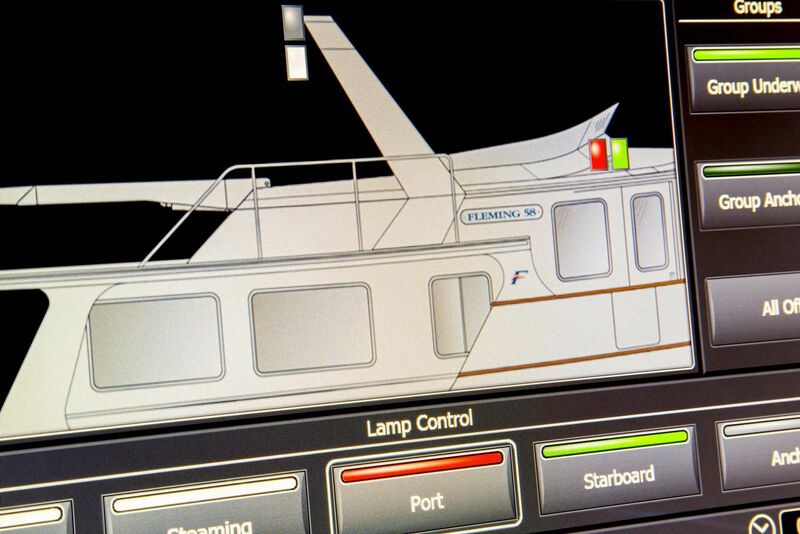 More Space - The wider pilothouse, has space for twin Stidd helm seats. 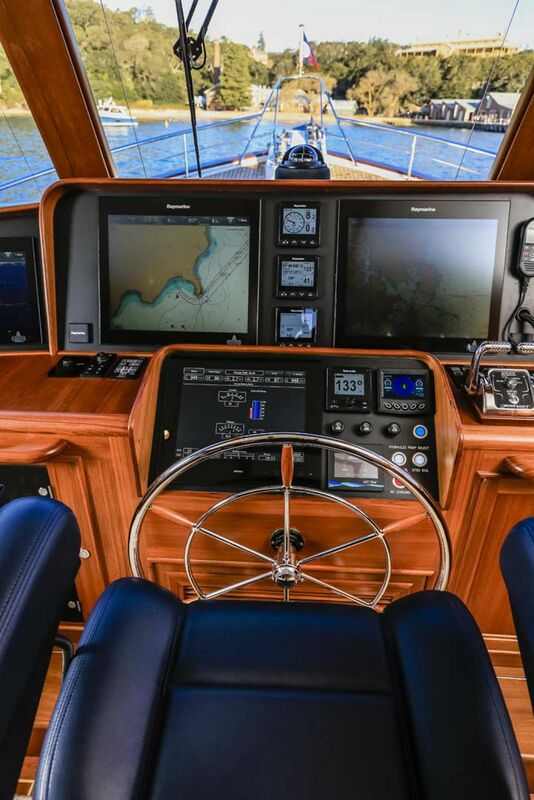 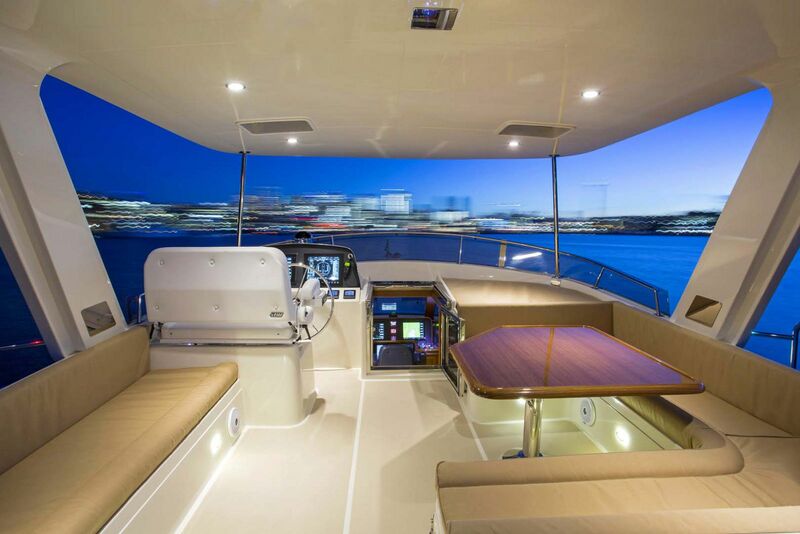 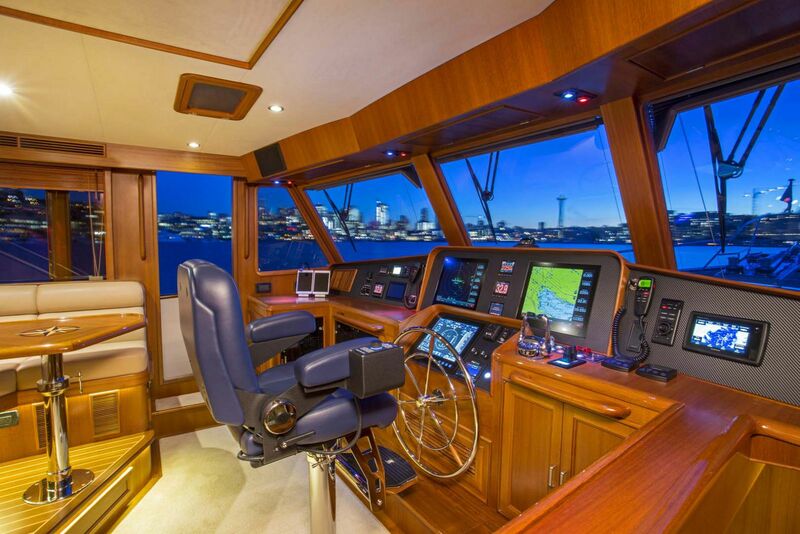 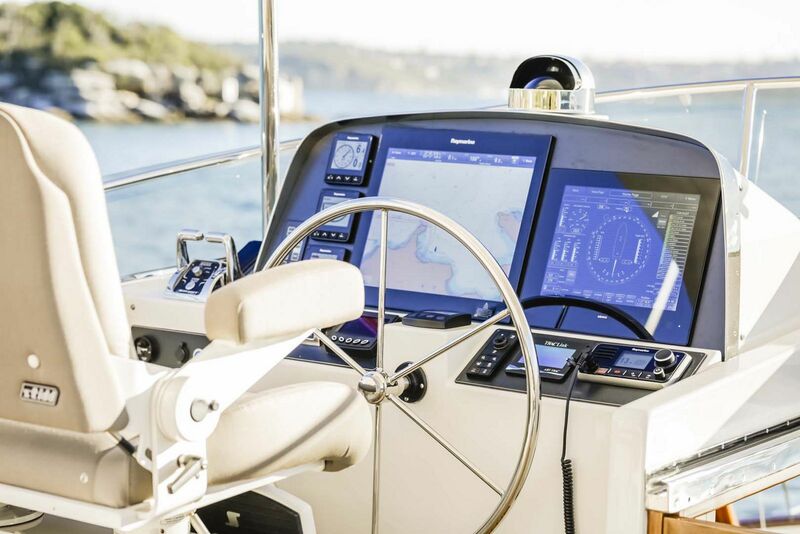 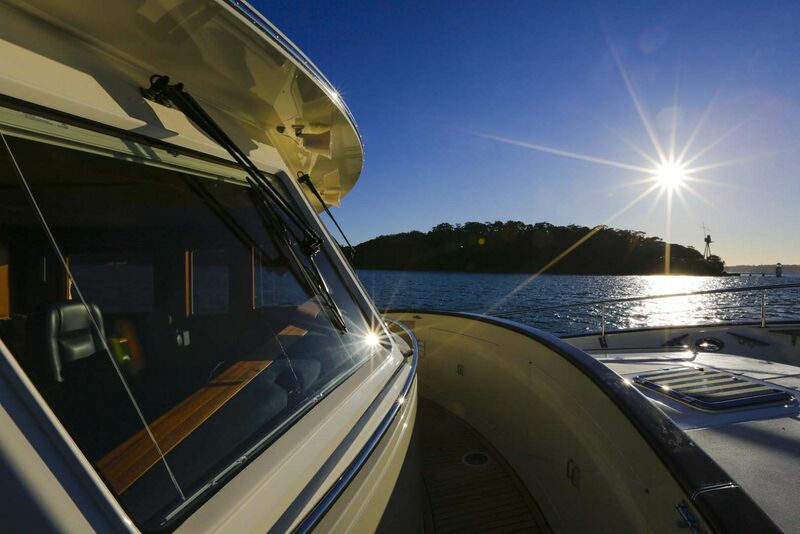 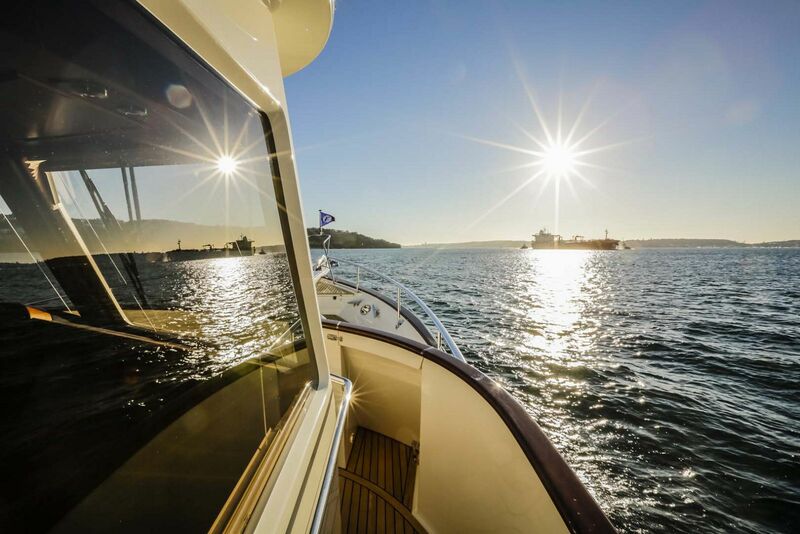 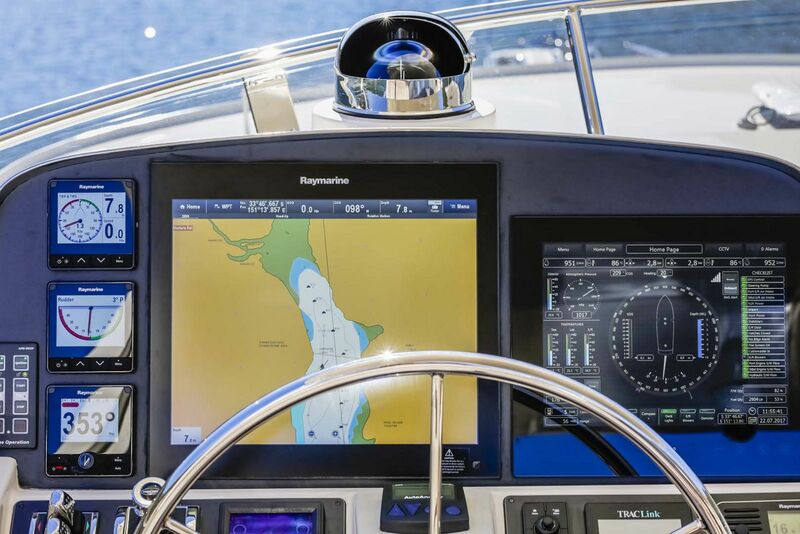 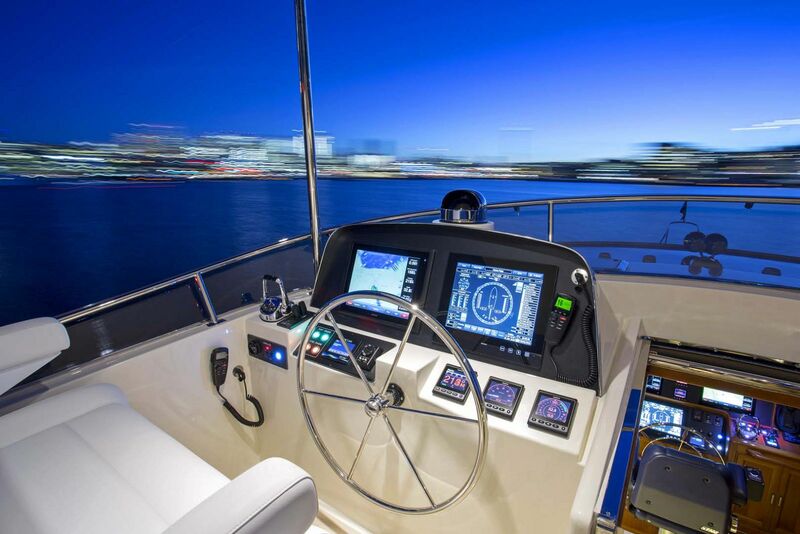 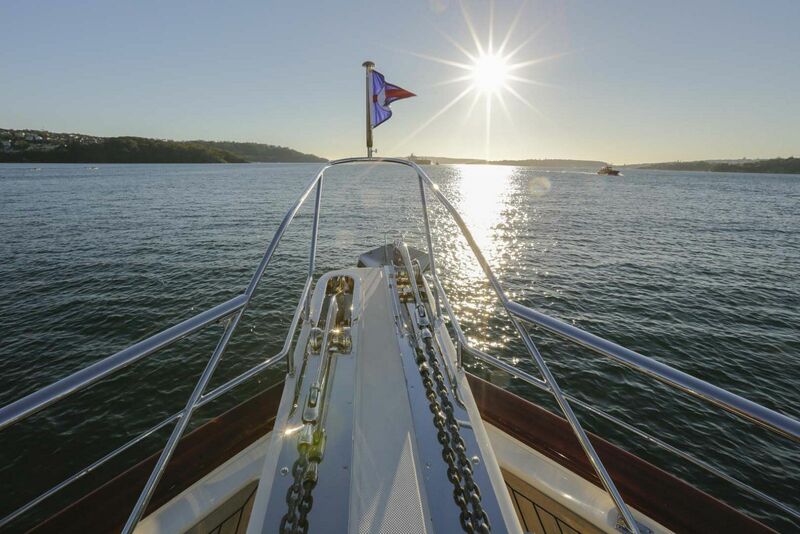 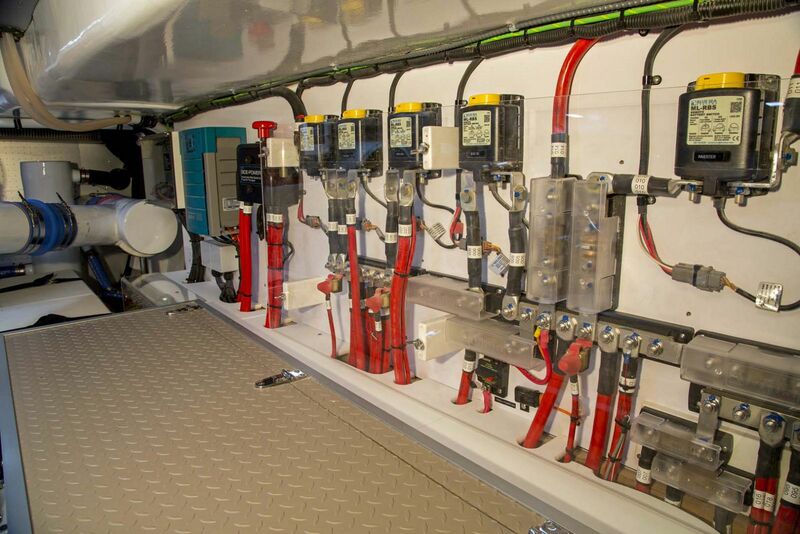 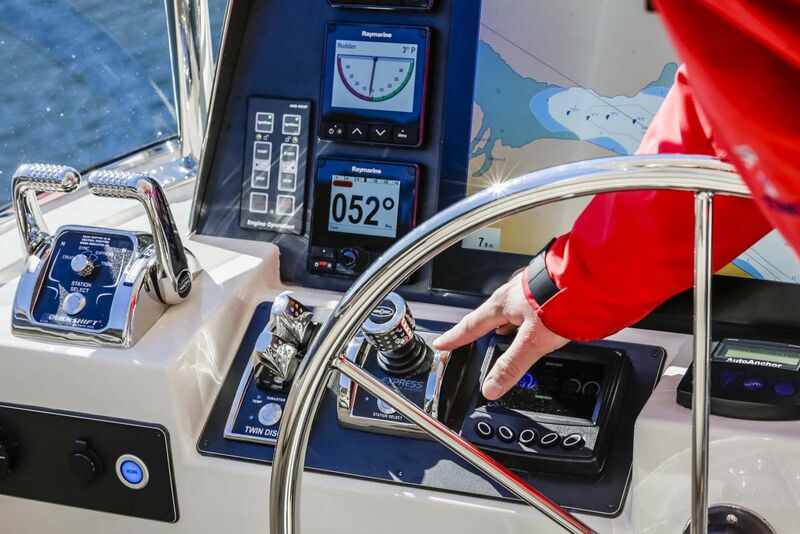 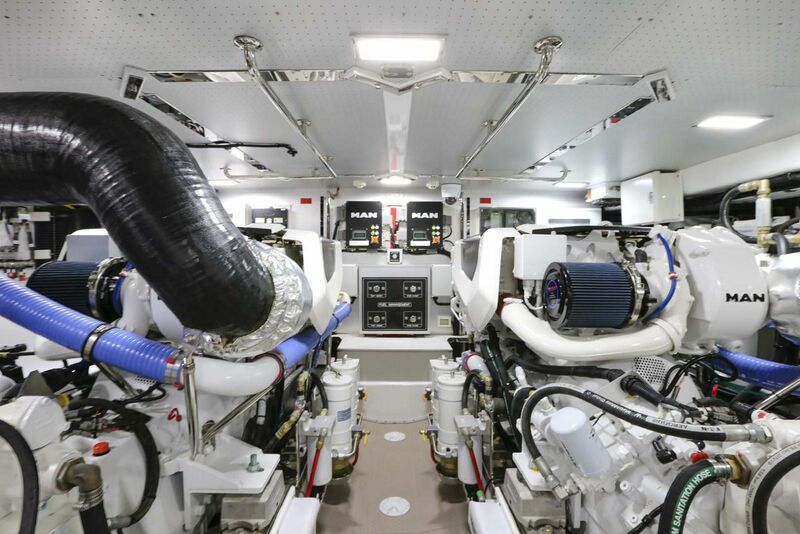 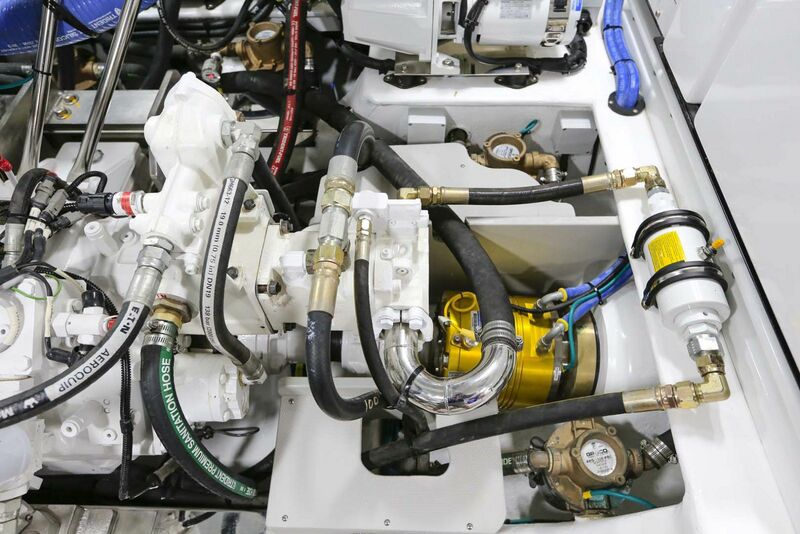 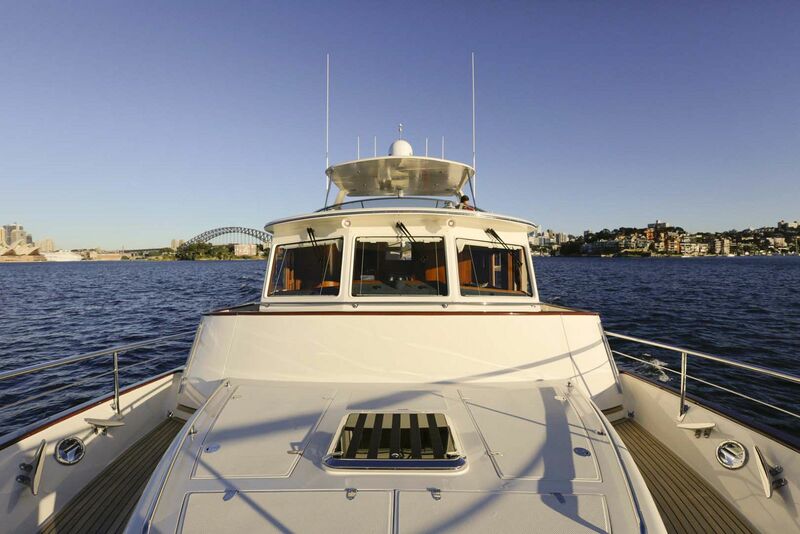 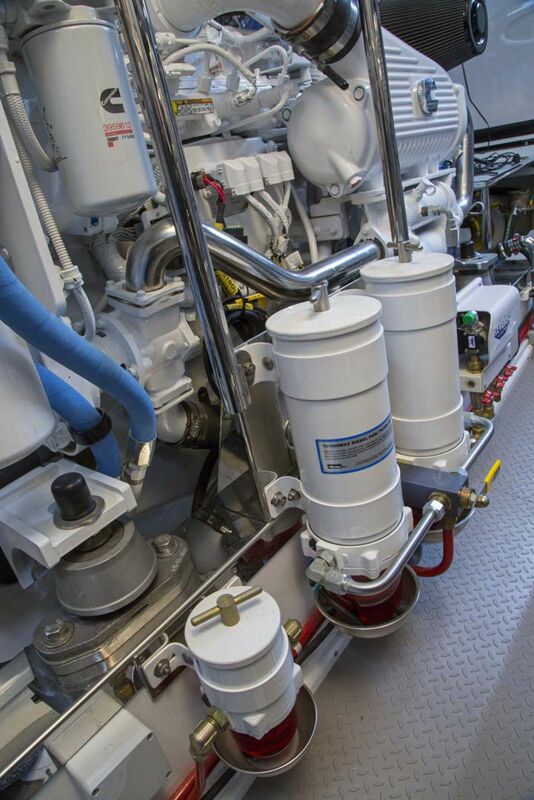 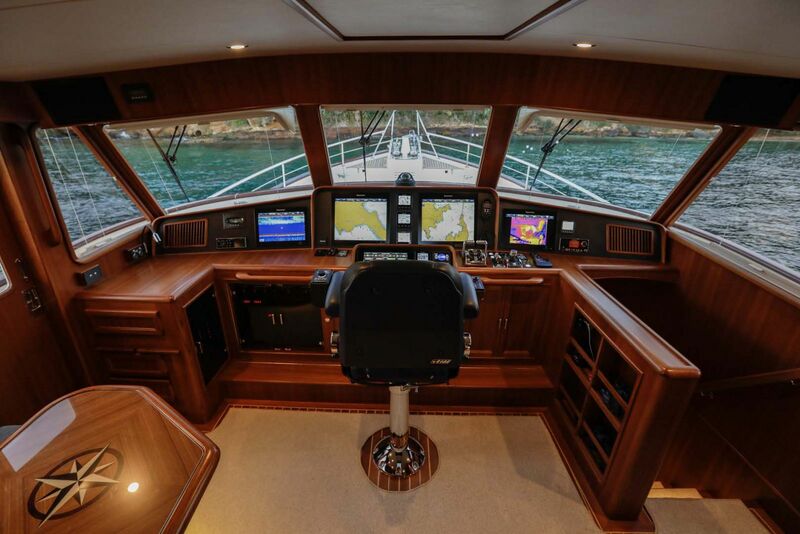 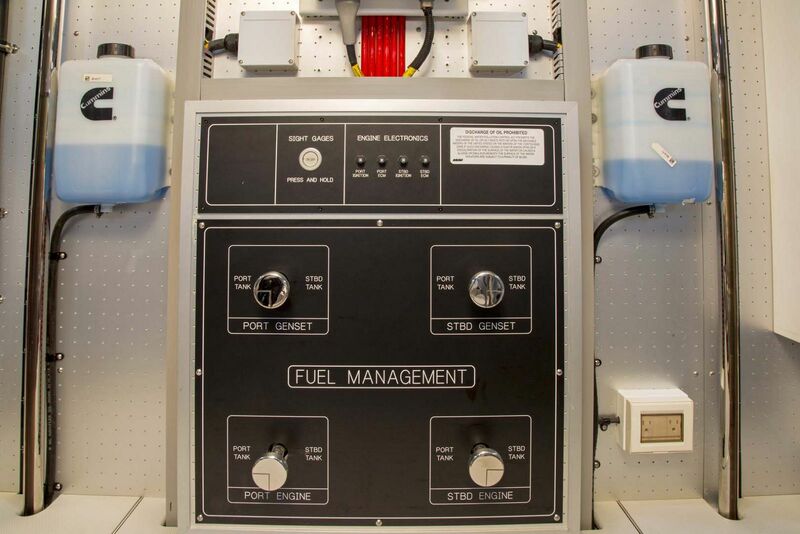 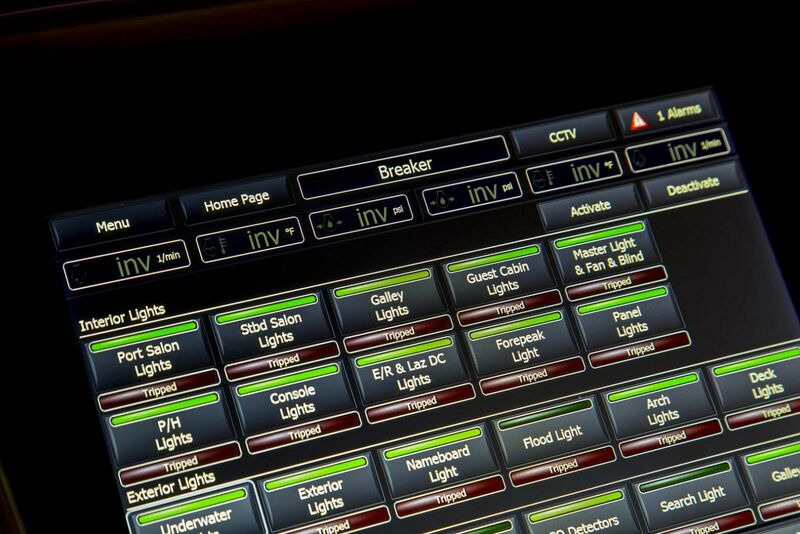 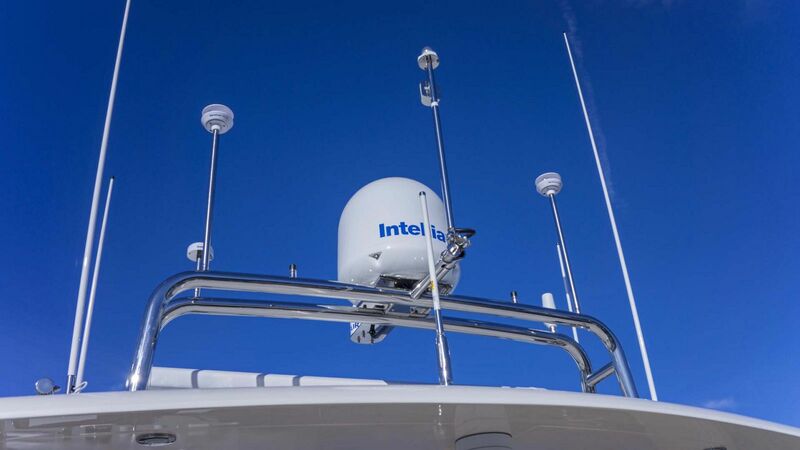 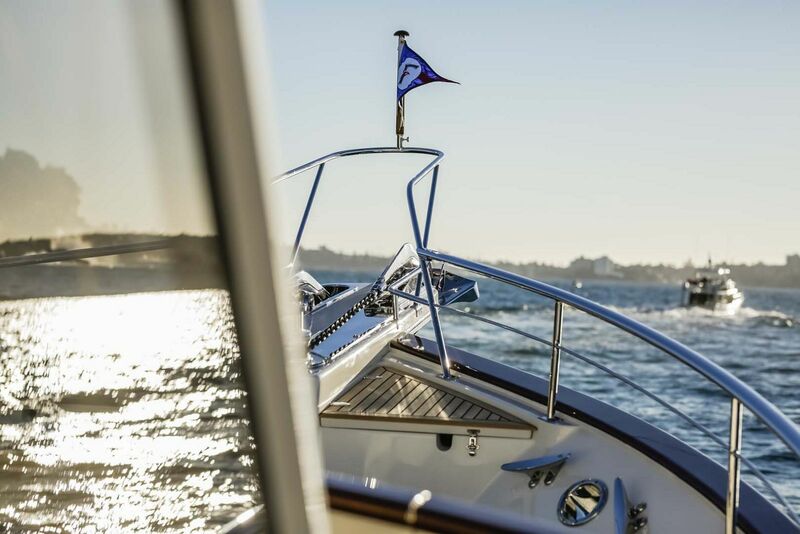 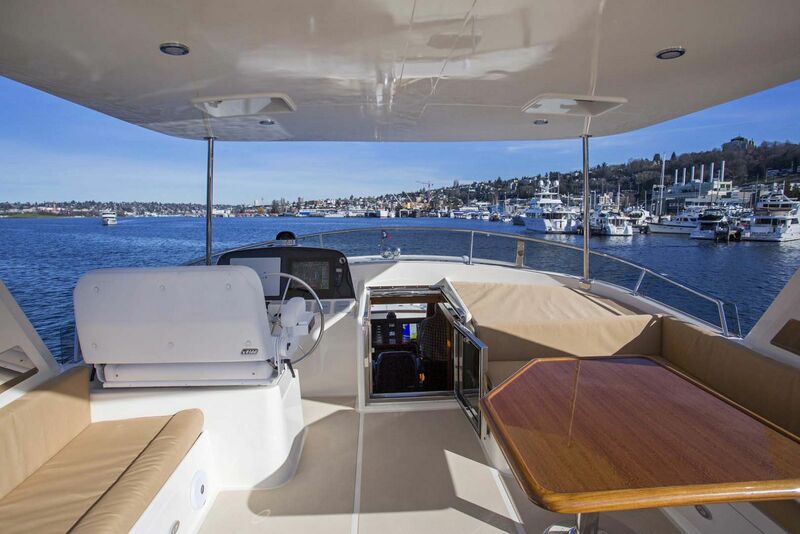 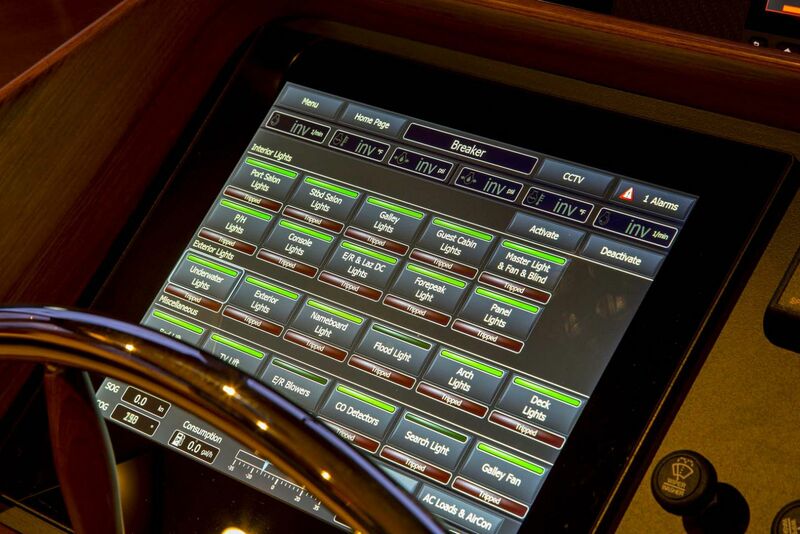 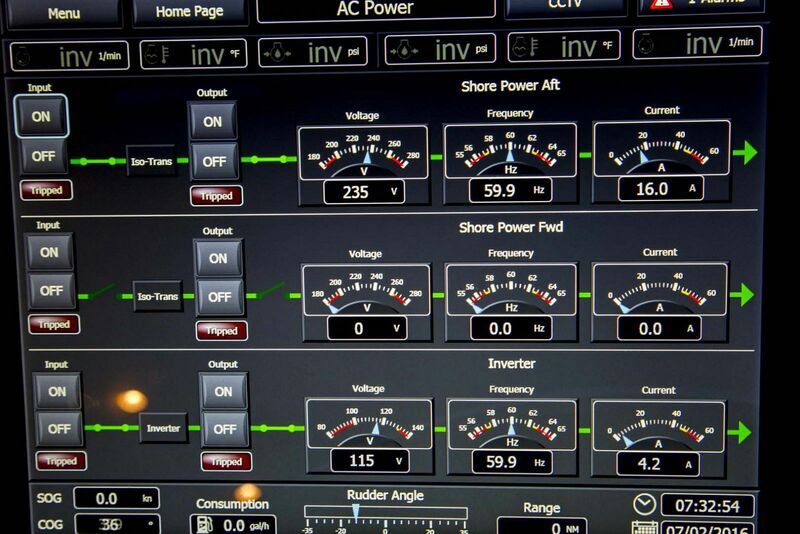 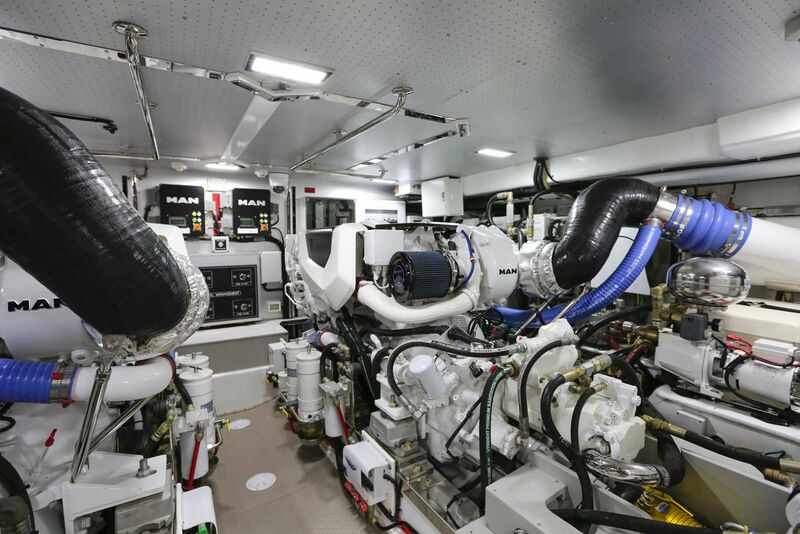 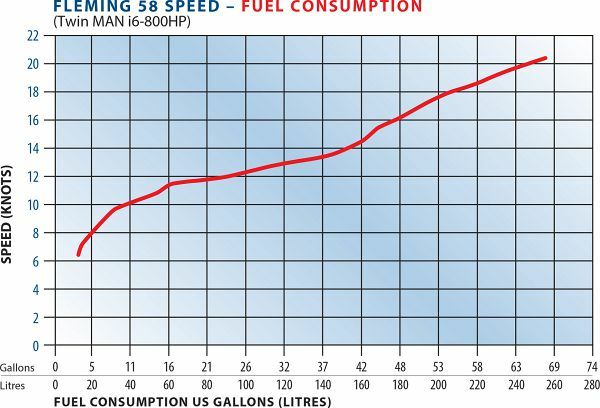 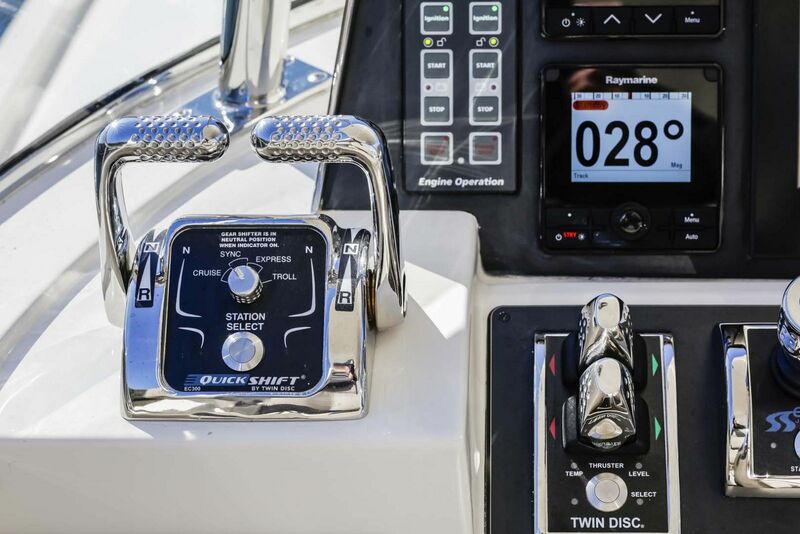 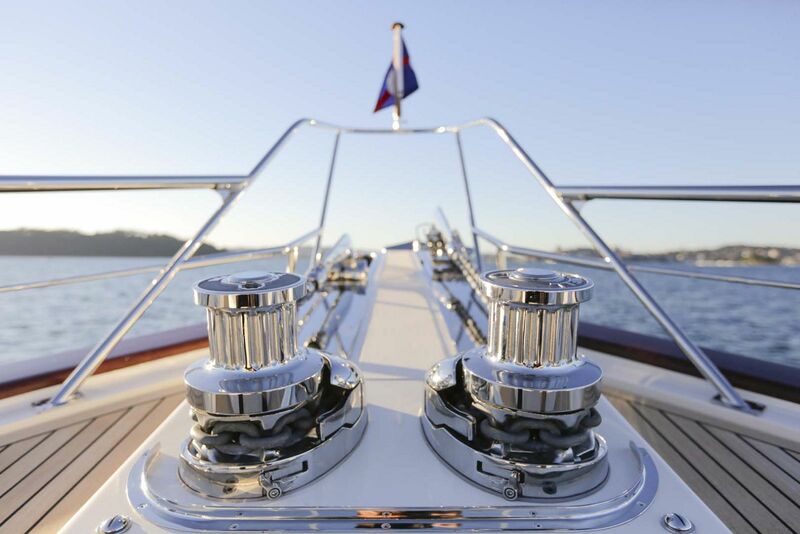 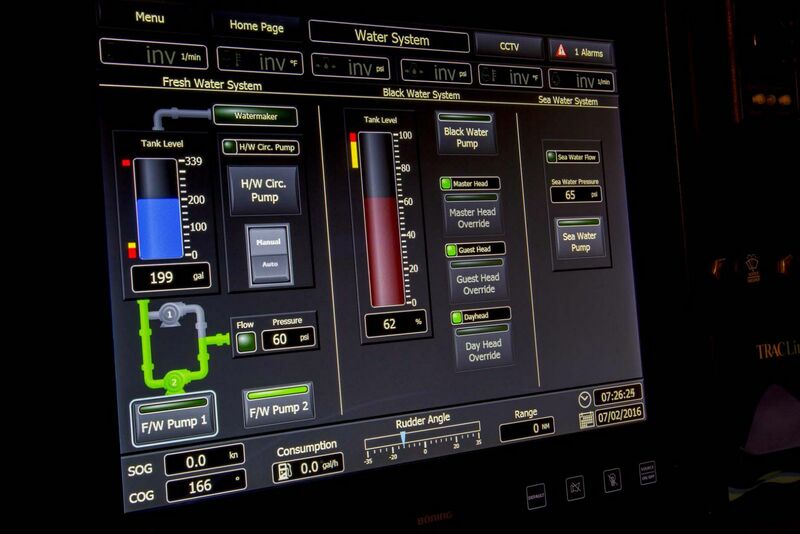 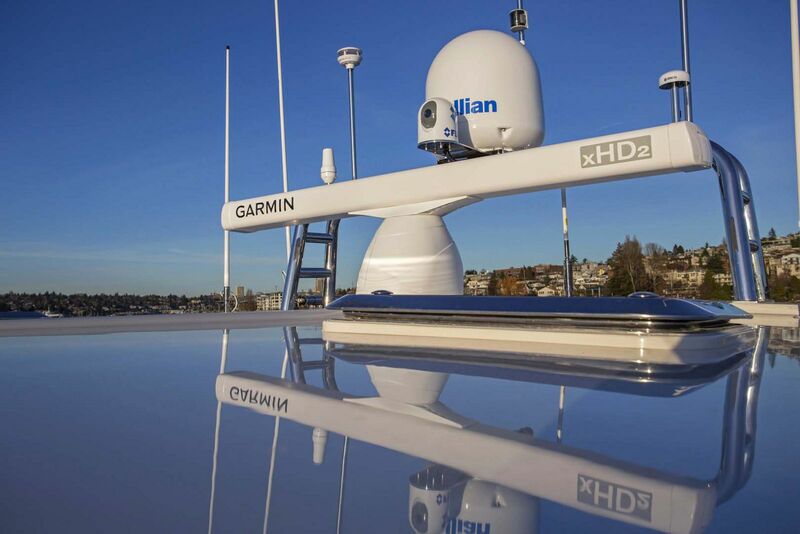 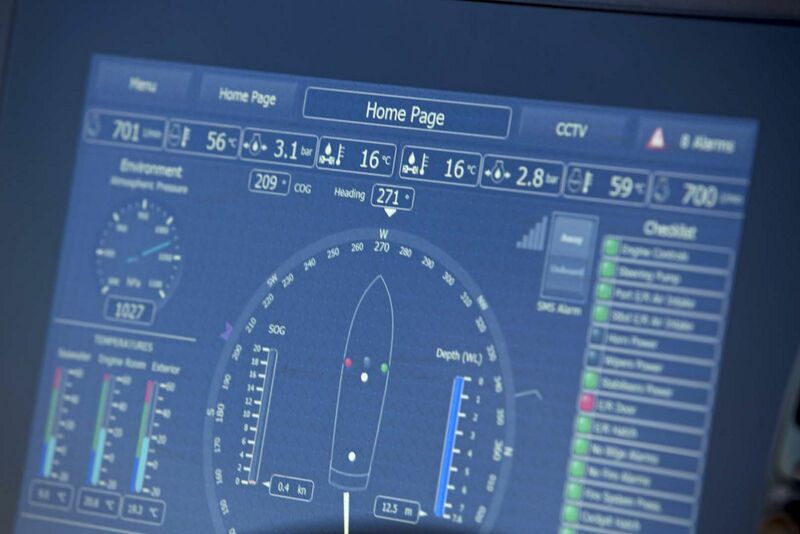 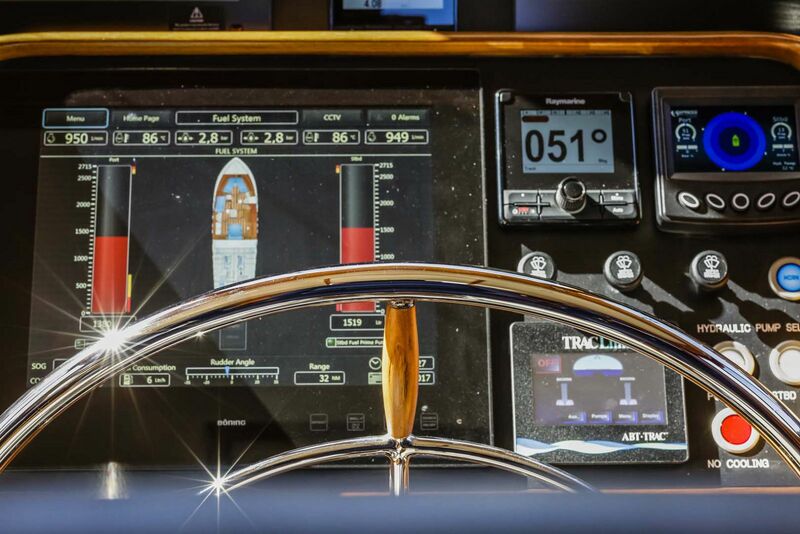 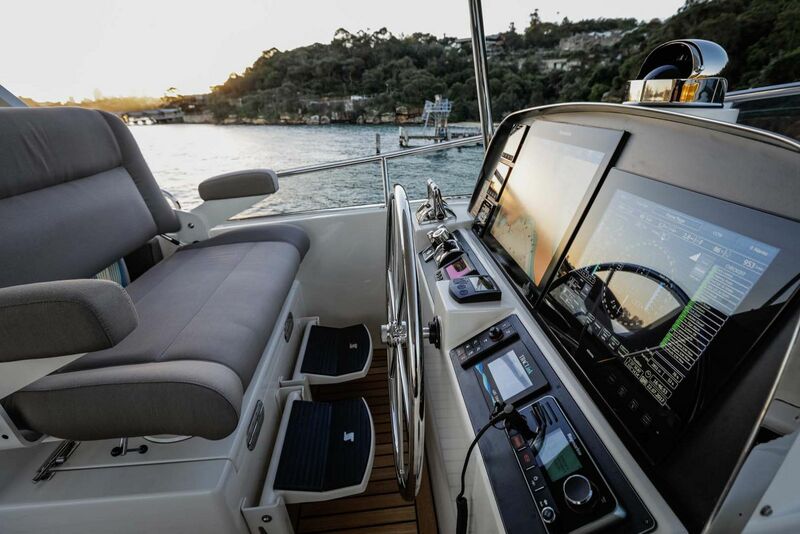 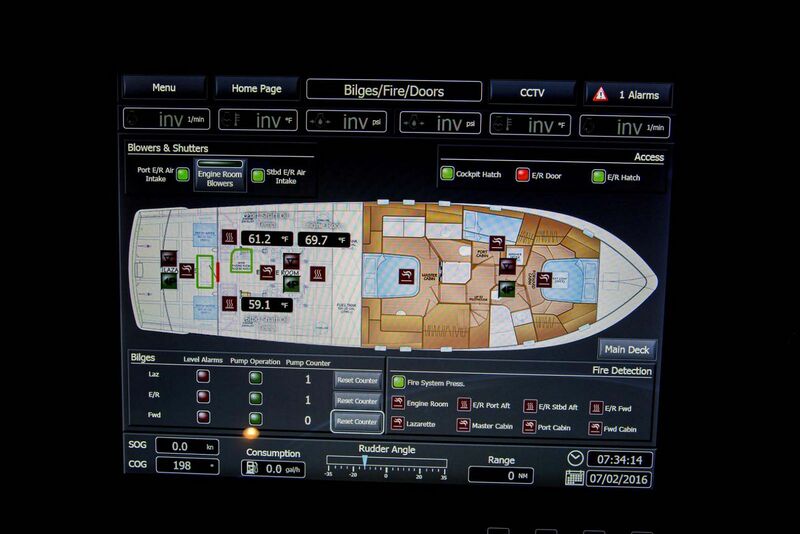 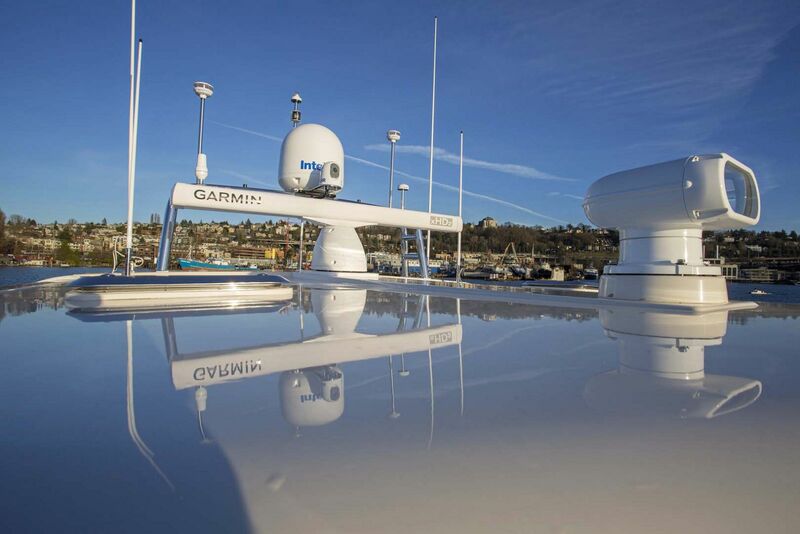 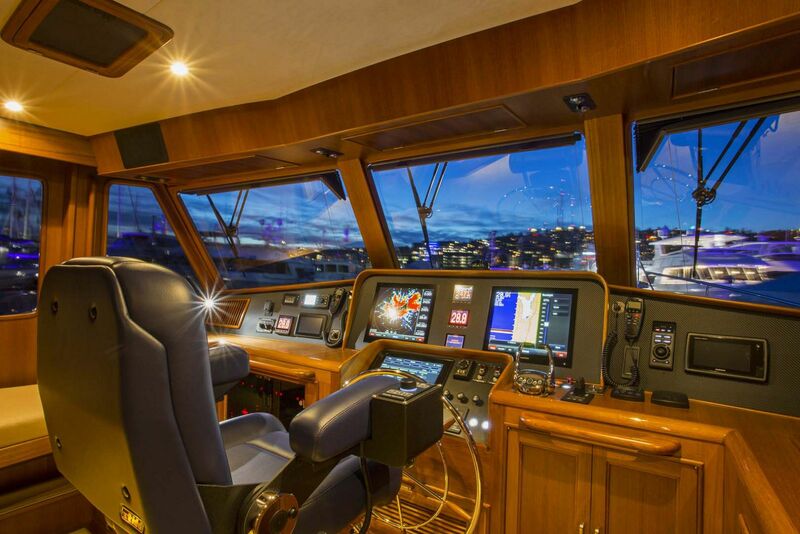 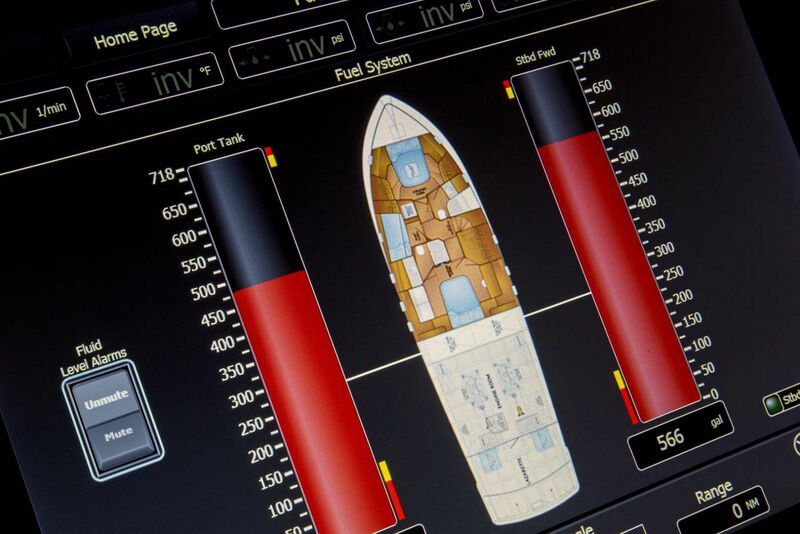 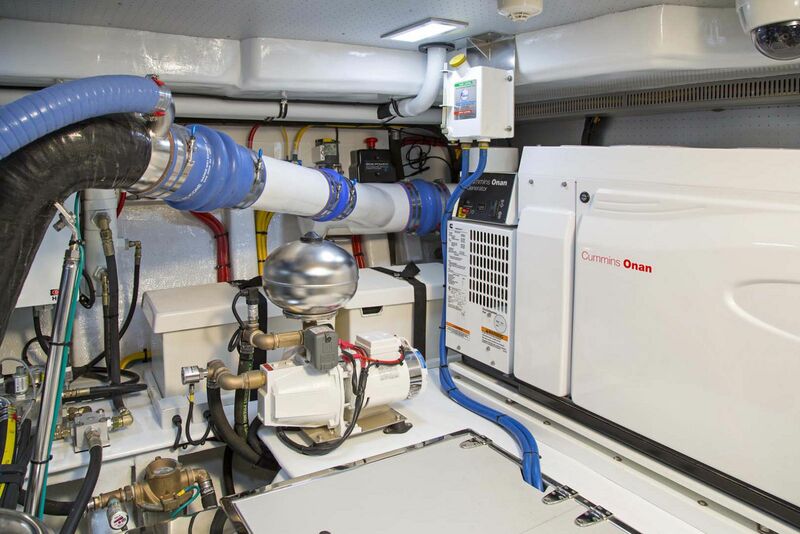 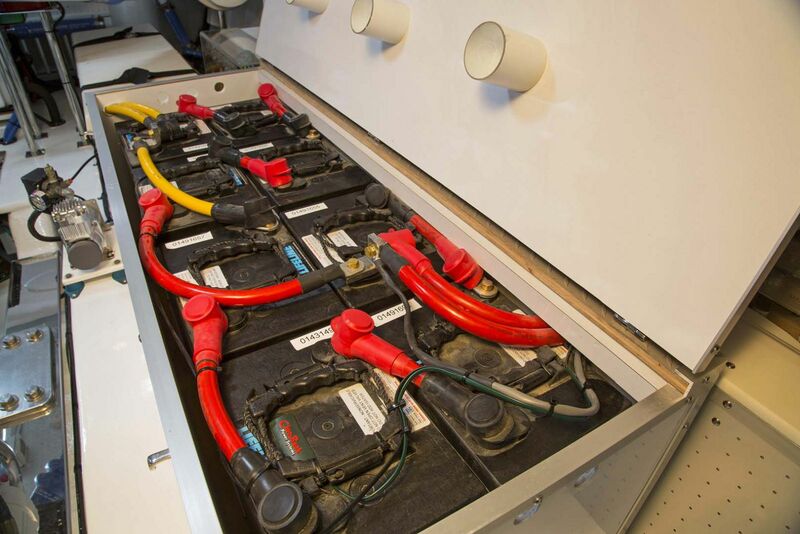 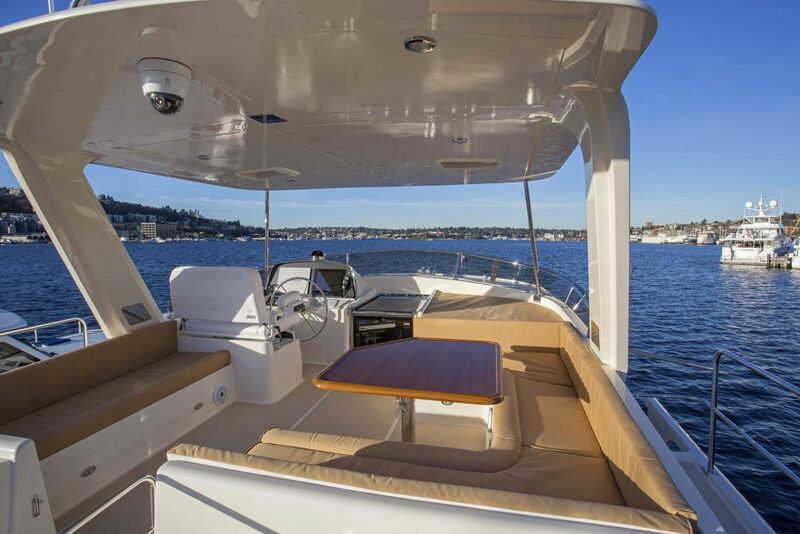 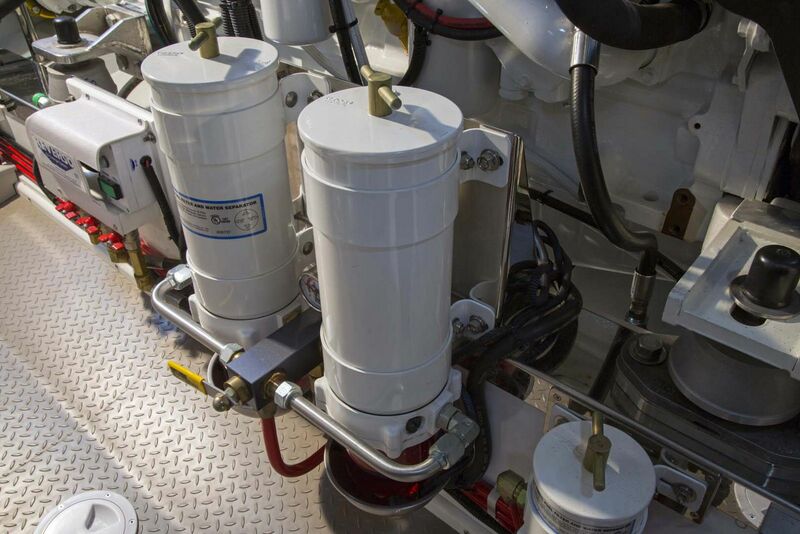 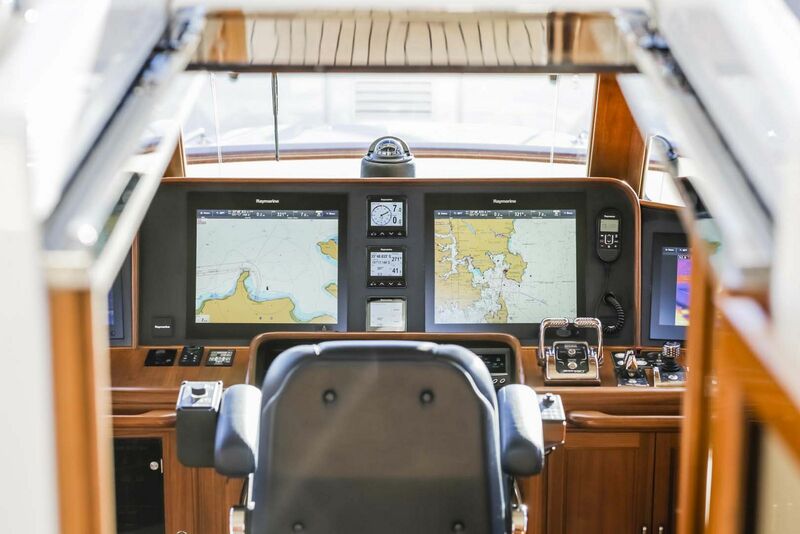 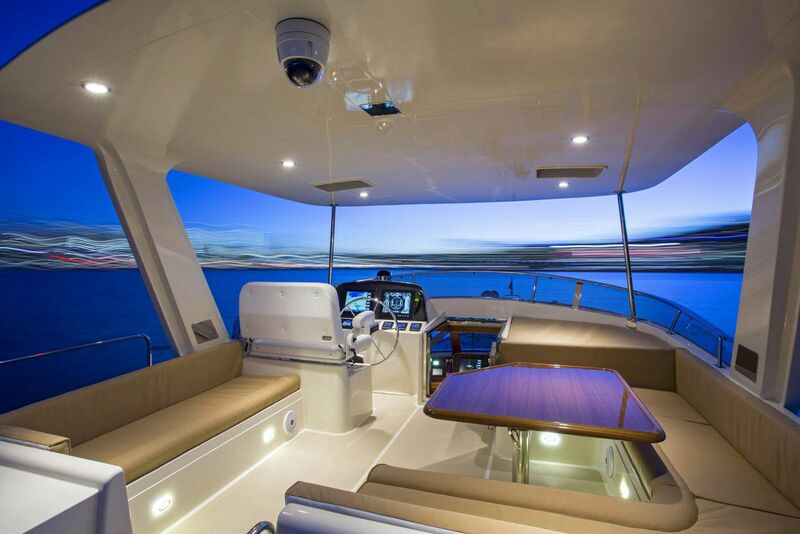 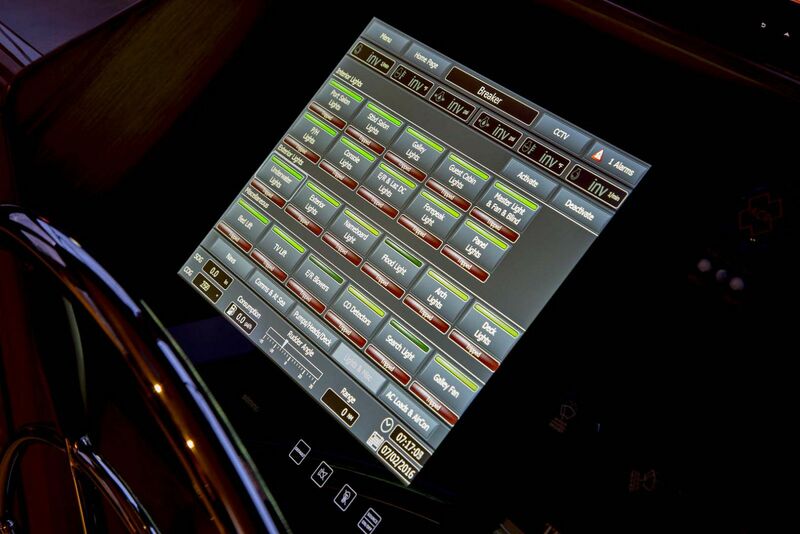 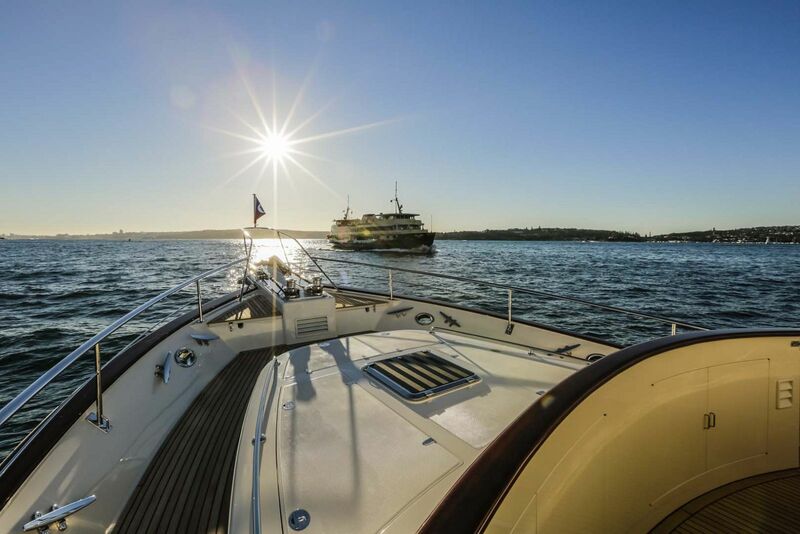 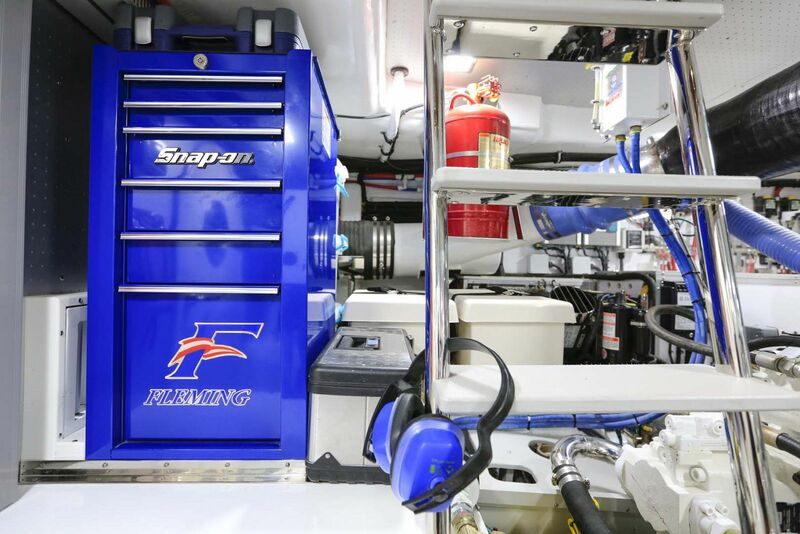 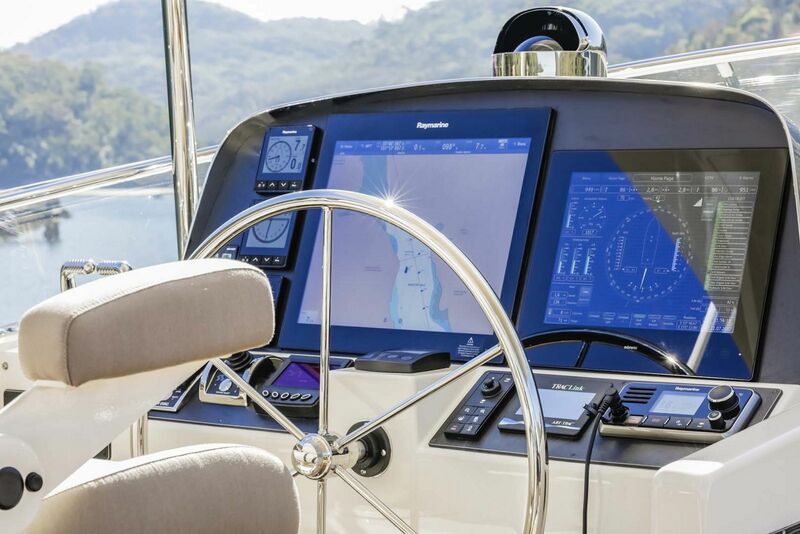 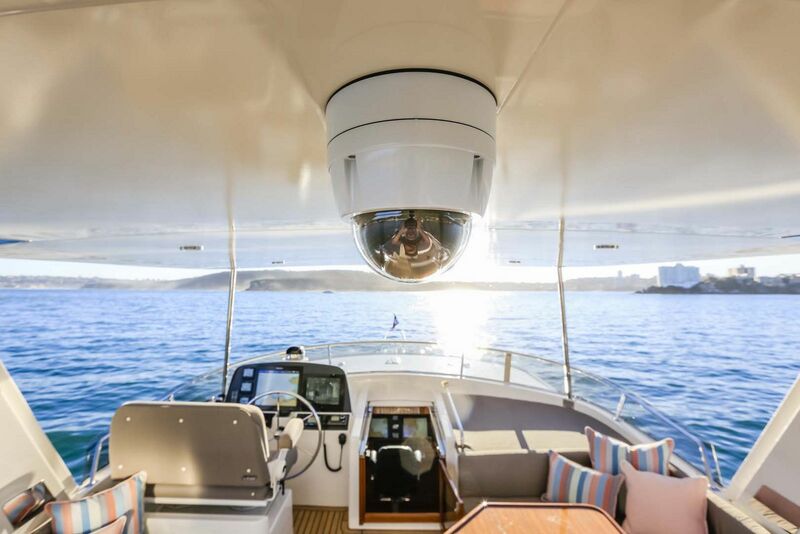 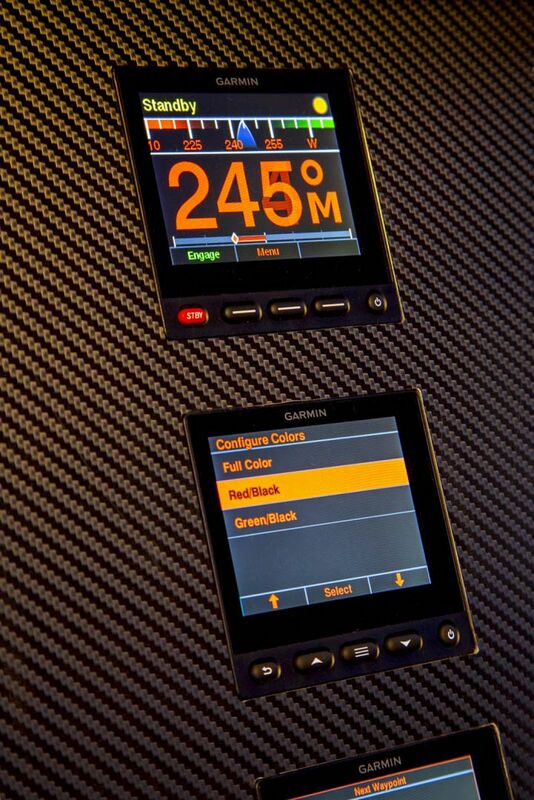 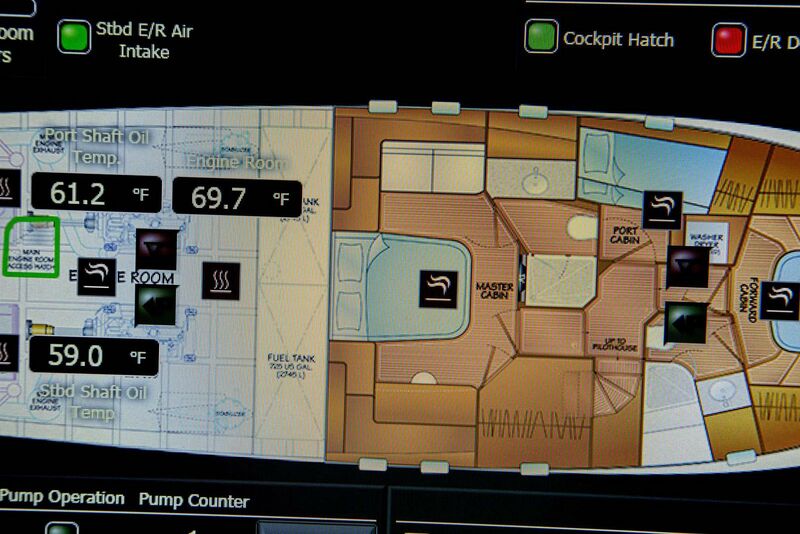 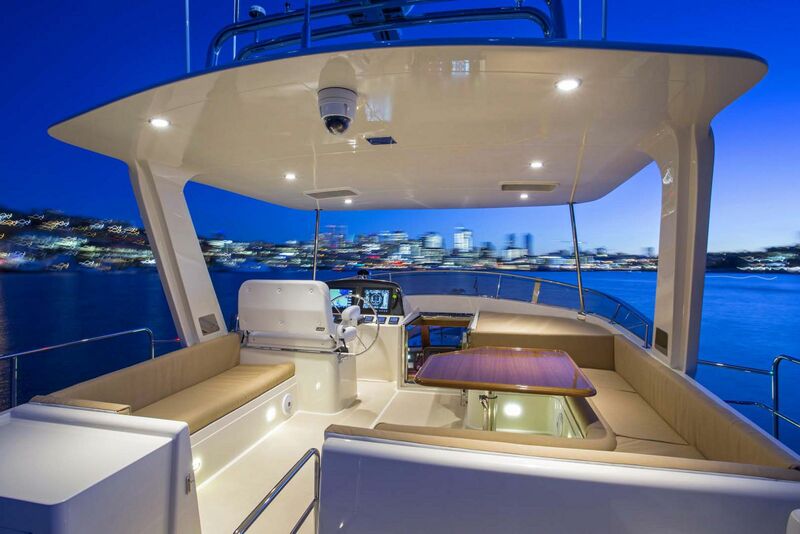 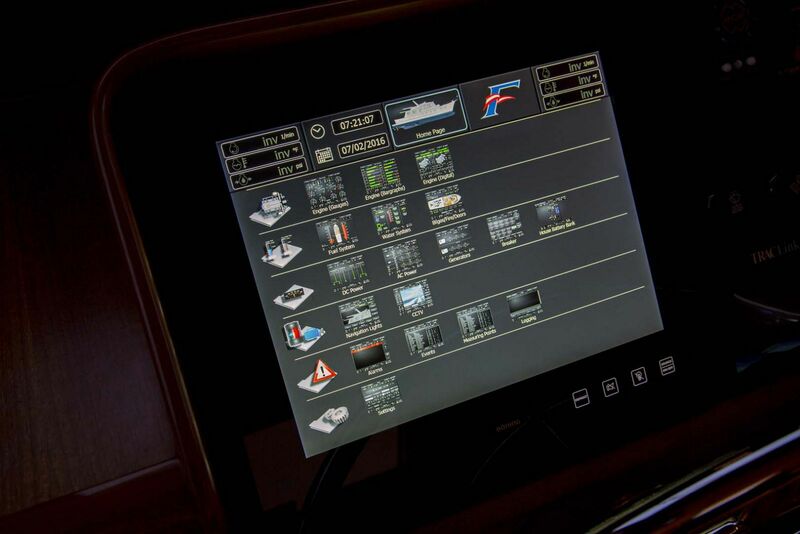 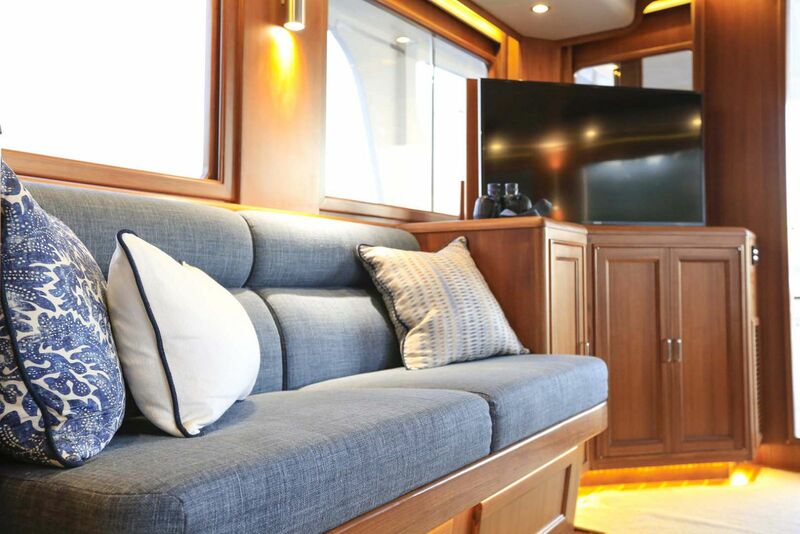 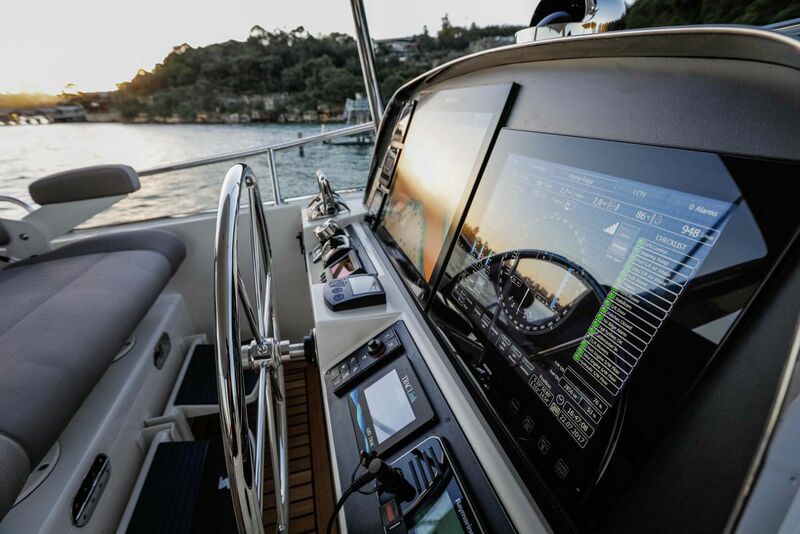 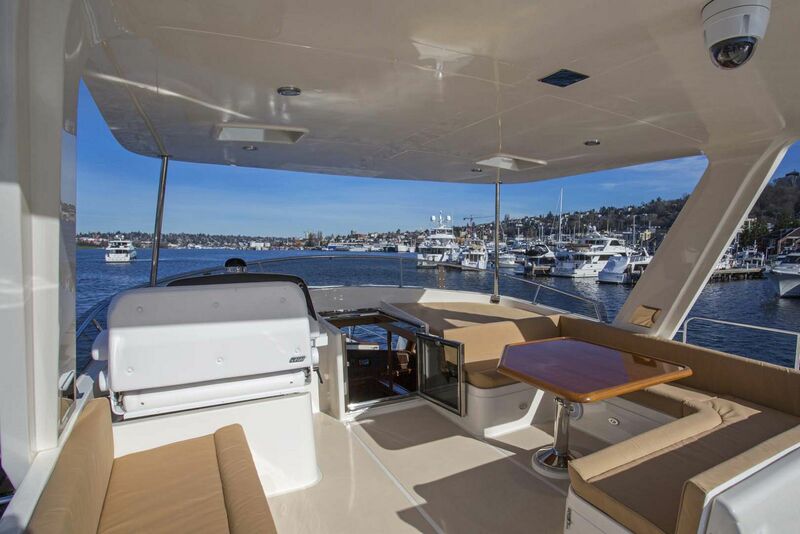 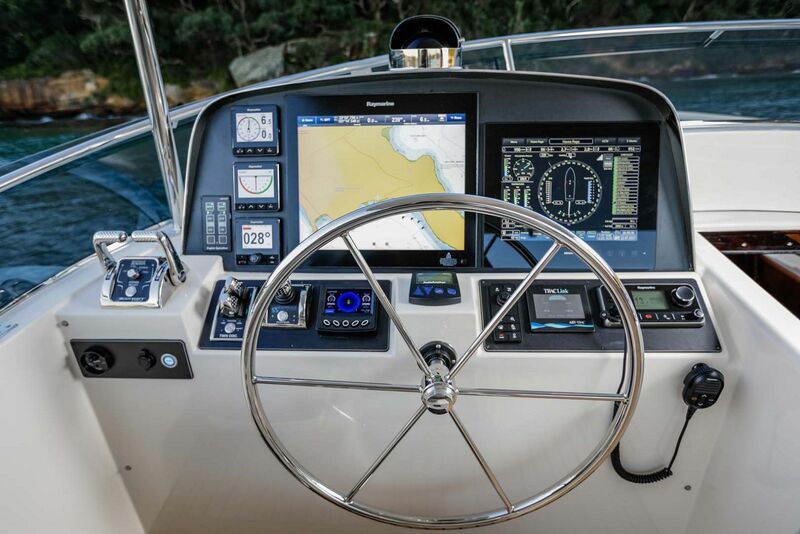 The 58 employs much of the same technology used in the Fleming 65 including the Fleming First Mater (FFM) ship monitoring system with two 15" color touchscreens, Hypro fly-by-wire precision power steering, and Seatorque's enclosed shaft system. 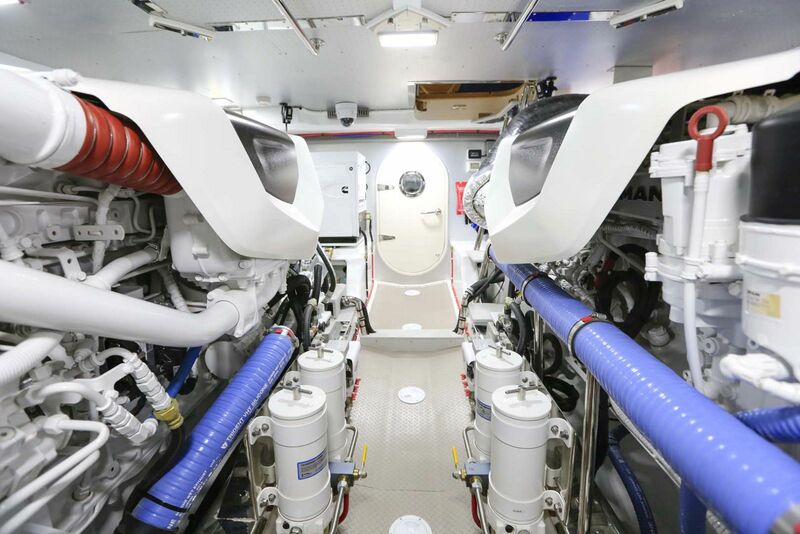 Significantly more headroom in the engine room and more space forward and outboard of the engines. 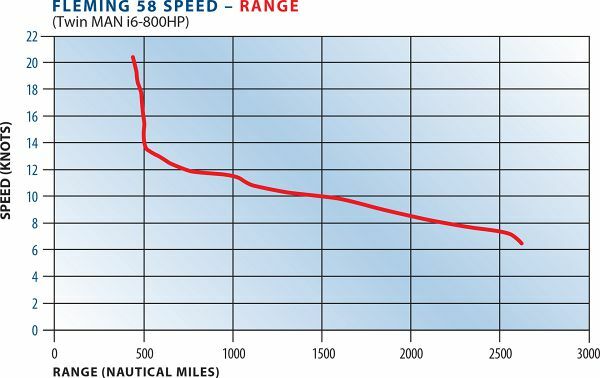 The standard engines on the Fleming 58 are the MAN i6-800. 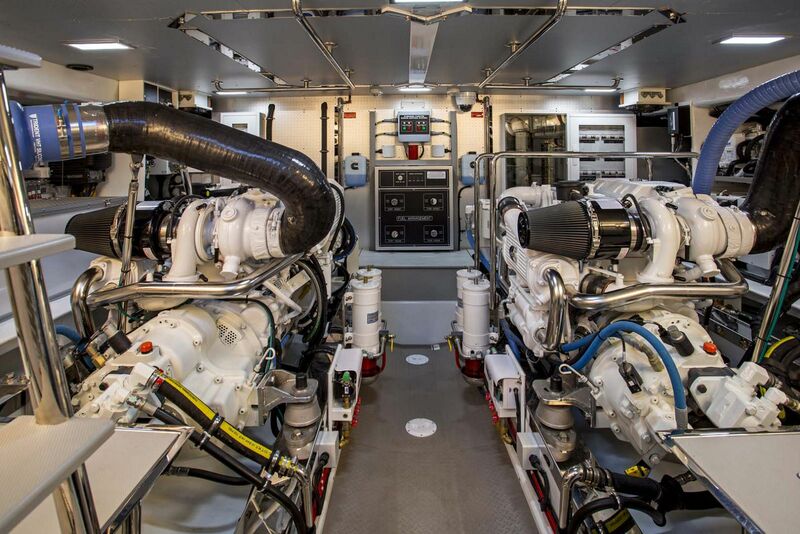 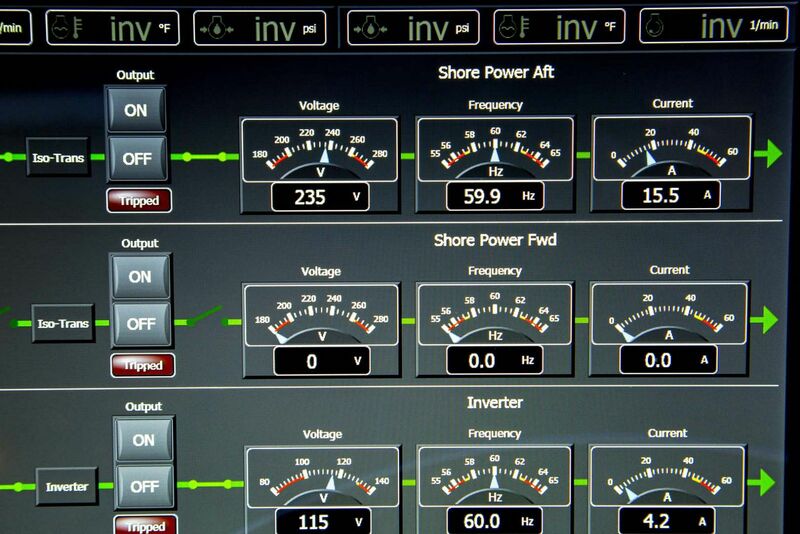 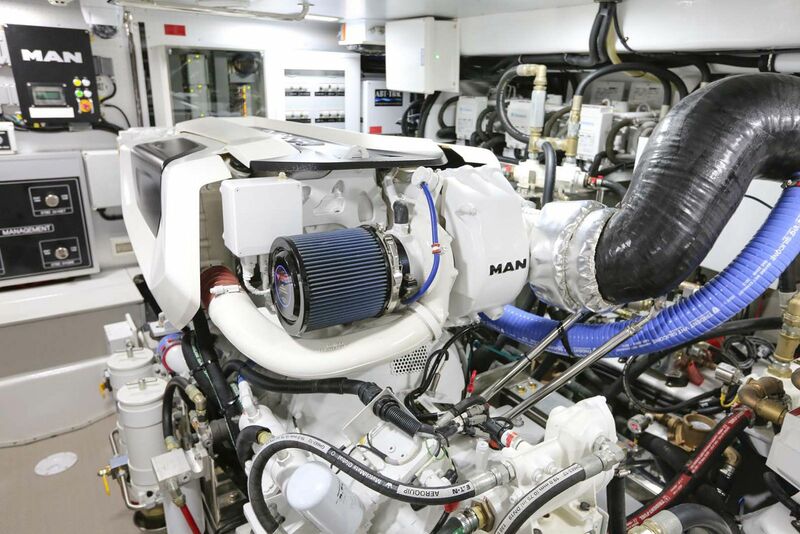 Standard Power is a pair of MAN i6-800 engines. 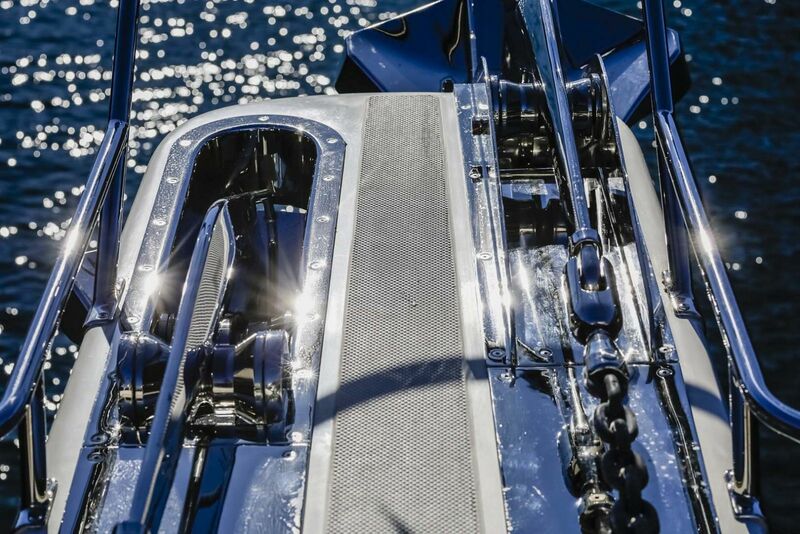 Standard equipment is the very efficient Seatorque shaft system which transfers thrust from the propellers directly to the hull structure and eliminates the need for cutless bearings and stuffing boxes. 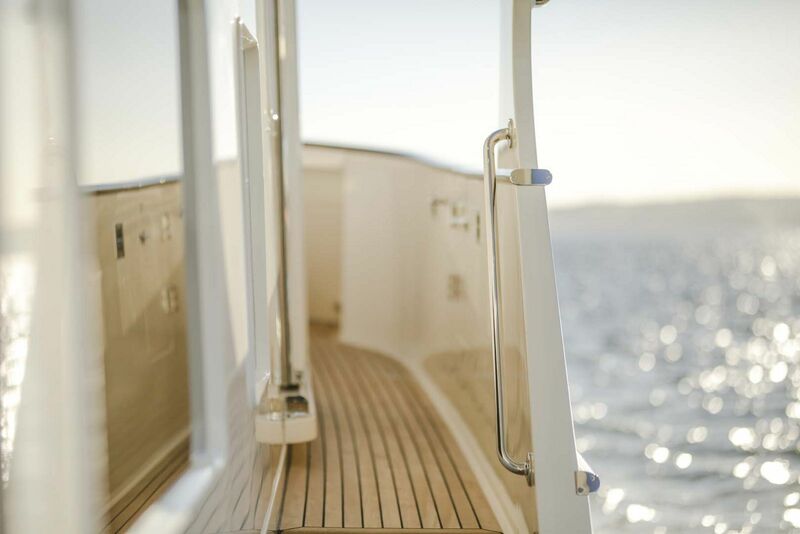 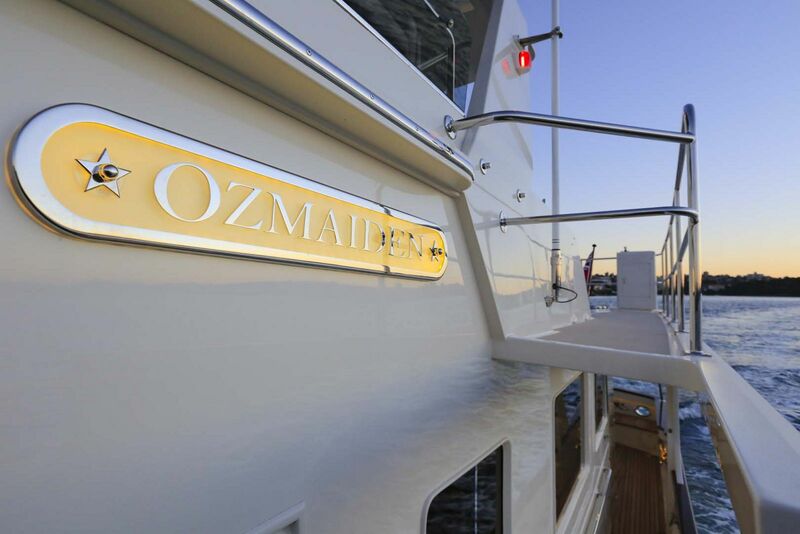 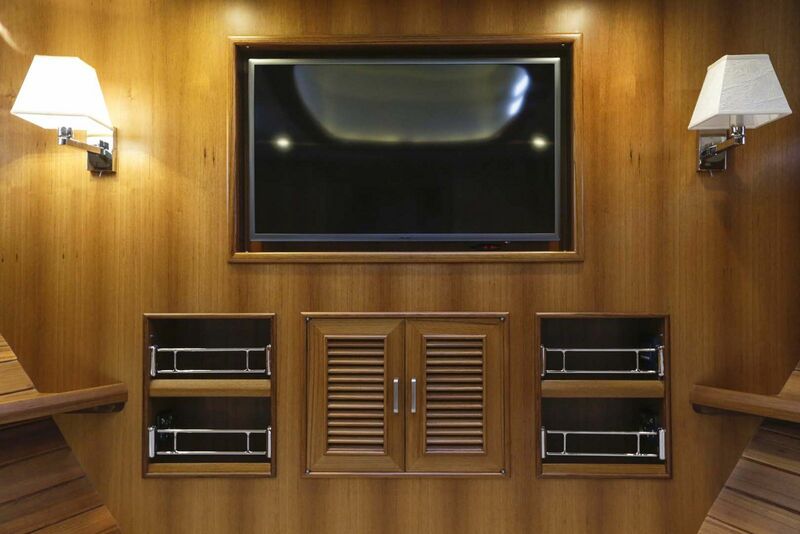 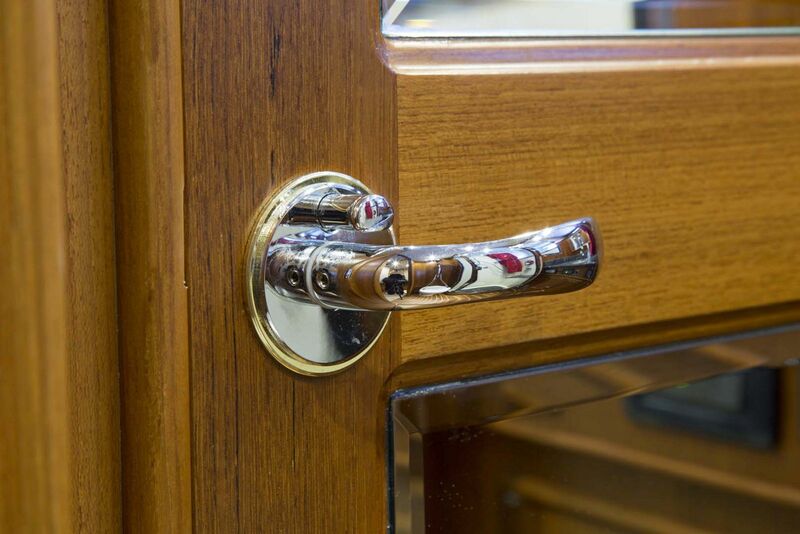 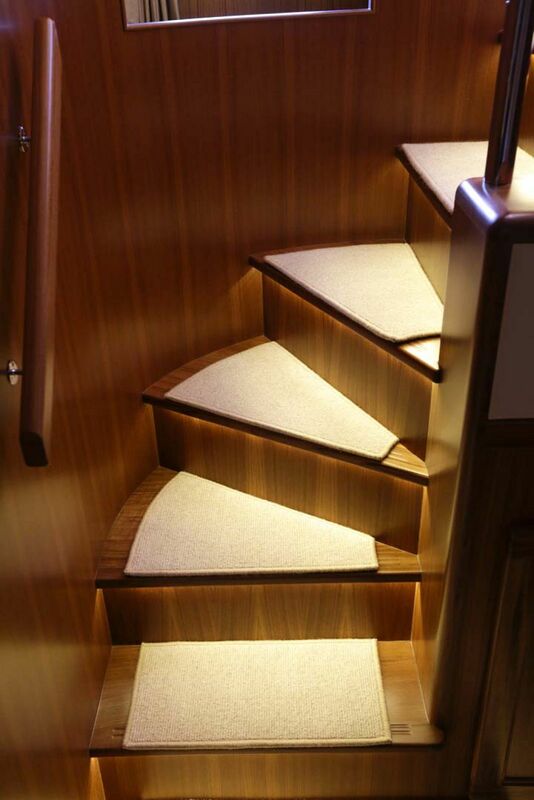 Proud Craftsmanship and a Passion for Yacht Building. 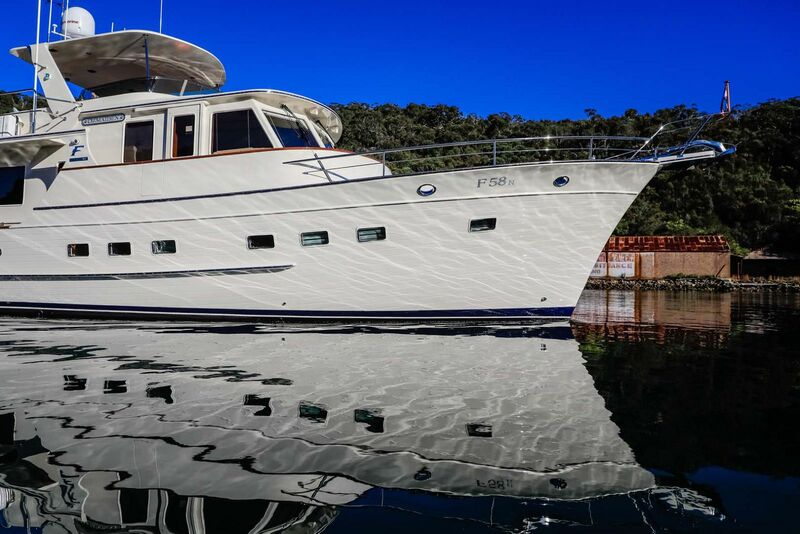 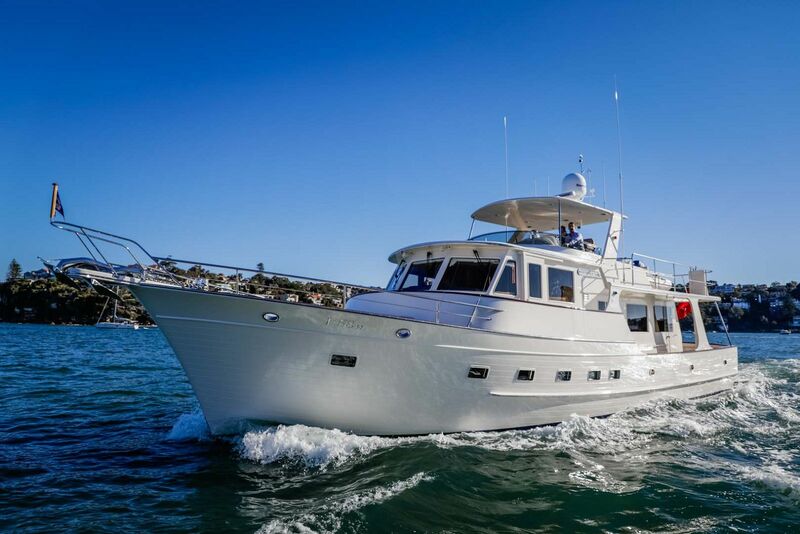 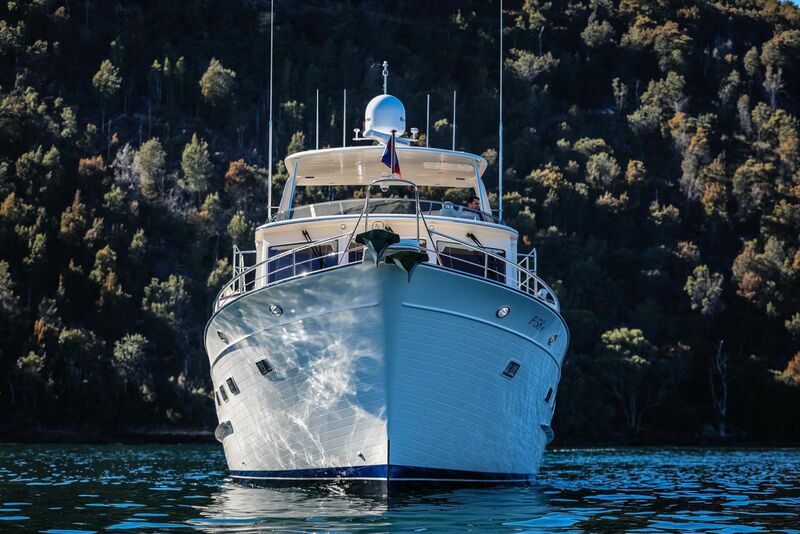 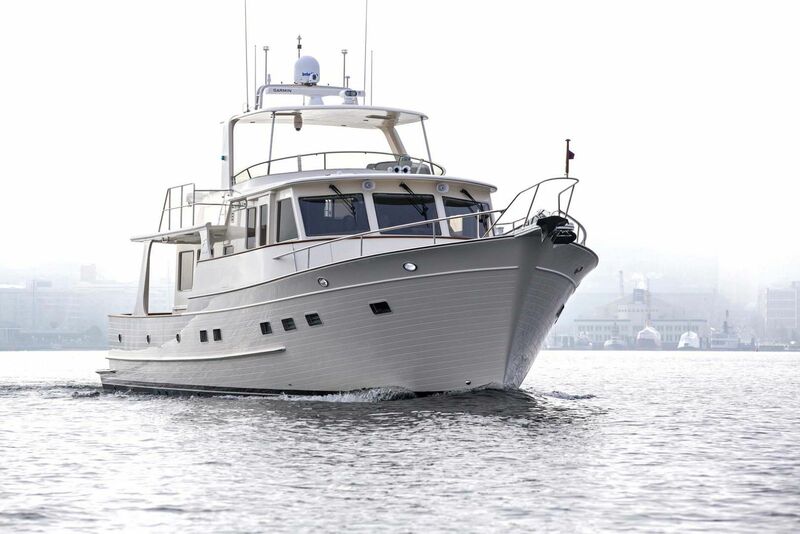 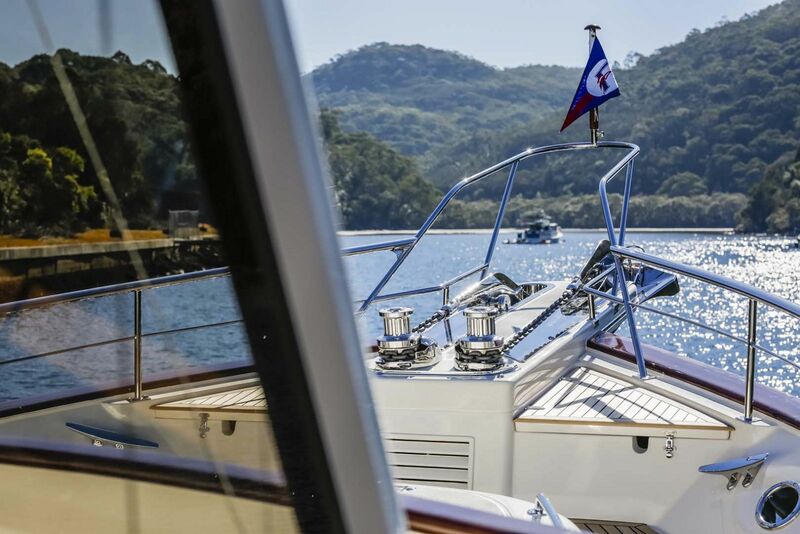 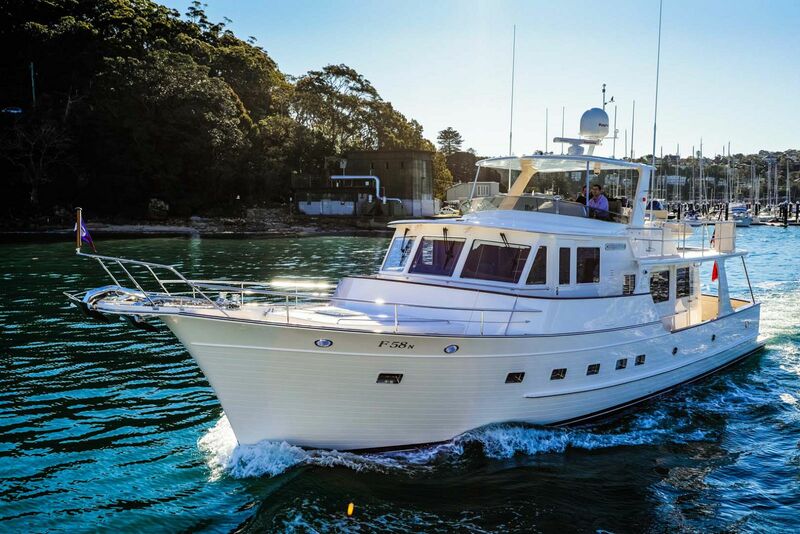 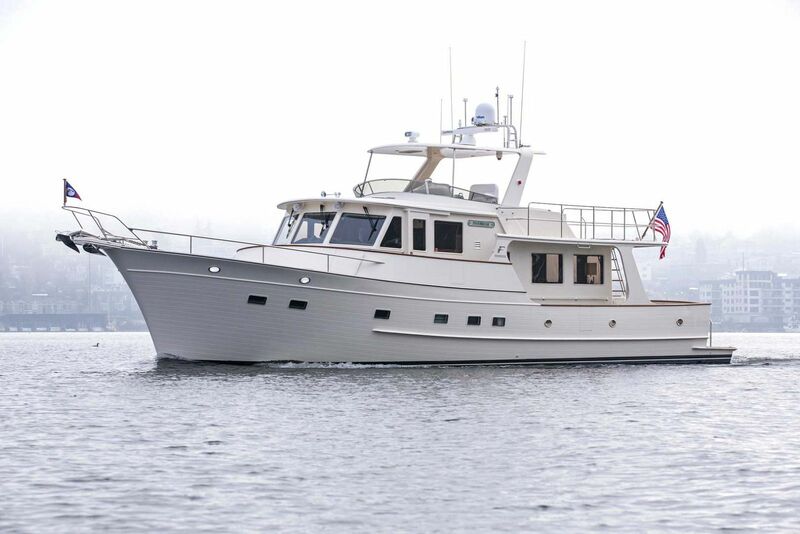 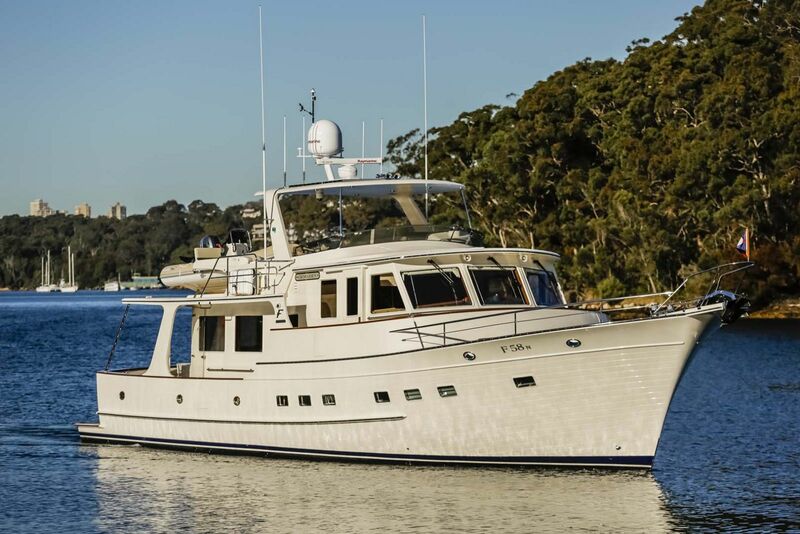 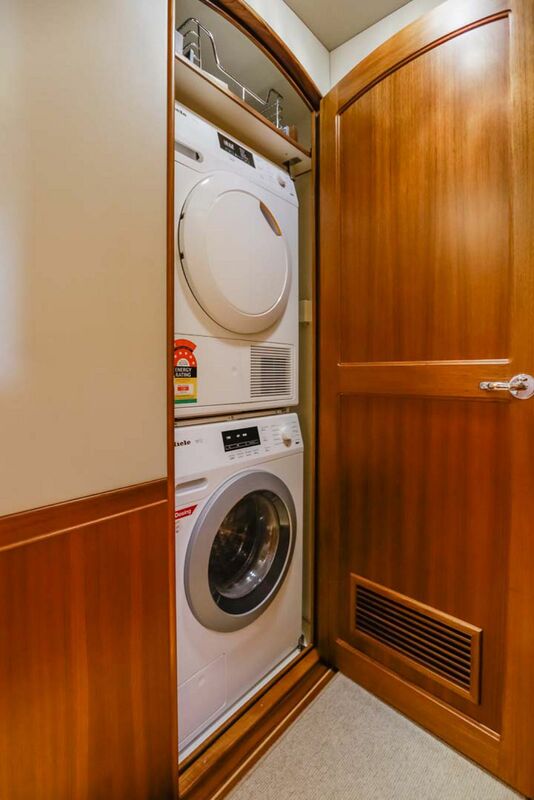 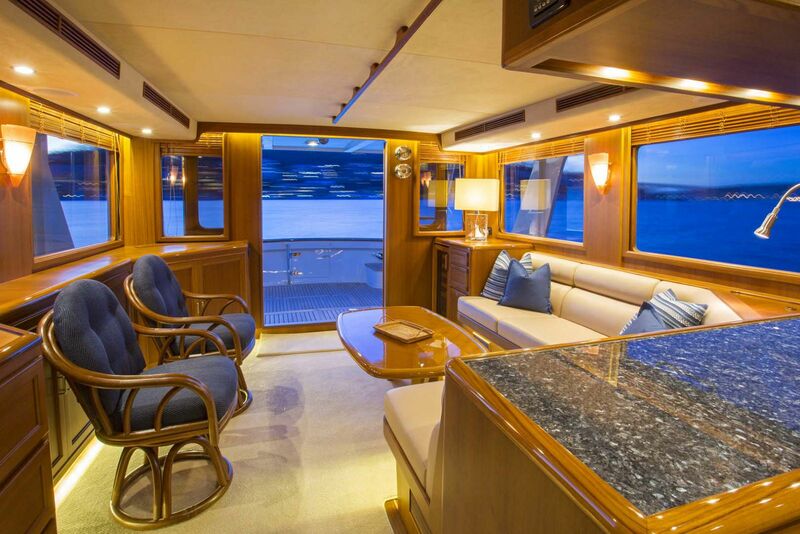 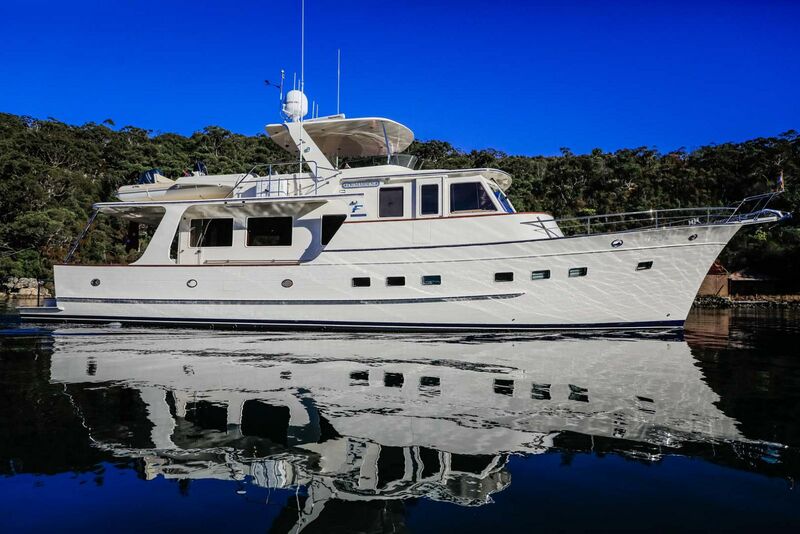 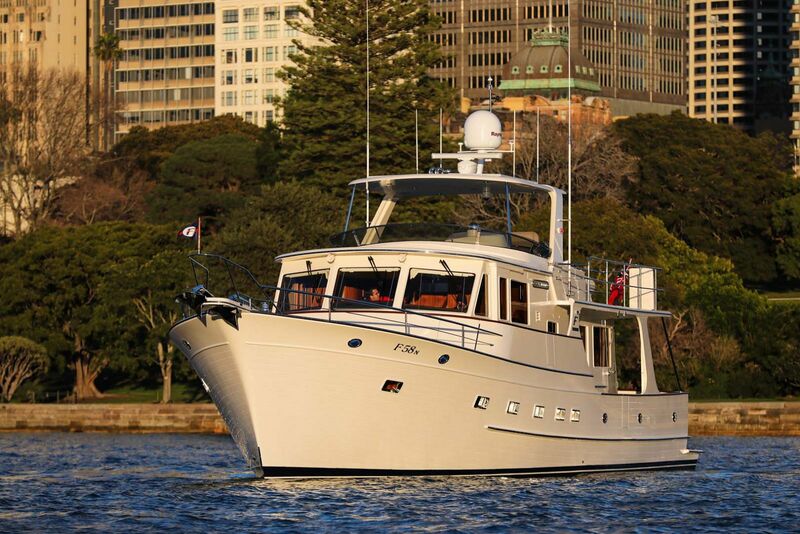 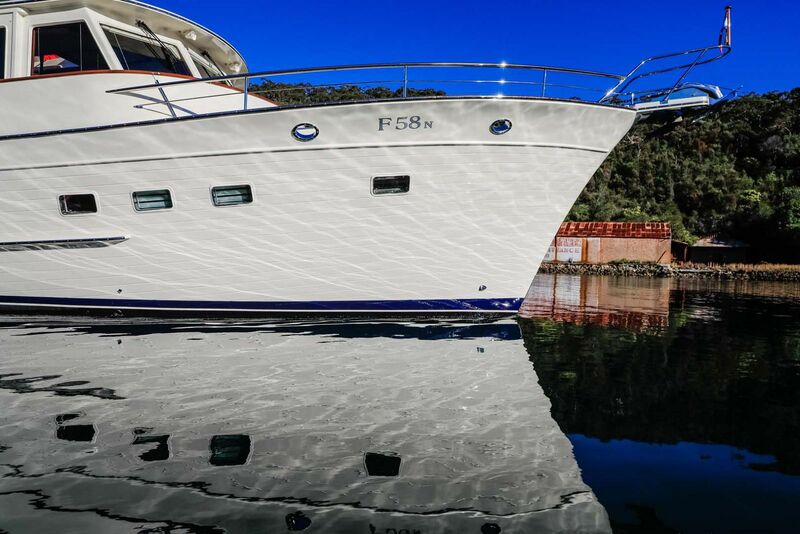 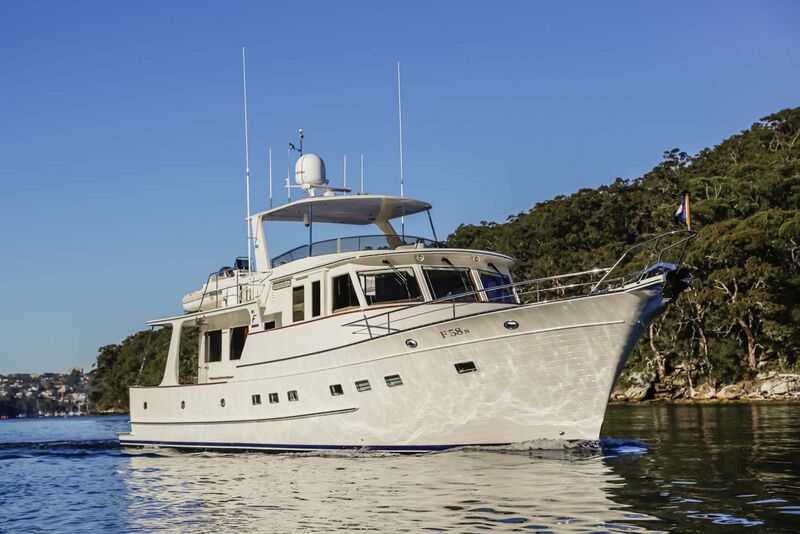 The Fleming 58 is, of course, built at the renowned Tung Hwa yard in Southern Taiwan, where every Fleming ever built has been constructed, starting with Fleming 50 hull 001 in 1985. 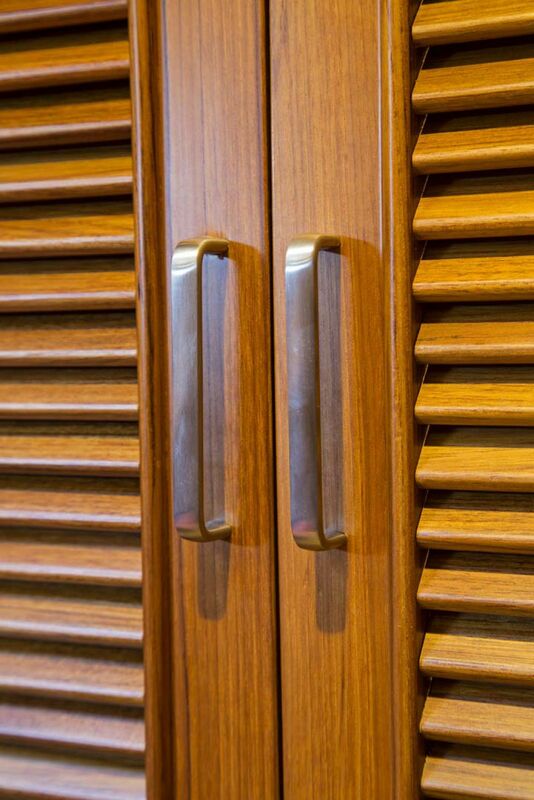 Tung Hwa build exclusively for Fleming and many craftsmen from the early days are still with us. 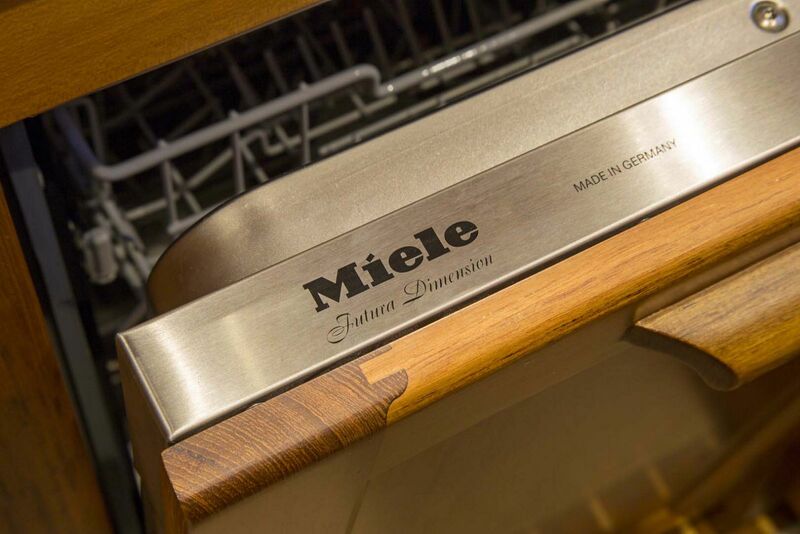 They are very proud of their work and their experience, passion and skill are passed down from one generation to the next.